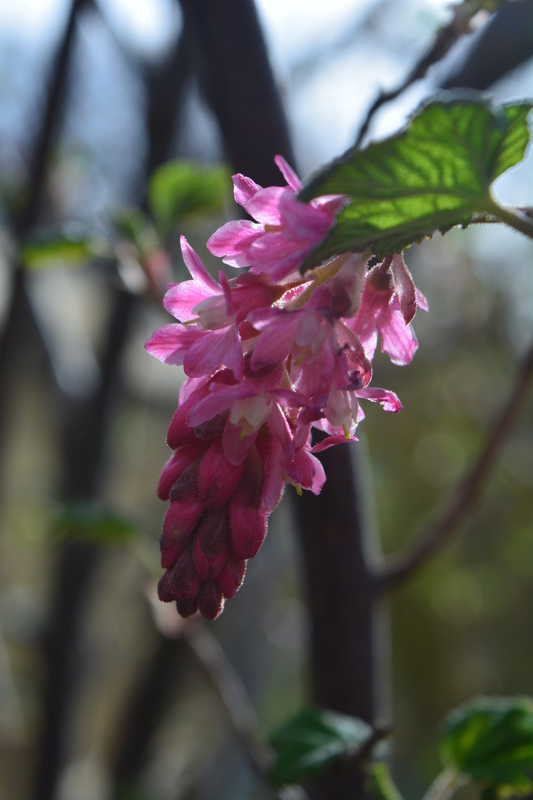 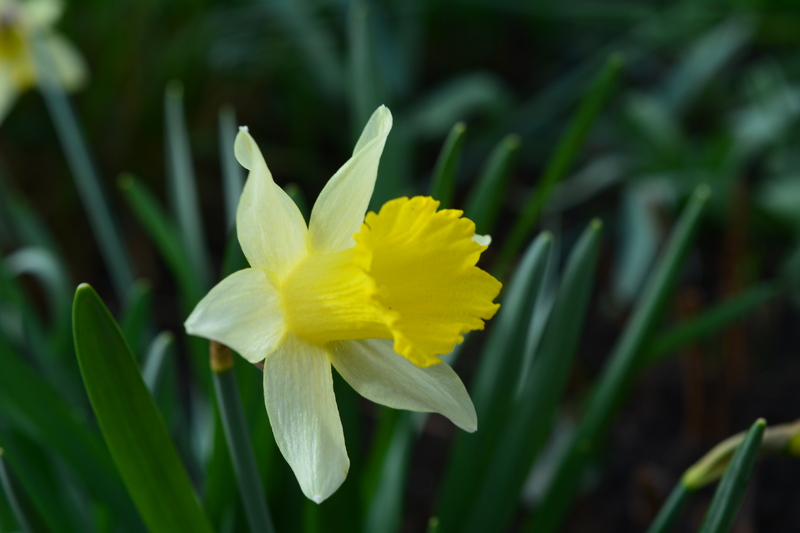 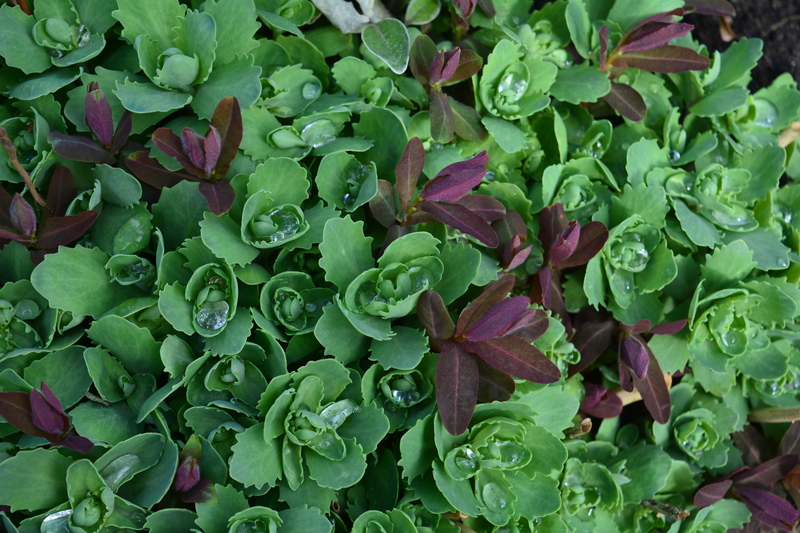 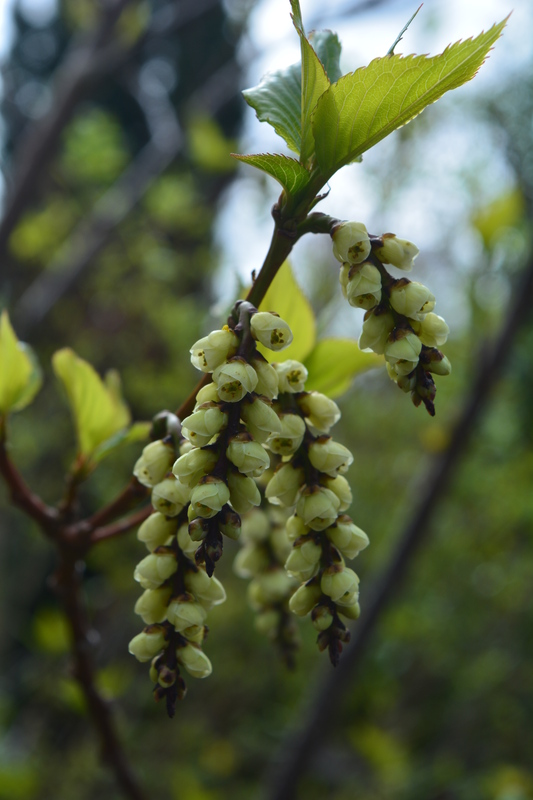 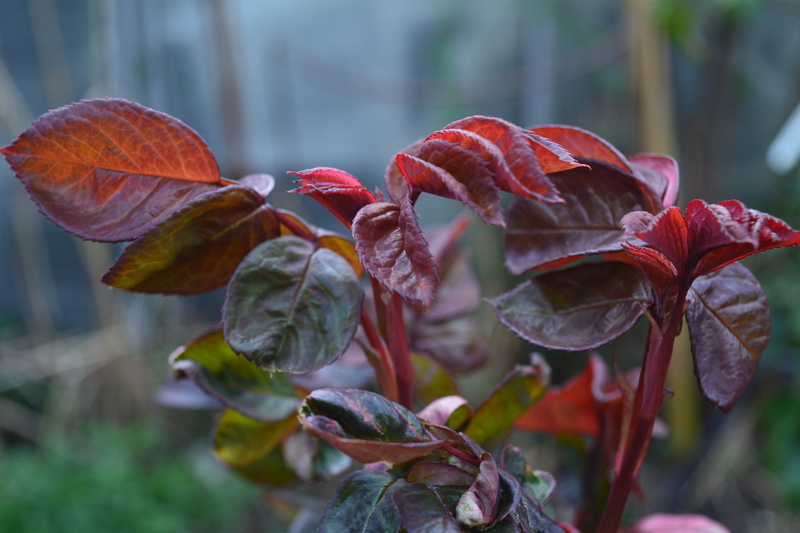 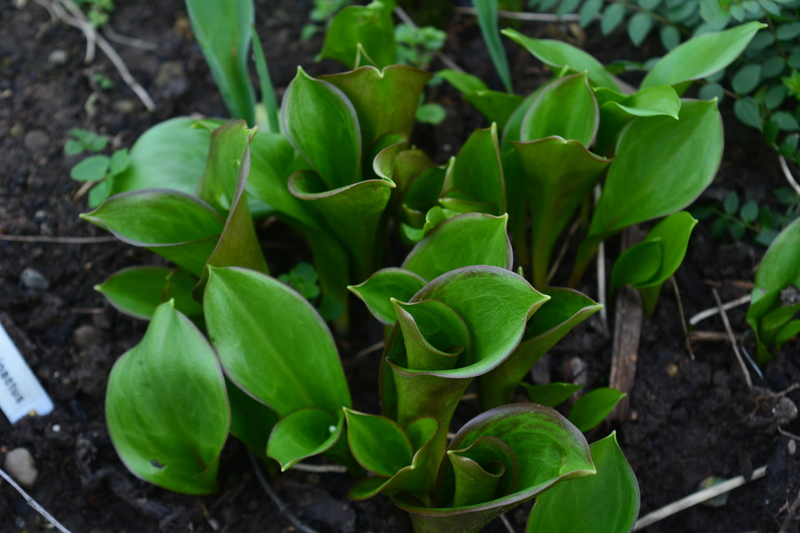 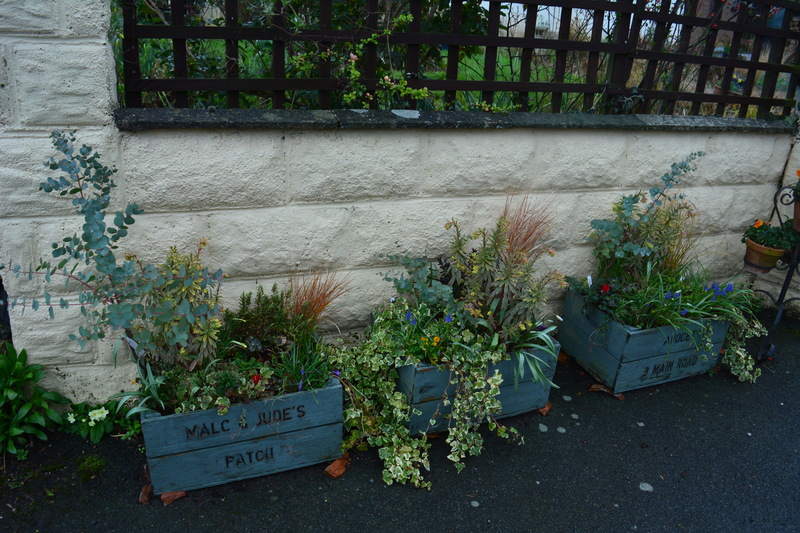 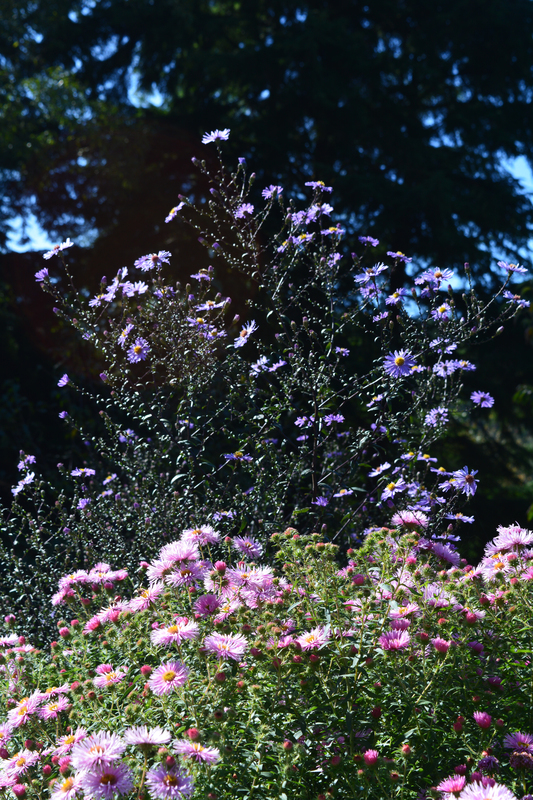 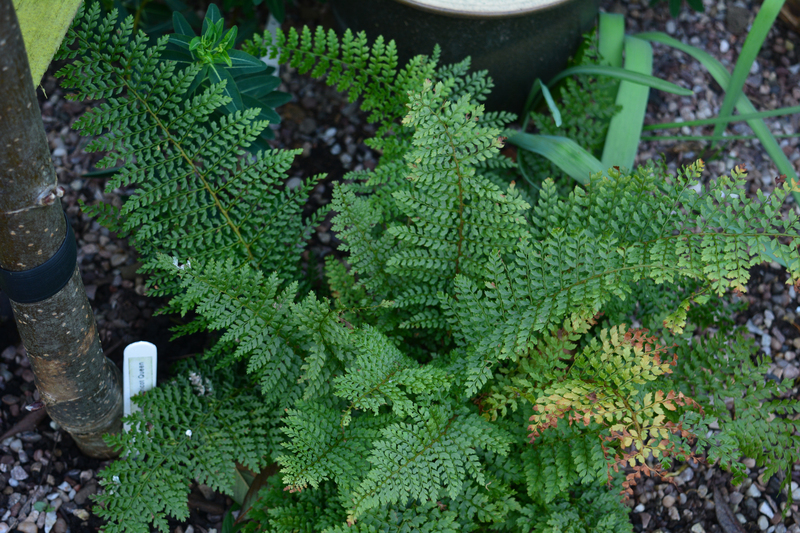 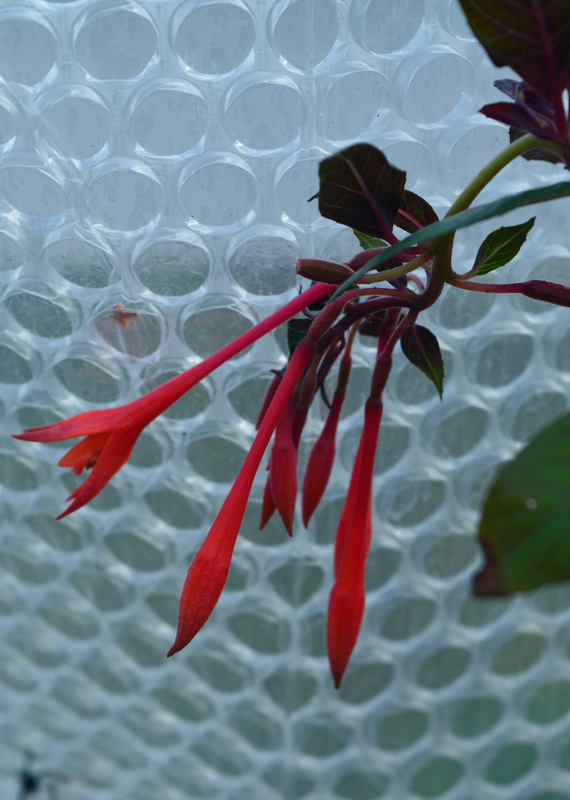 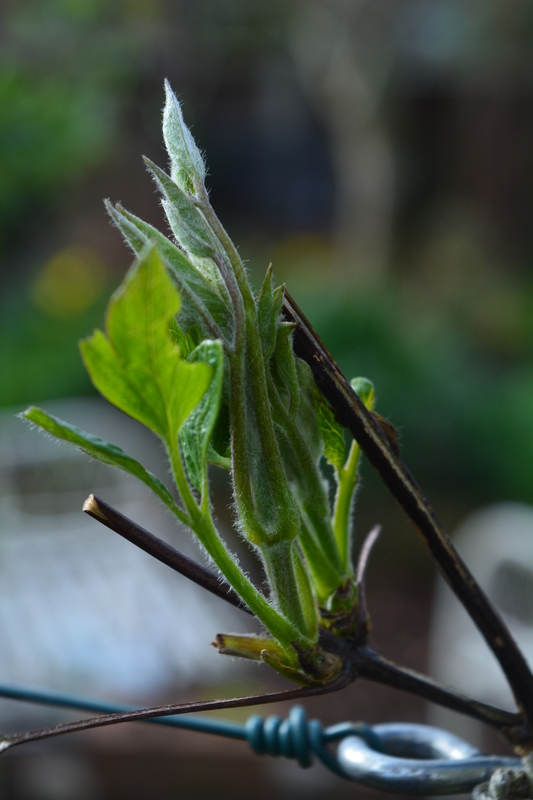 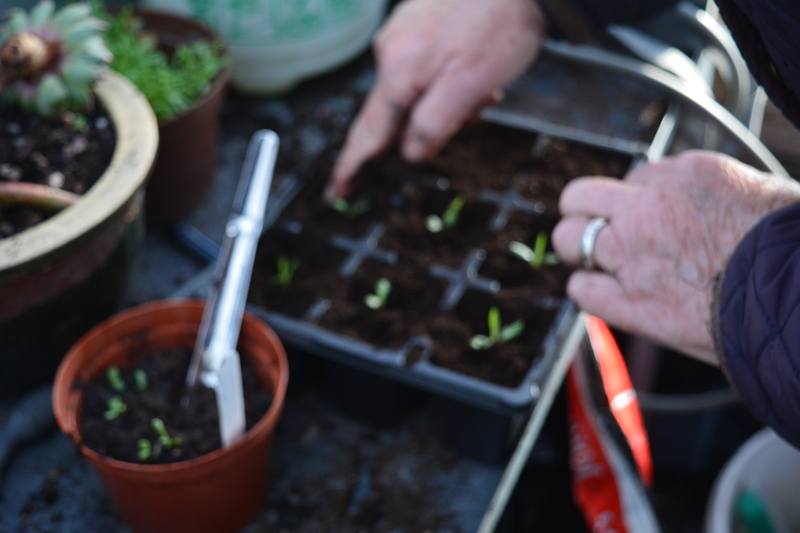 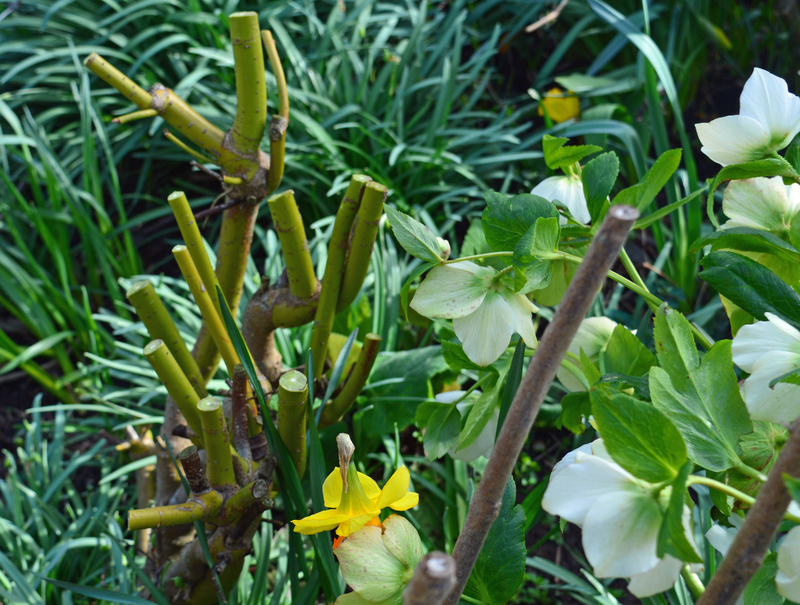 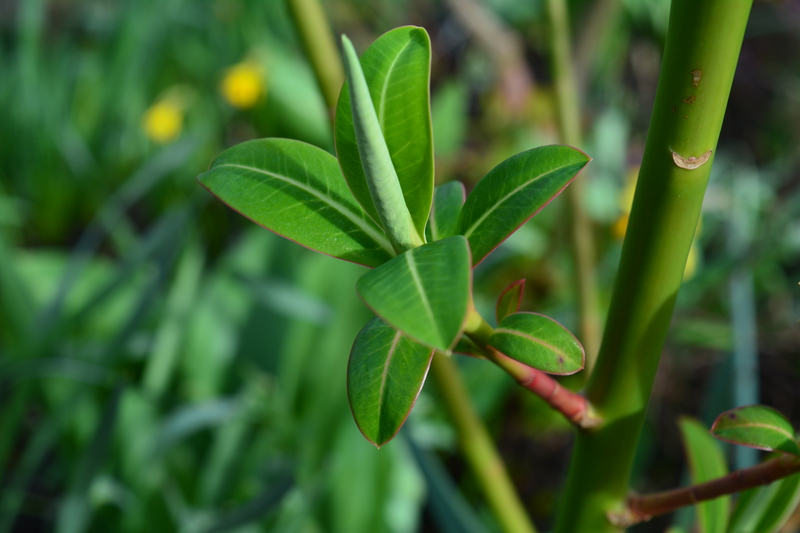 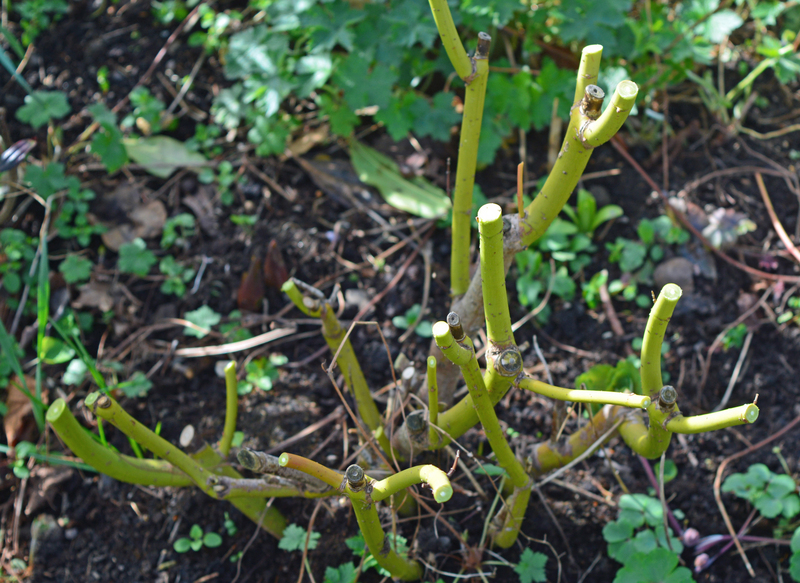 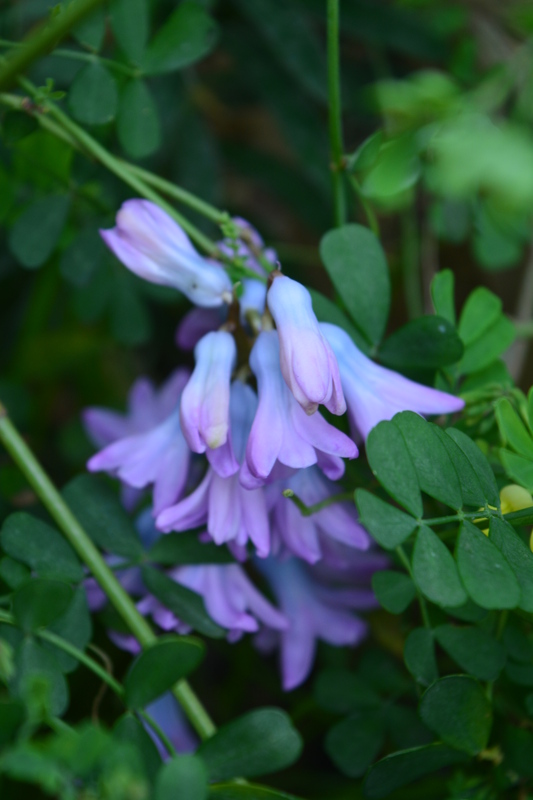 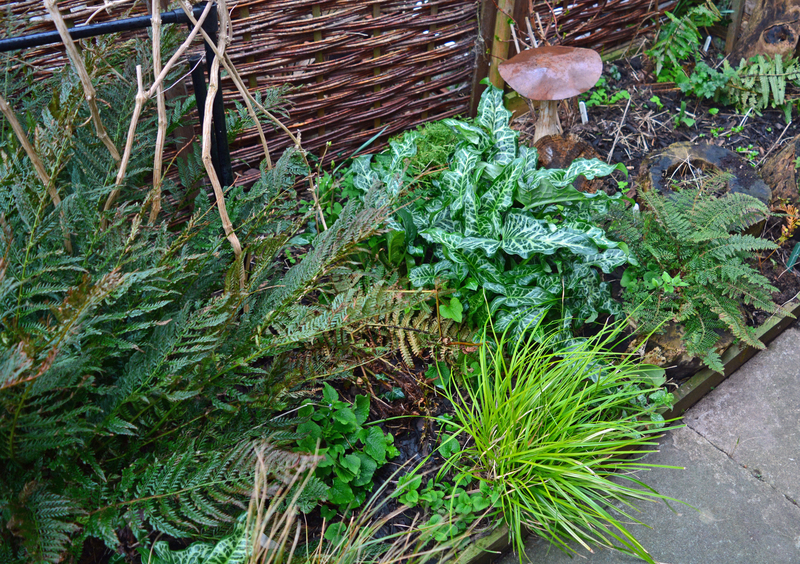 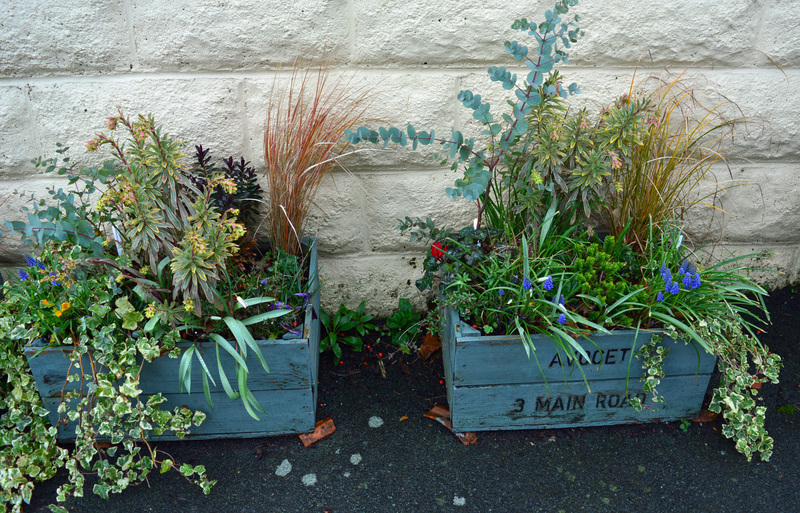 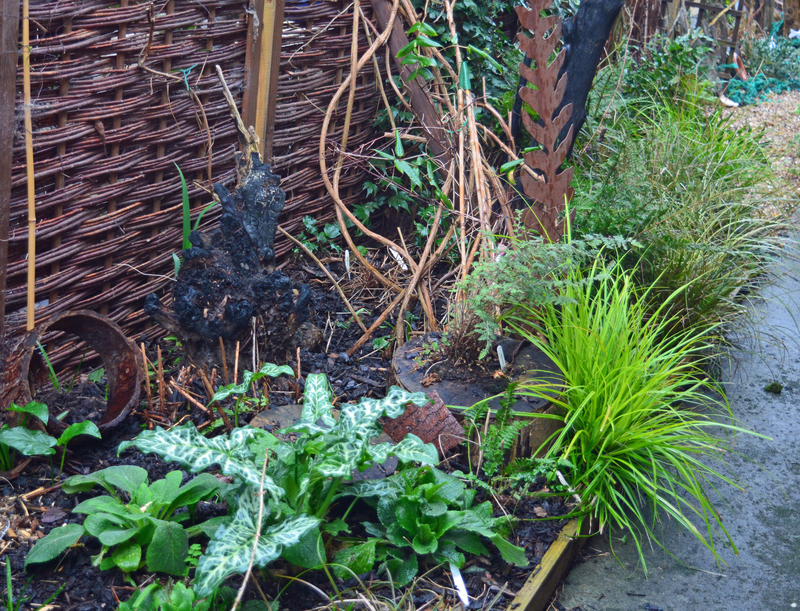 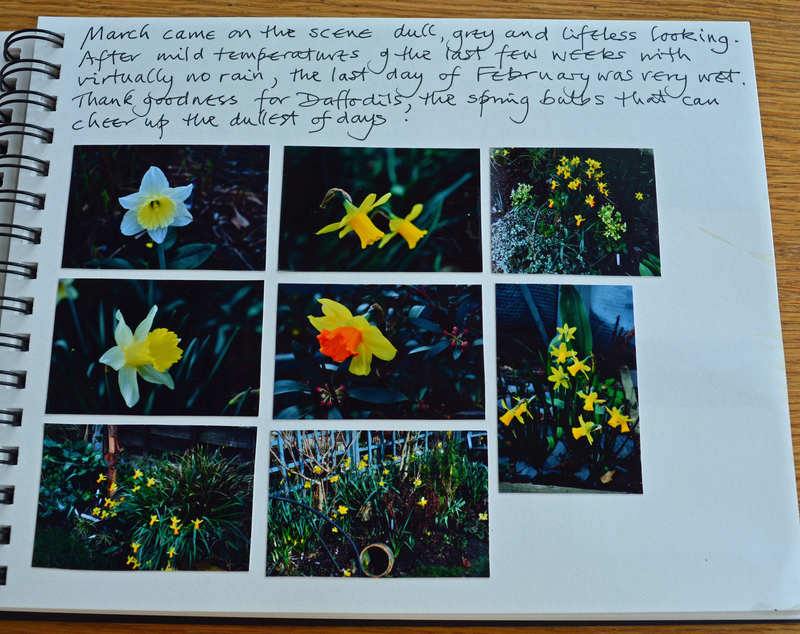 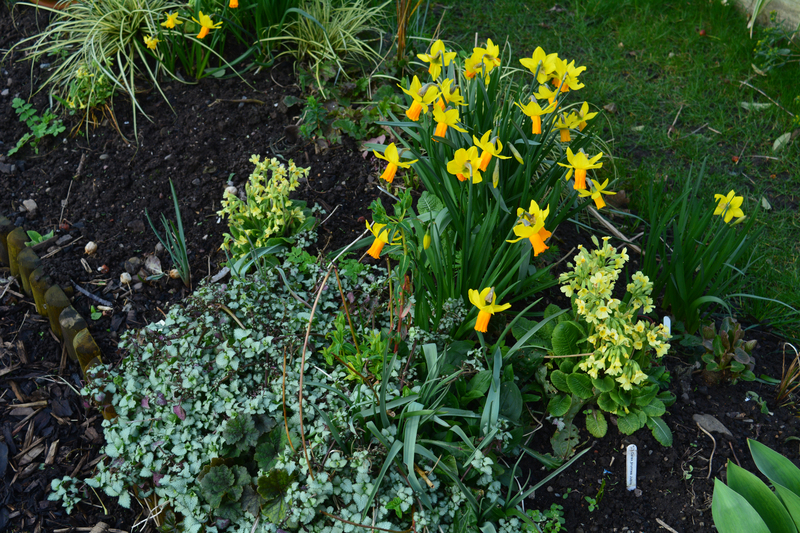 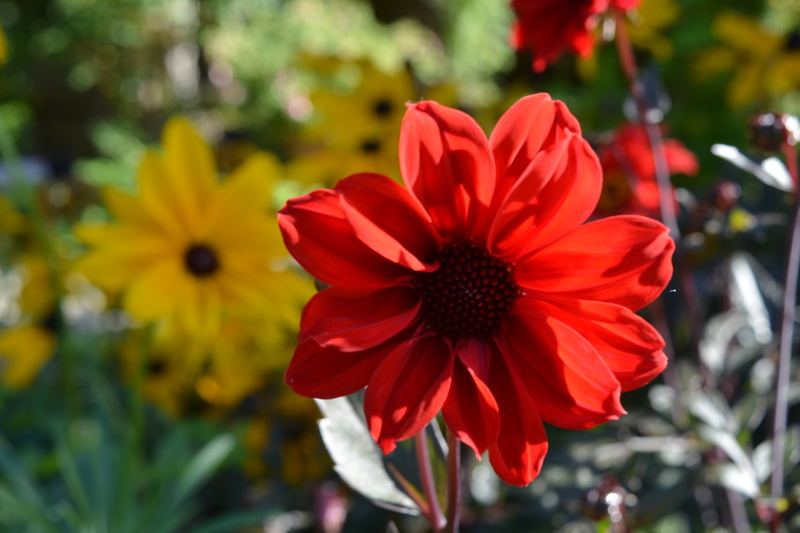 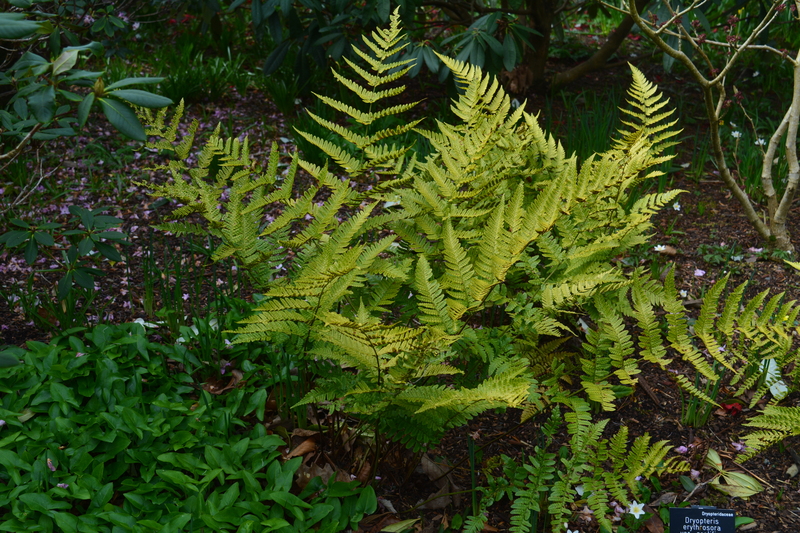 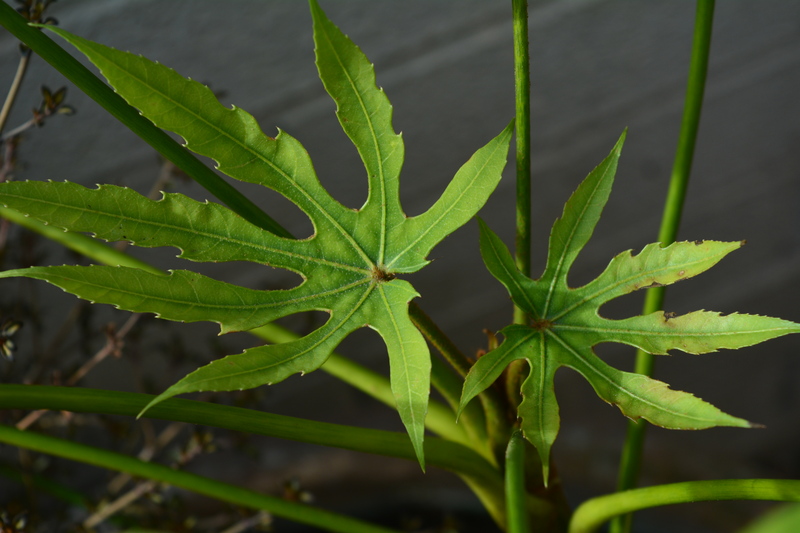 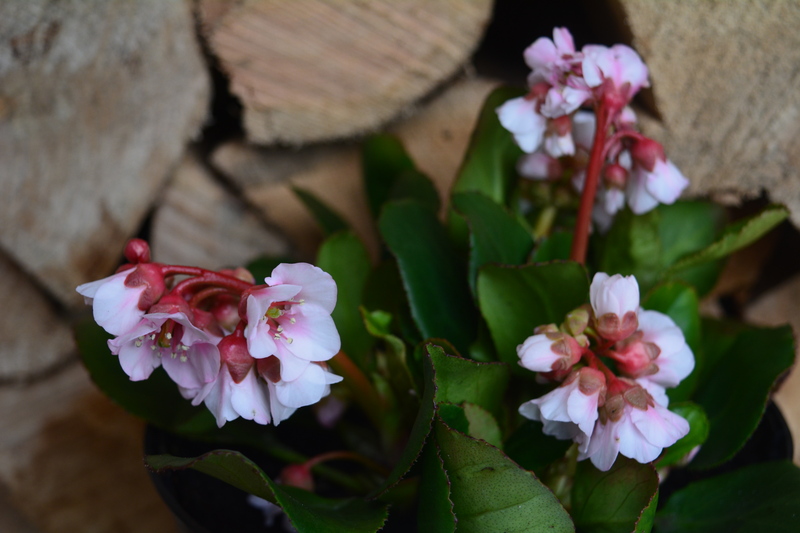 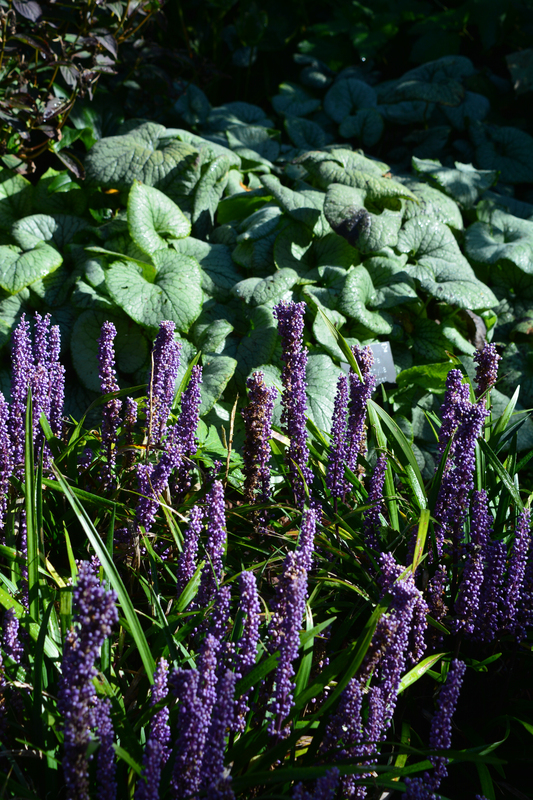 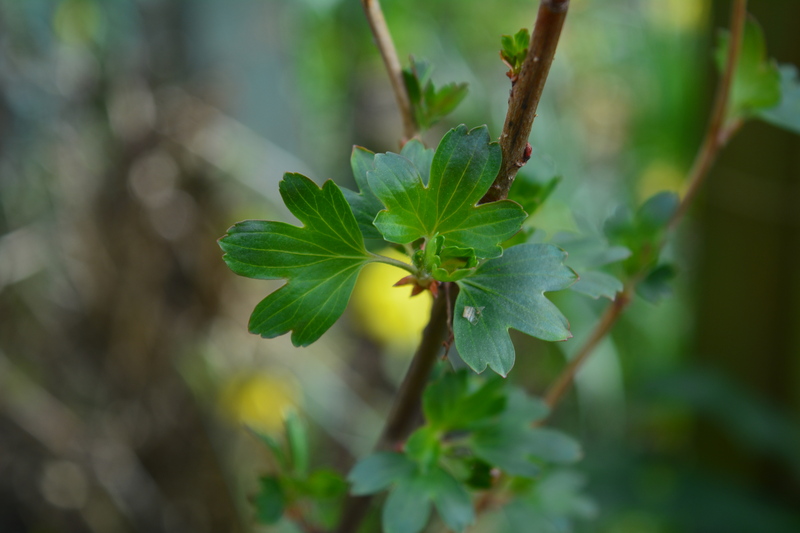 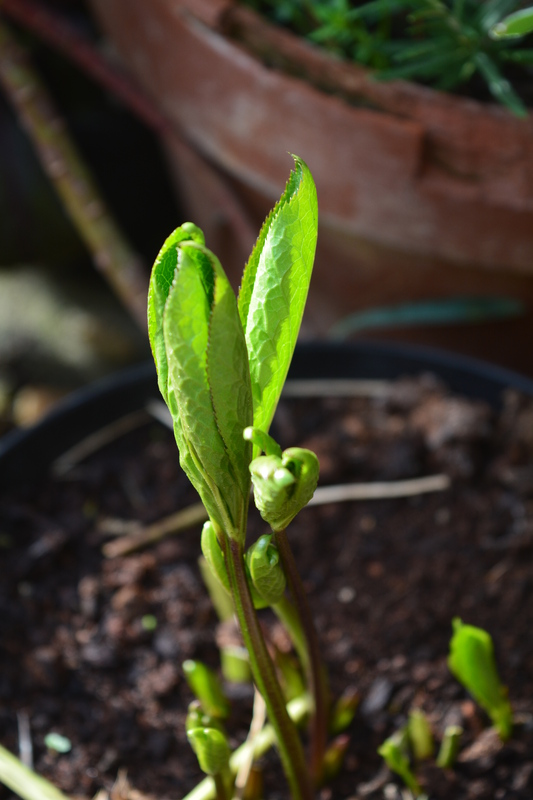 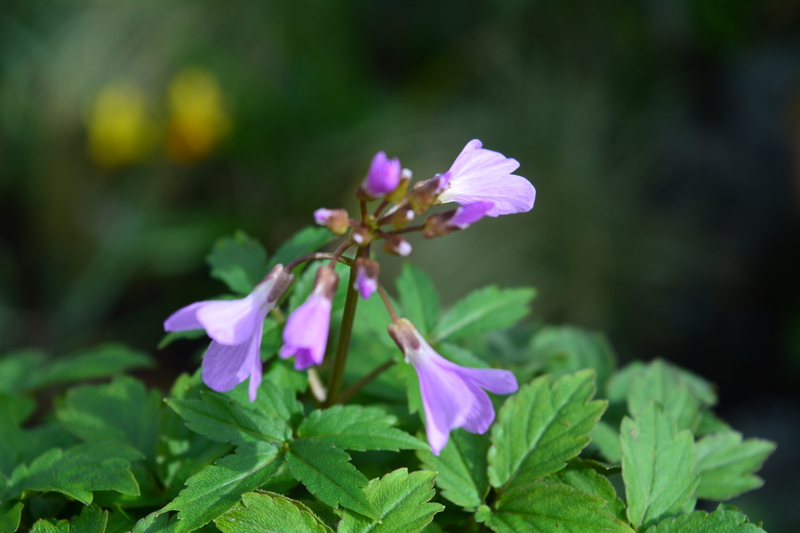 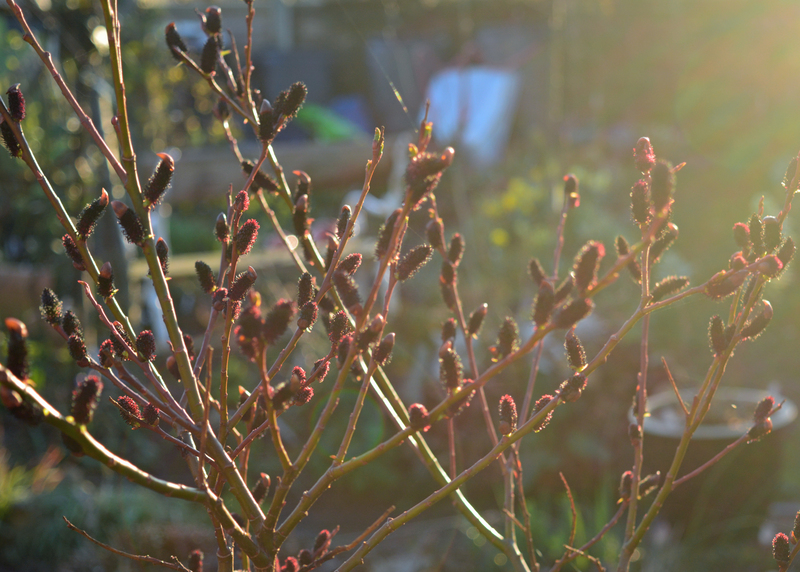 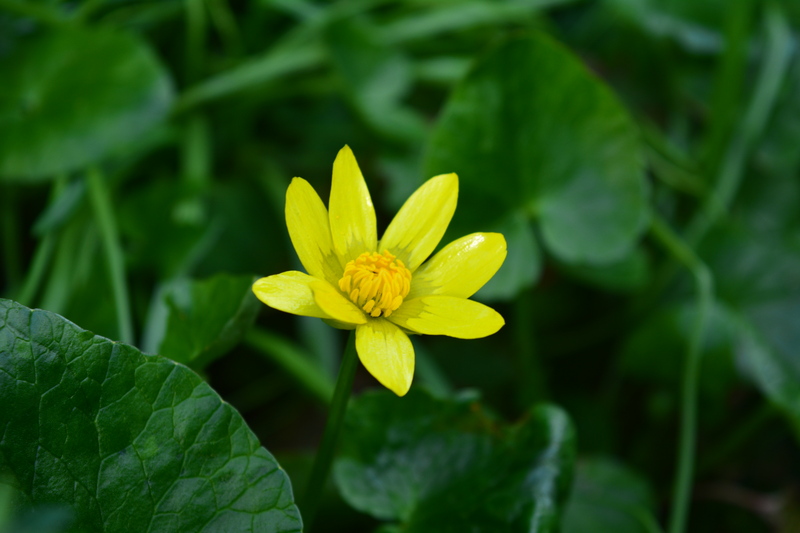 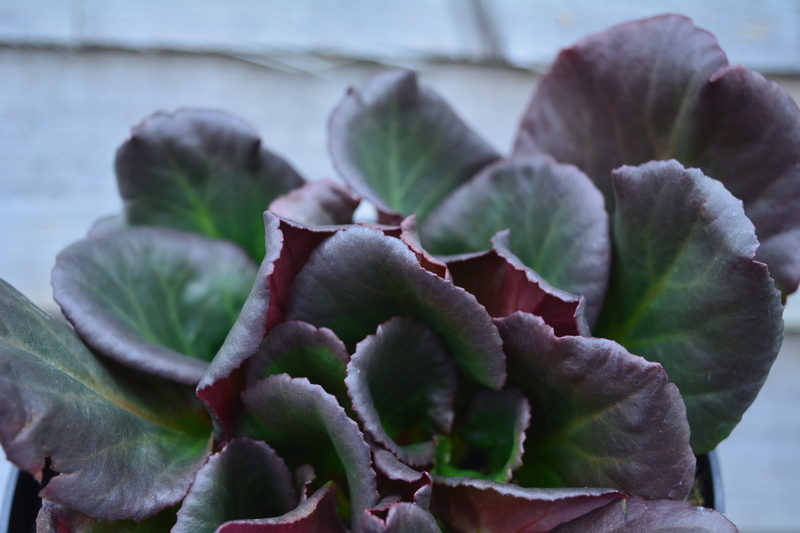 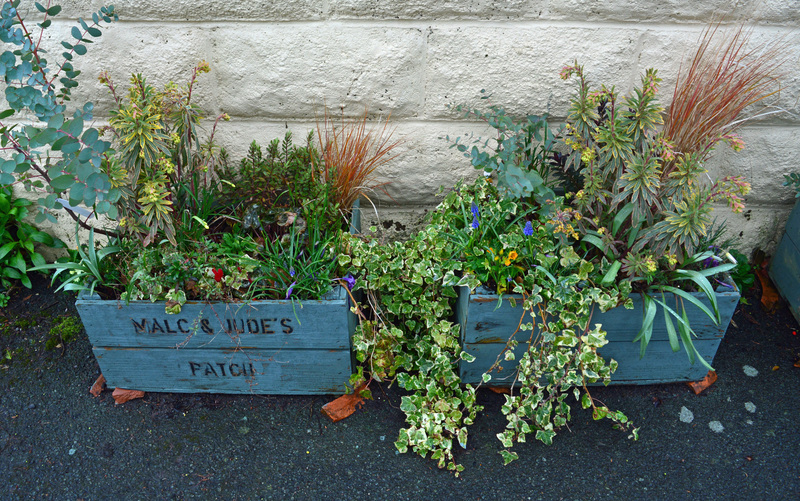 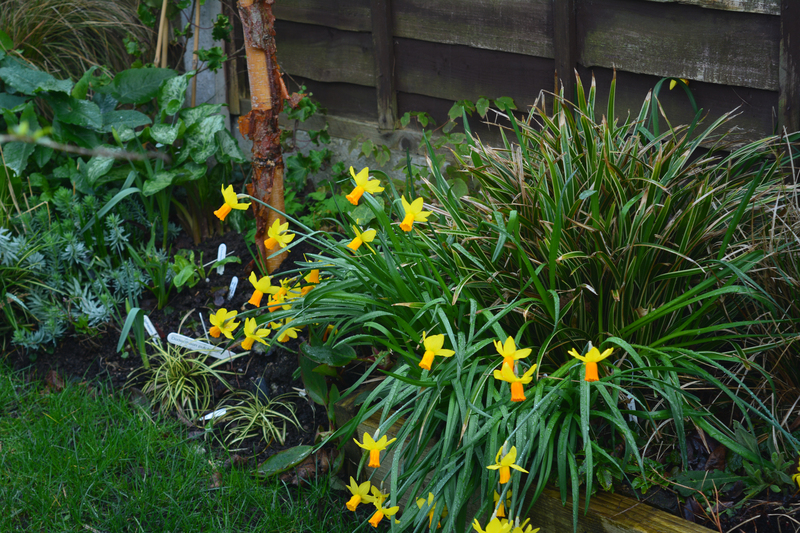 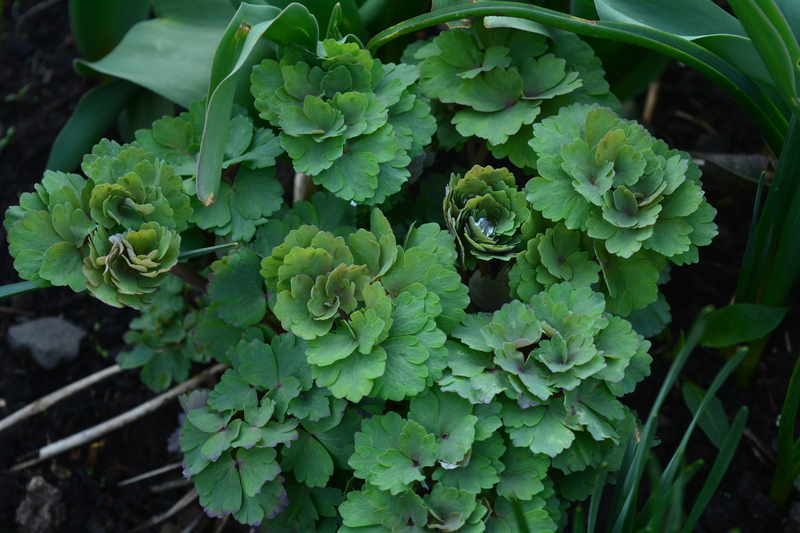 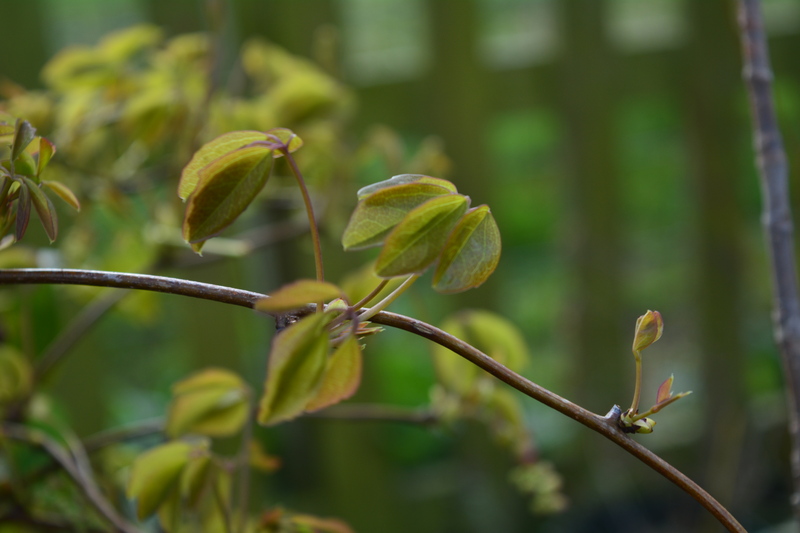 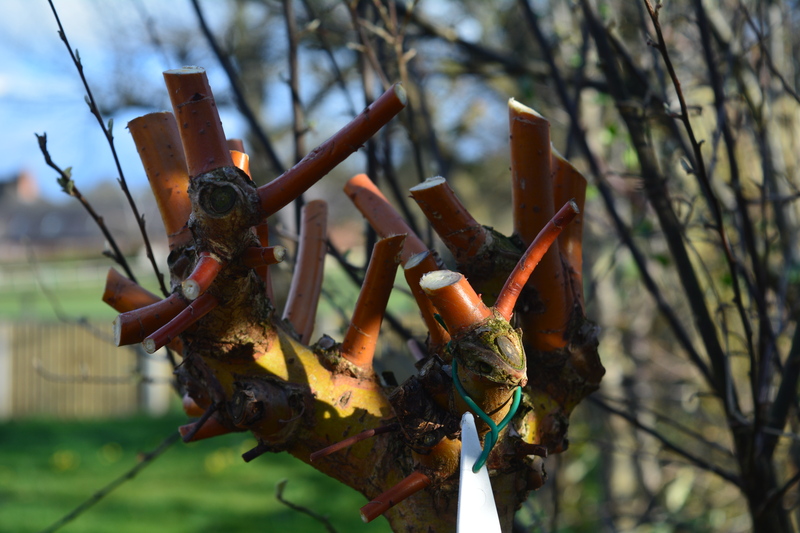 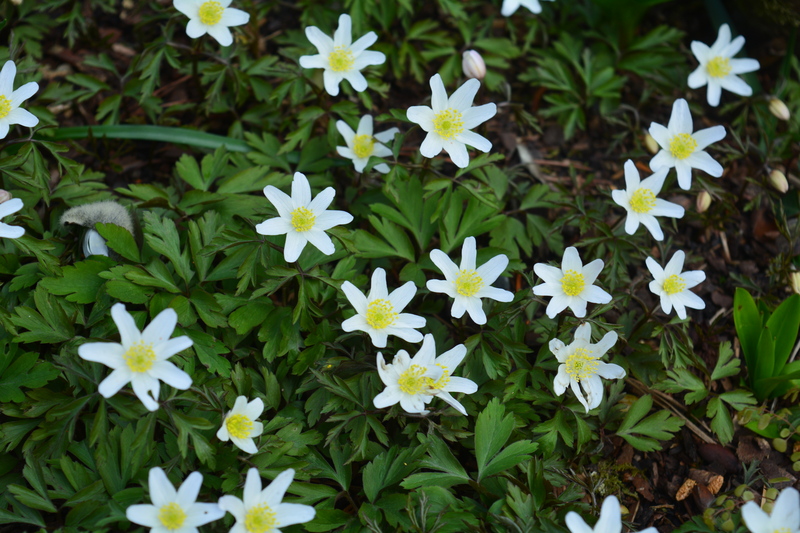 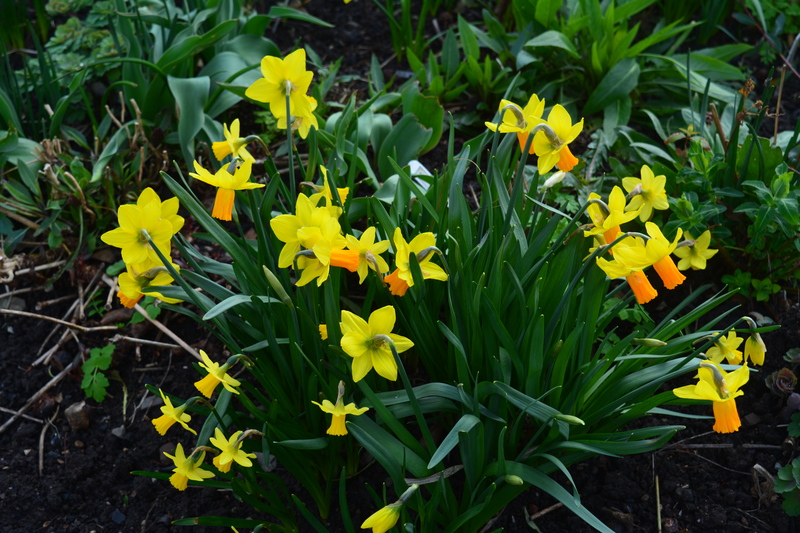 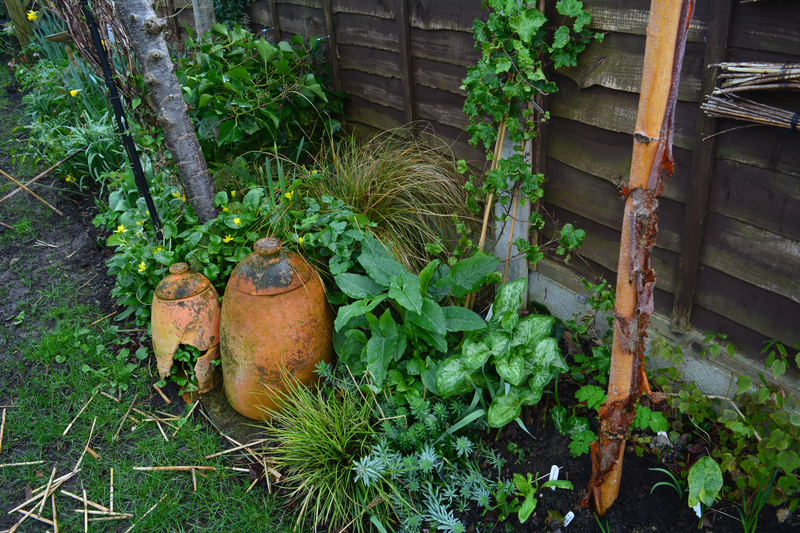 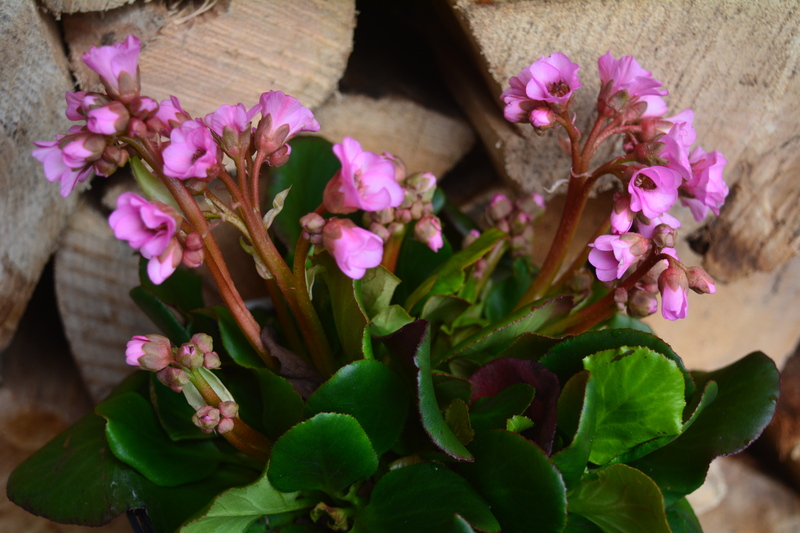 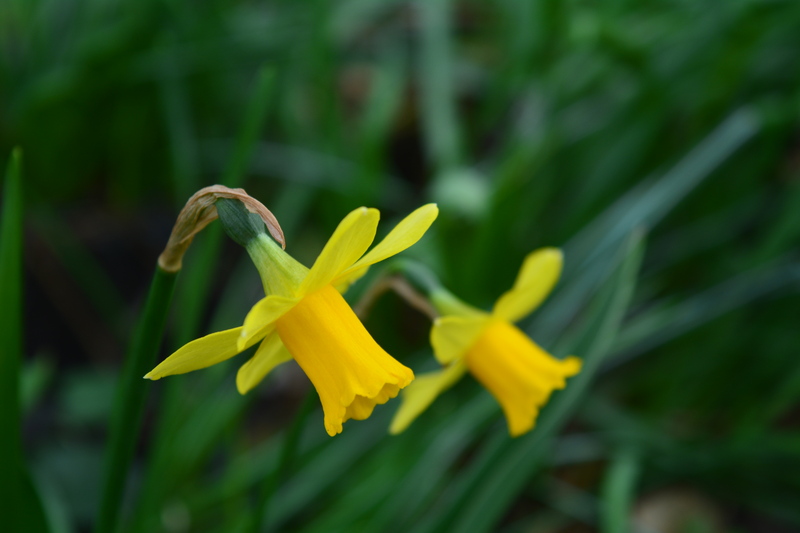 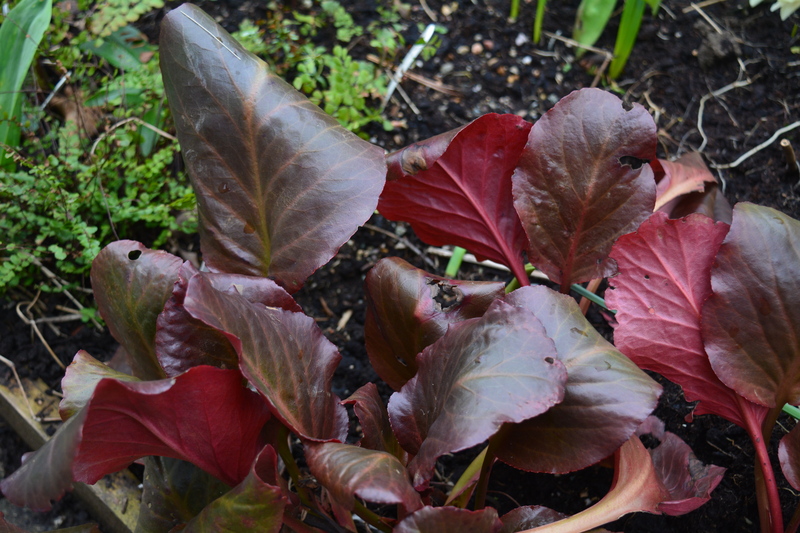 greenbenchramblings | Musings about gardening, the natural world and things creative. 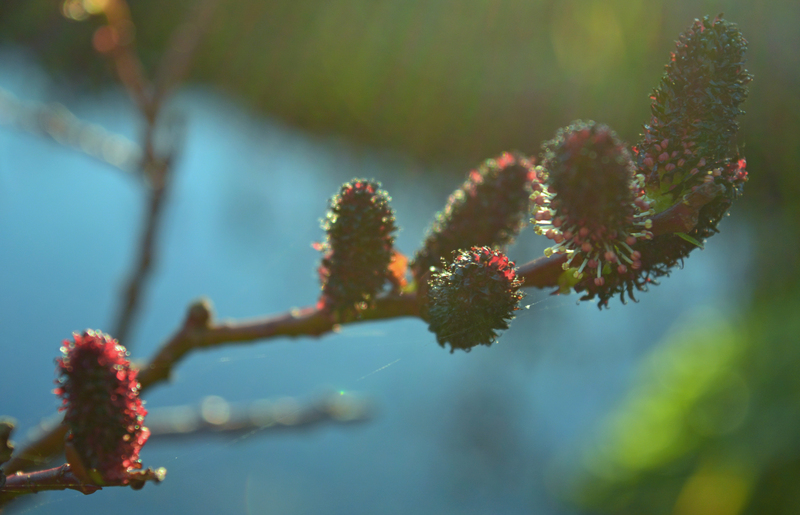 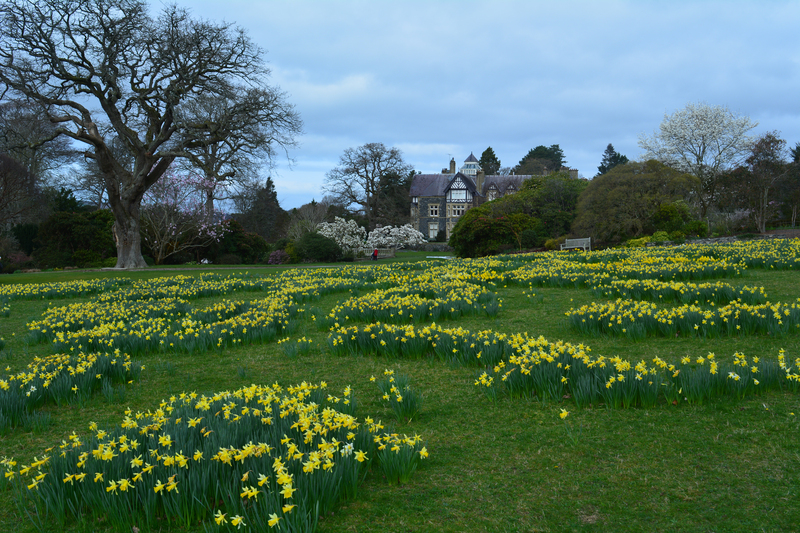 I promised a few reports on our planned visits to Bodnant Garden in North Wales so we are pleased to share our visit in early spring, a day with the most perfect weather possible to make our exploration a good one. 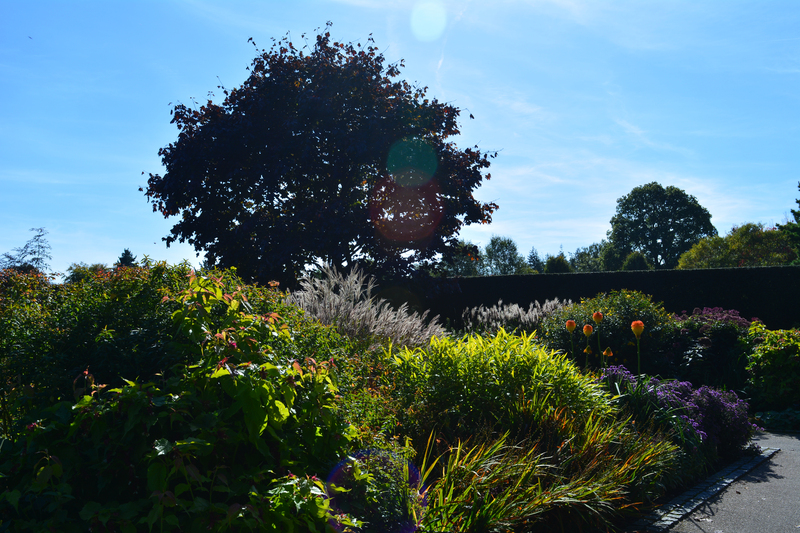 Warm, calm and blue skies! 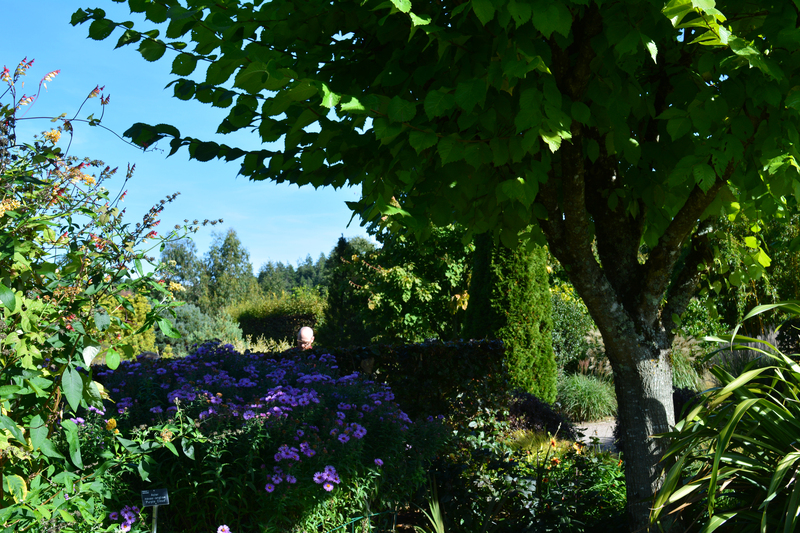 We stayed over nearby to make sure we had time to wander slowly around this large garden at a leisurely pace, the only way to appreciate a garden so full of interesting plants. 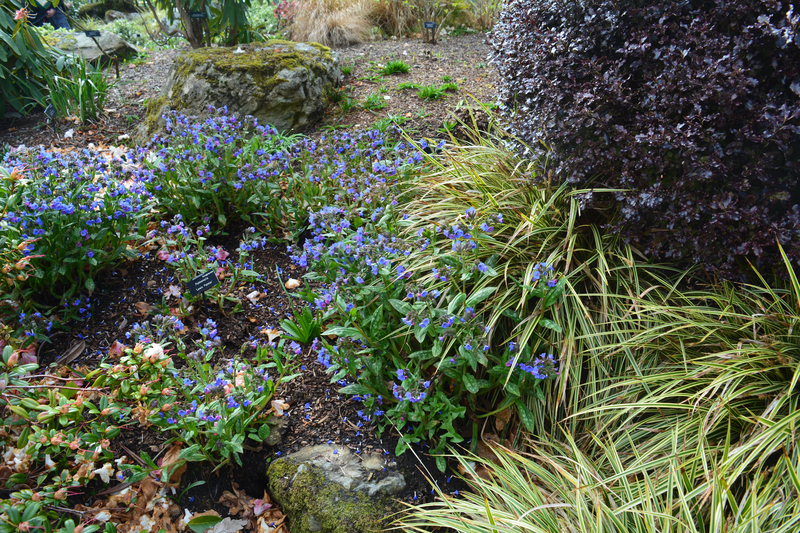 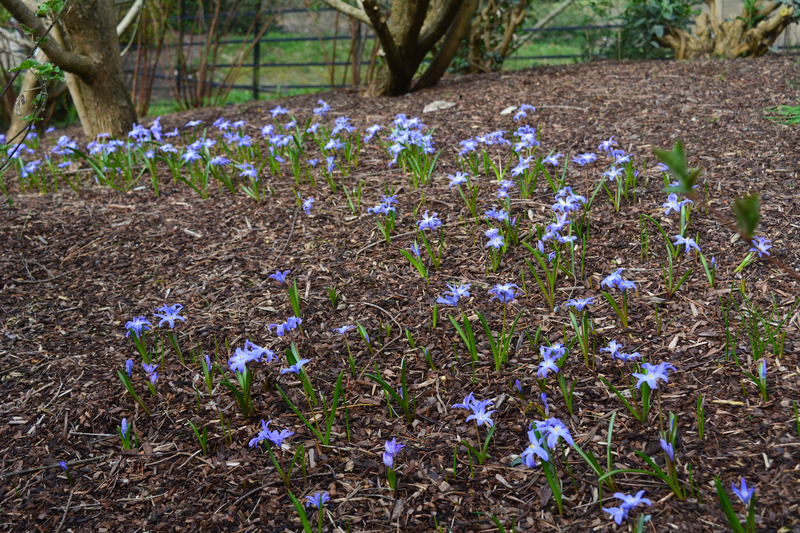 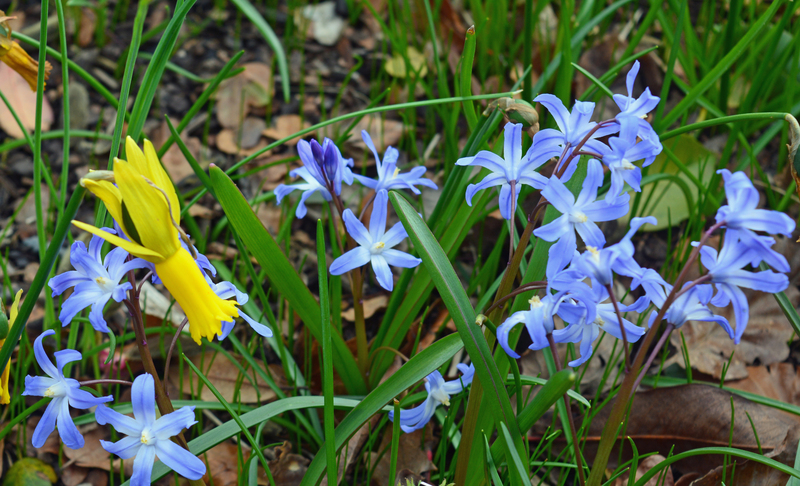 After parking up we soon spotted a bank of little blue bulbs which we thought were possibly Scilla. 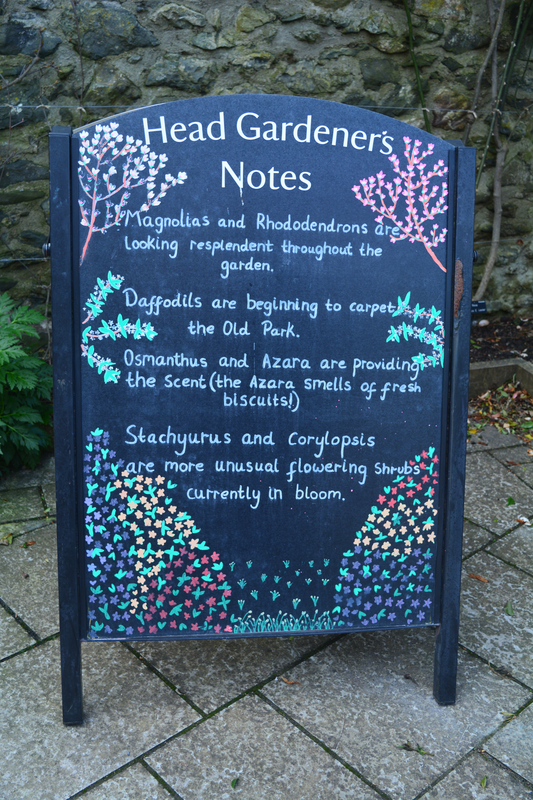 As we entered the garden itself we came across this informative and attractive sign prepared by the head gardener giving us ideas of what was looking good in the garden. 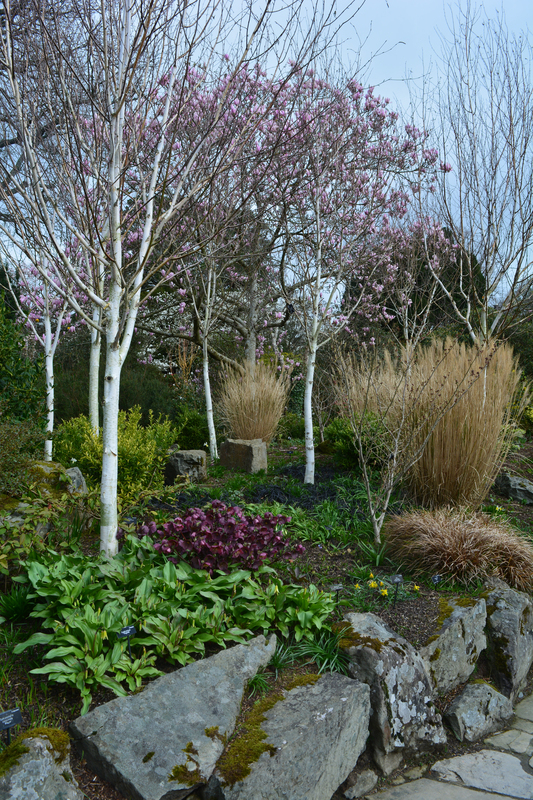 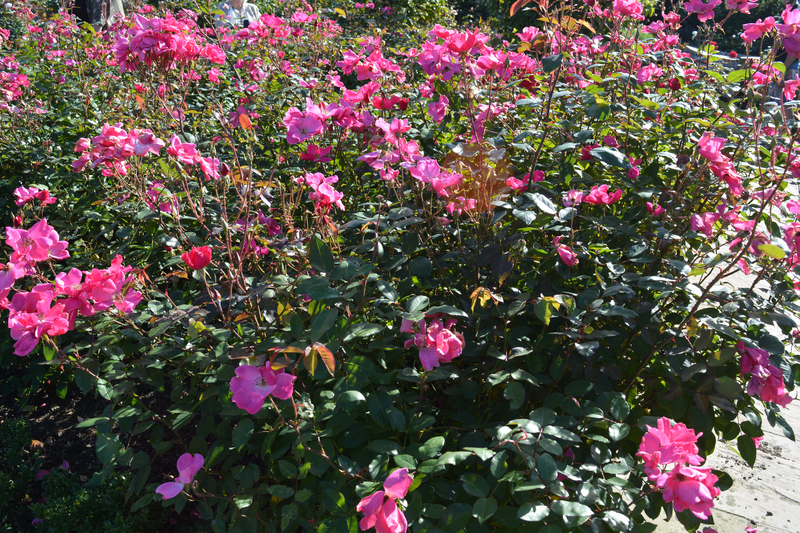 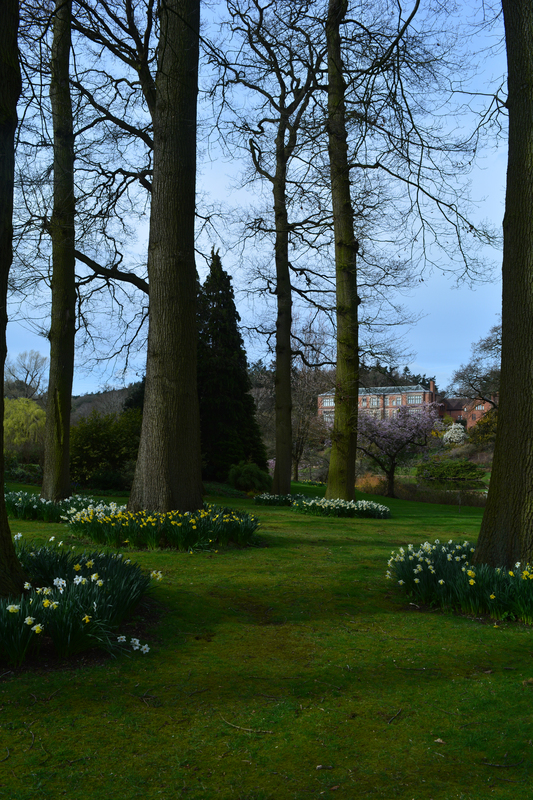 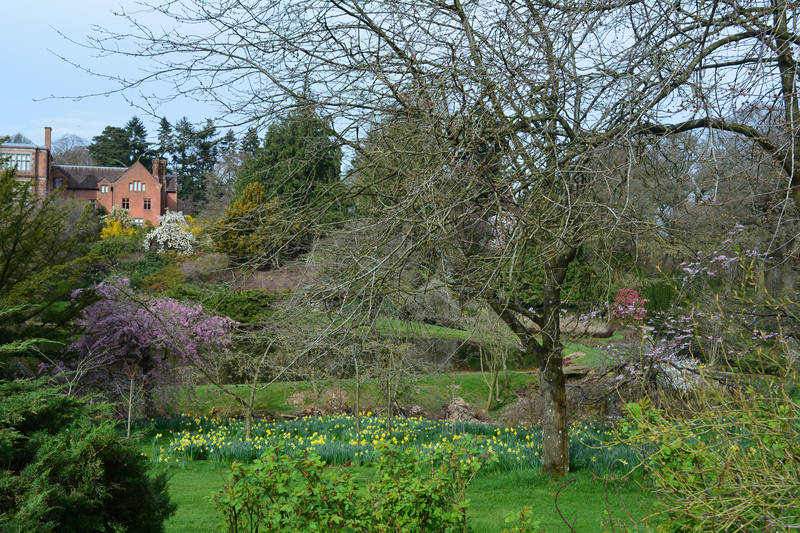 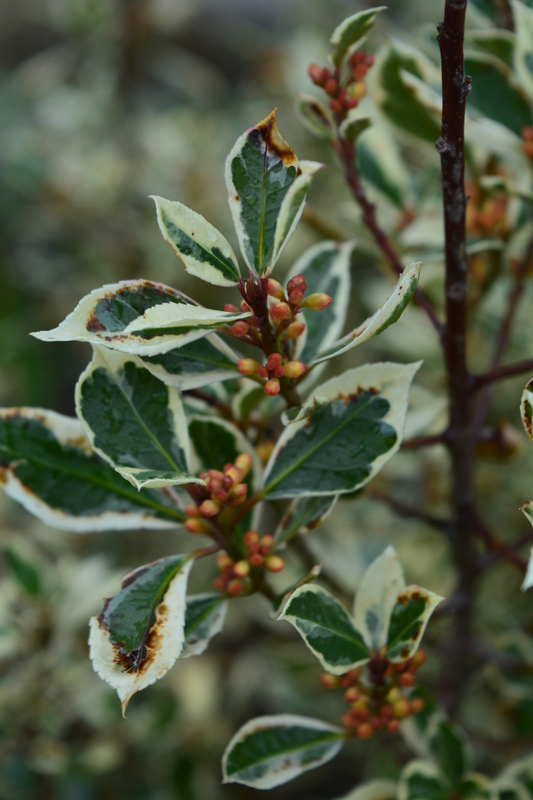 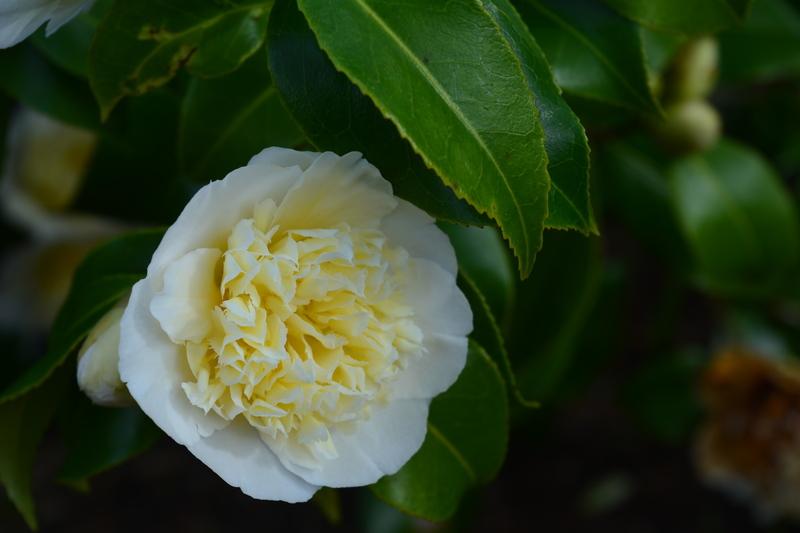 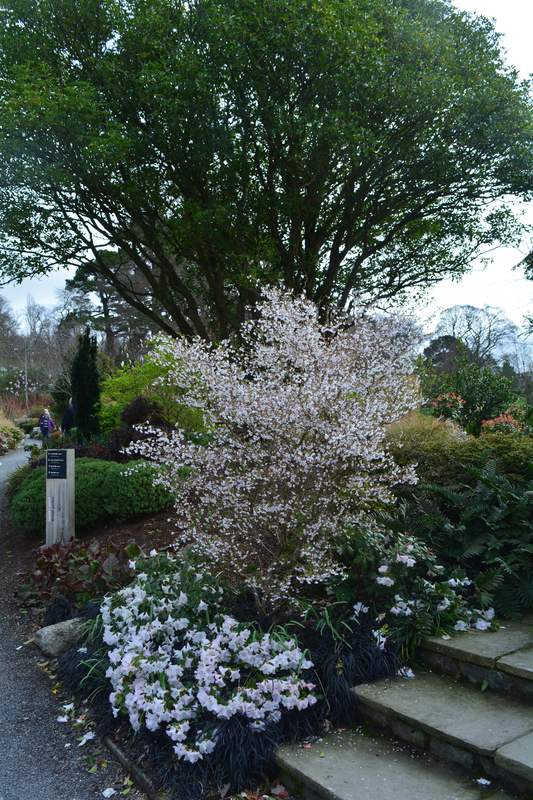 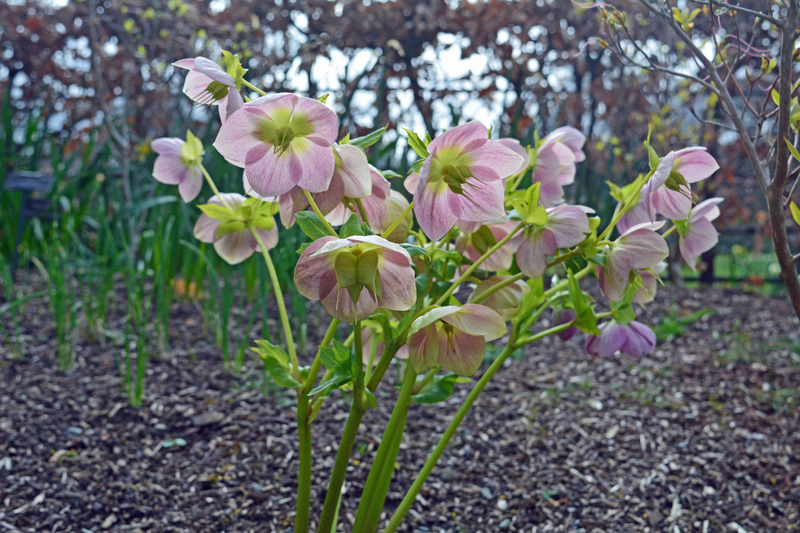 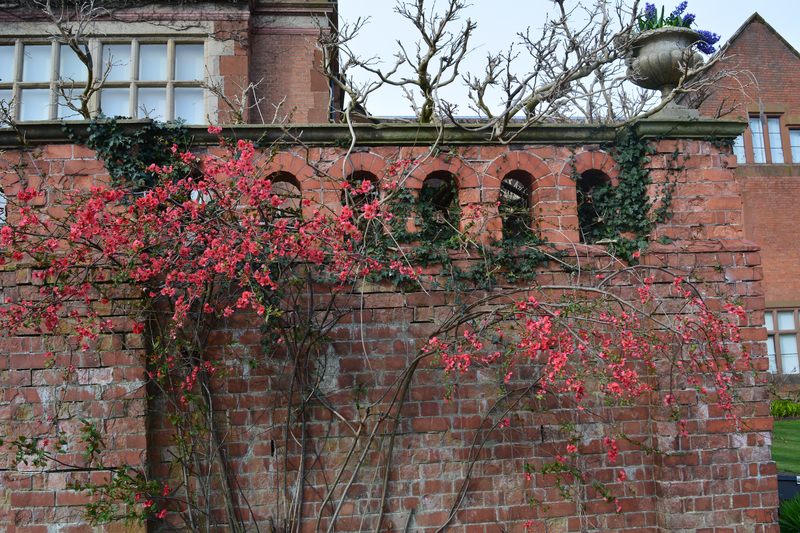 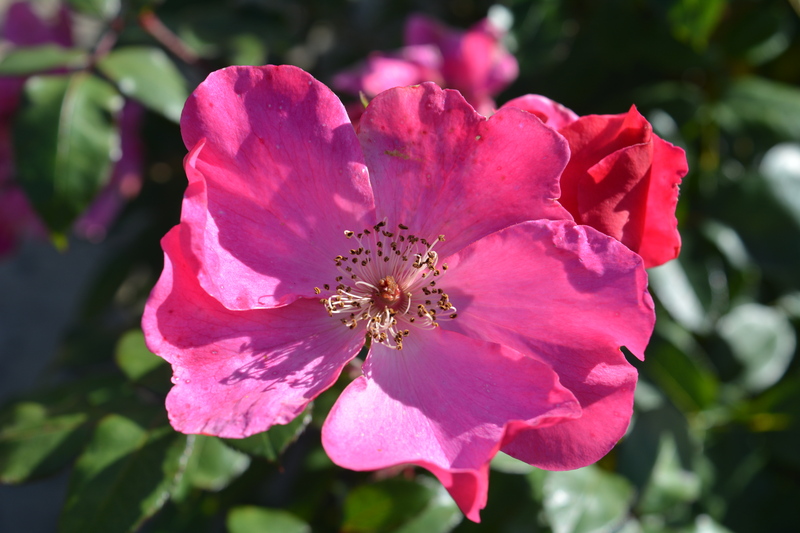 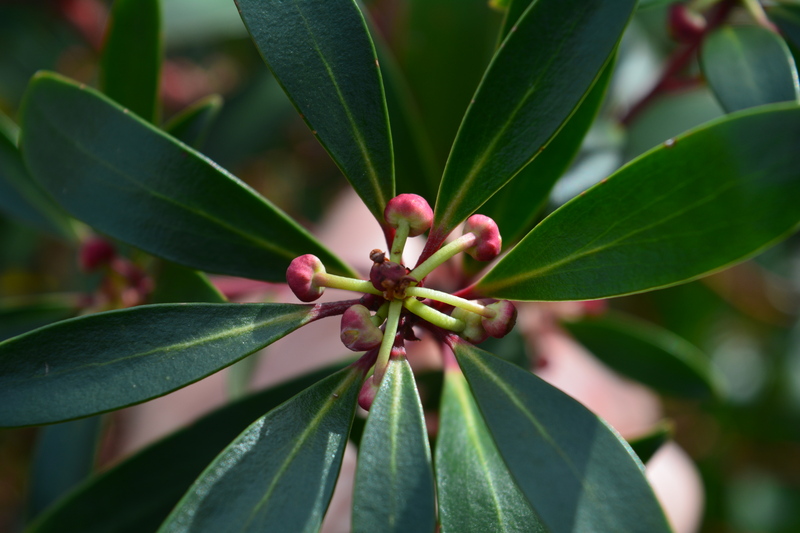 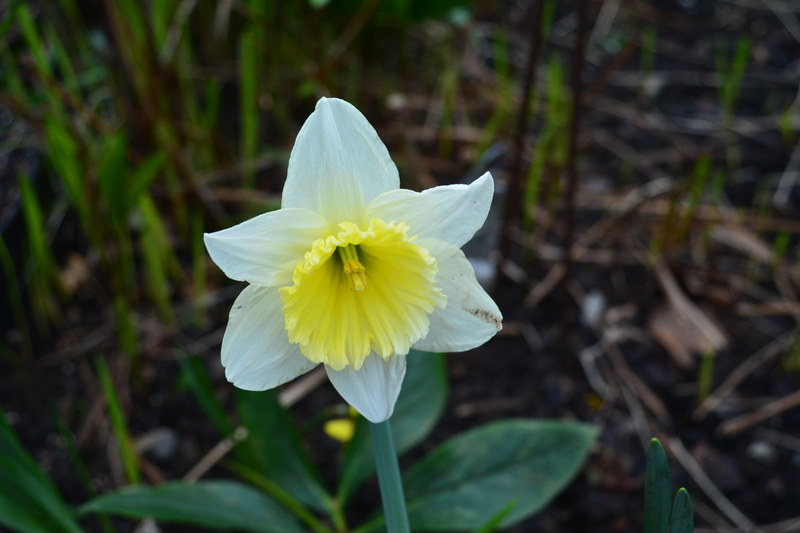 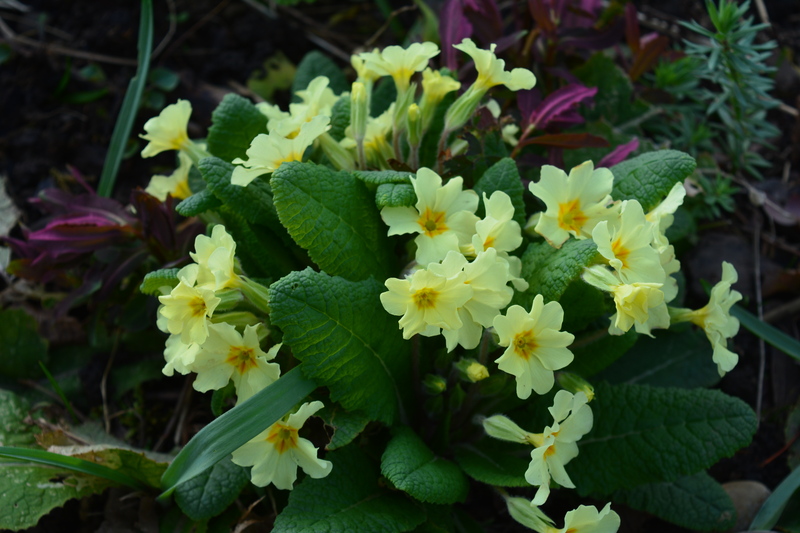 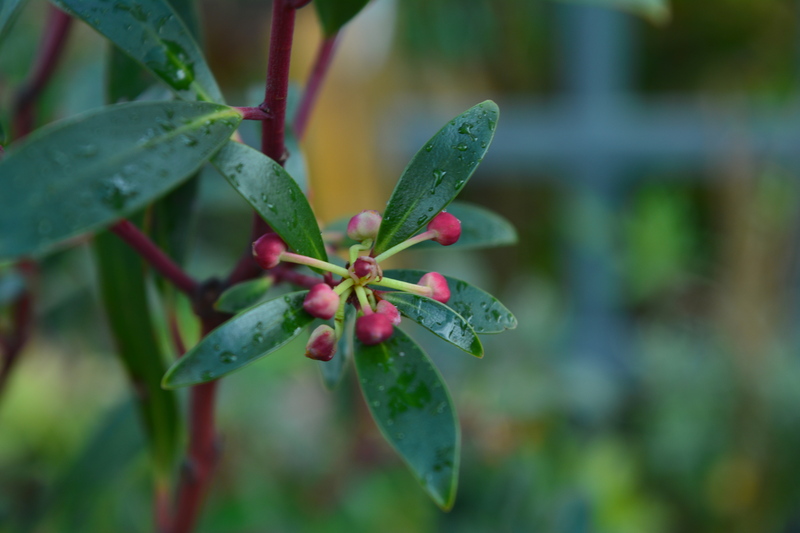 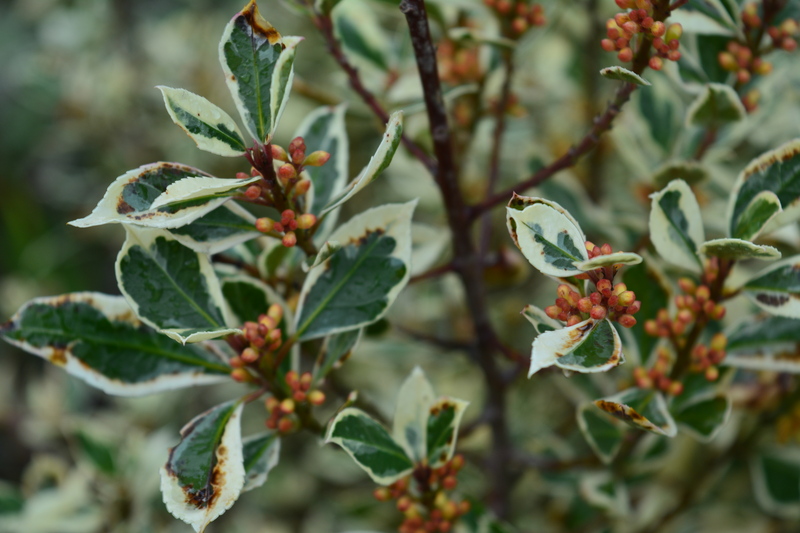 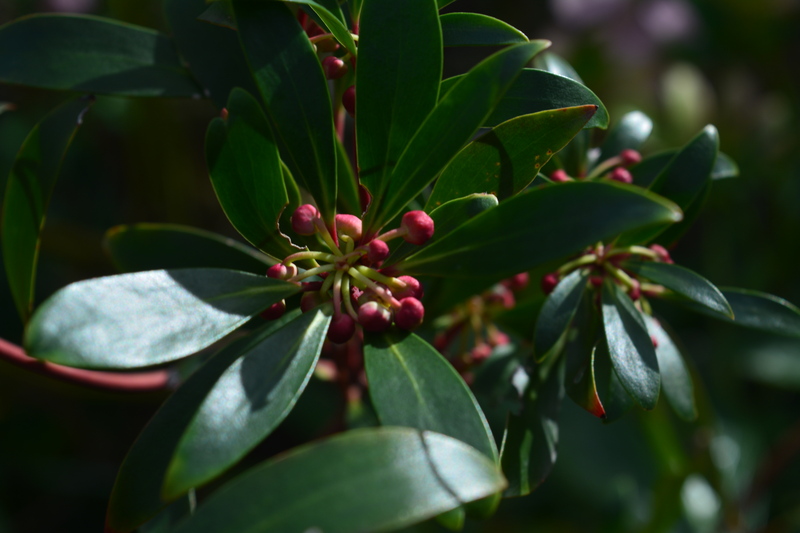 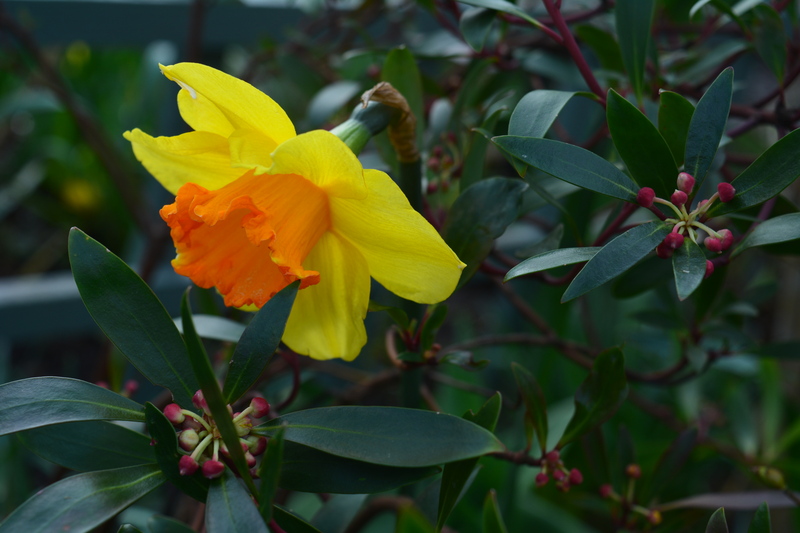 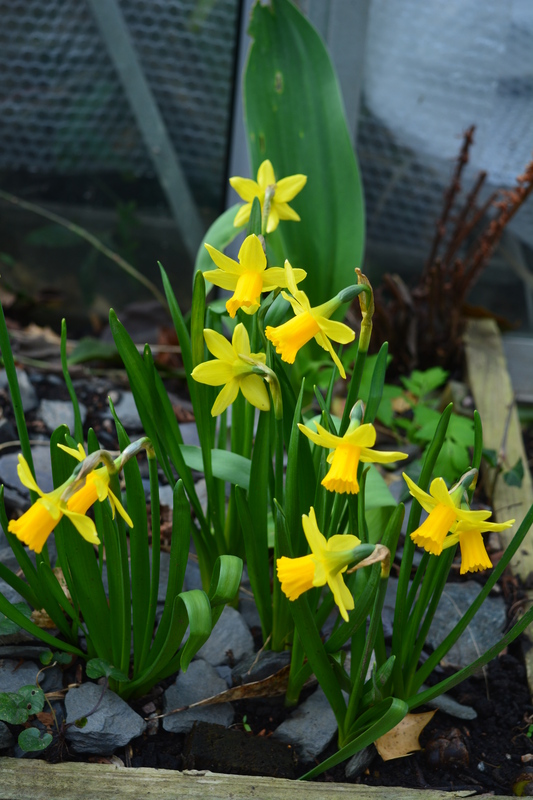 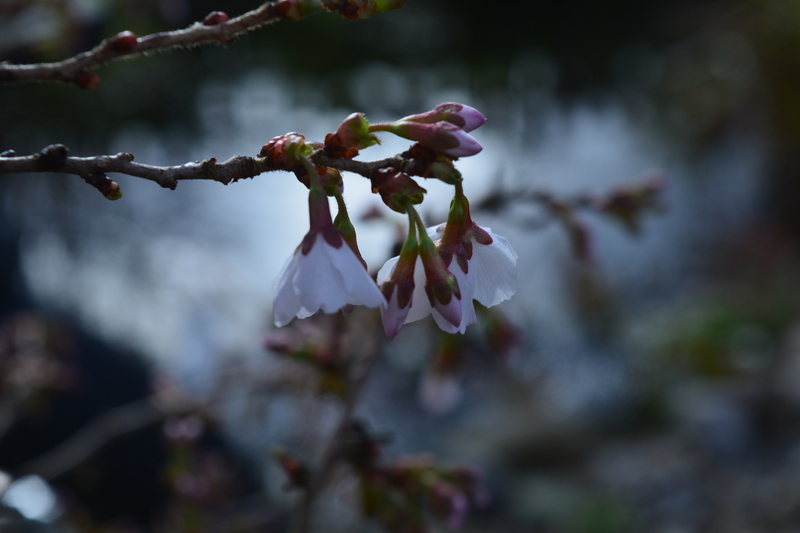 Our visit coincided with the height of the flowering seasons for Magnolias, Rhododendrons and Camellias as well as spring flowering bulbs and the earliest of perennials, so we were in for a colourful day’s exploration. 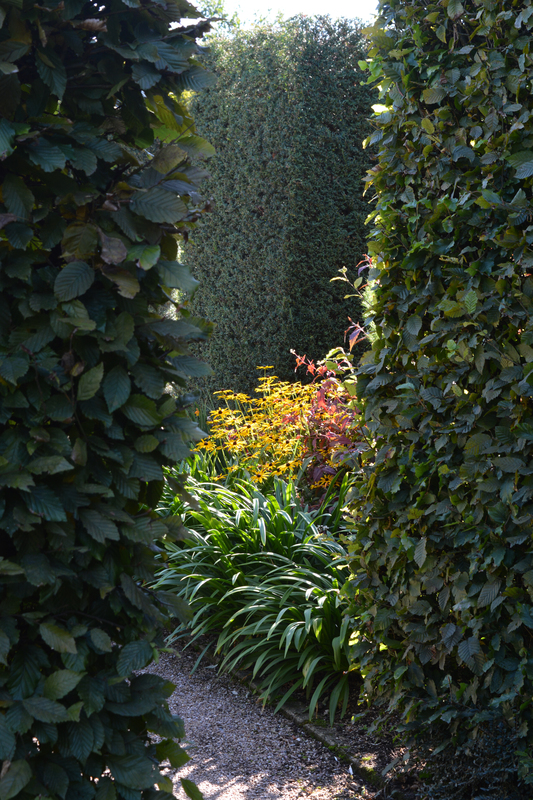 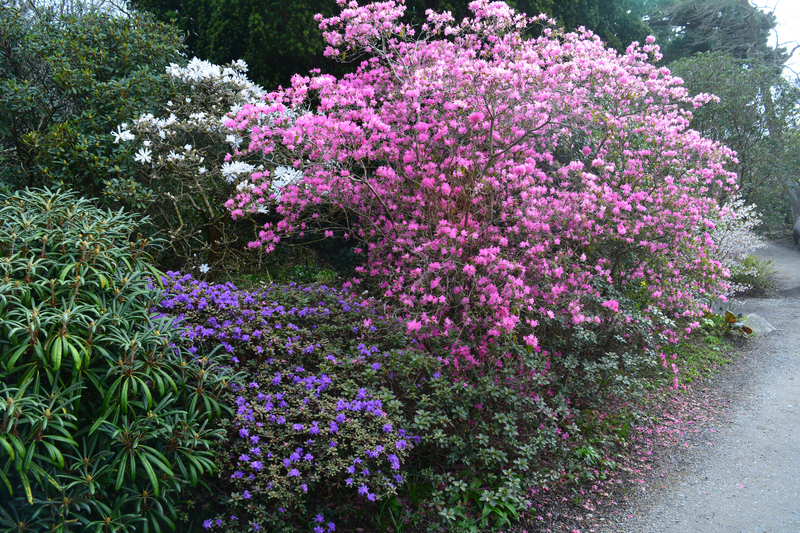 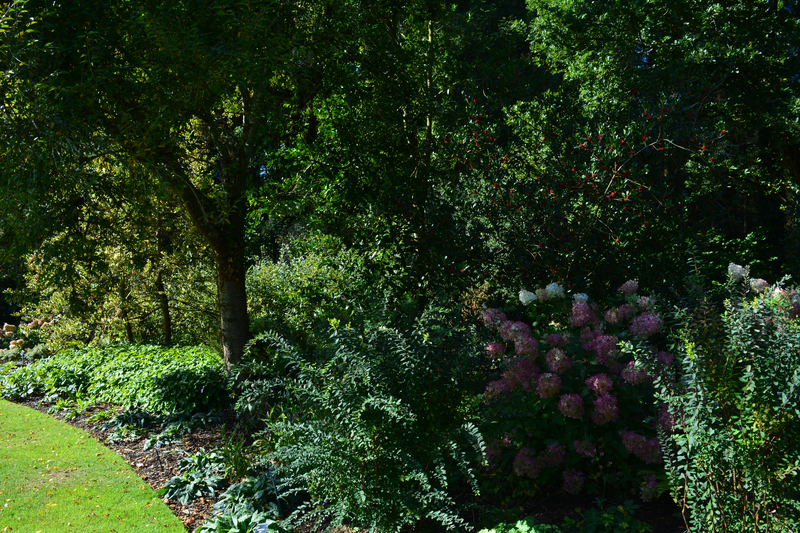 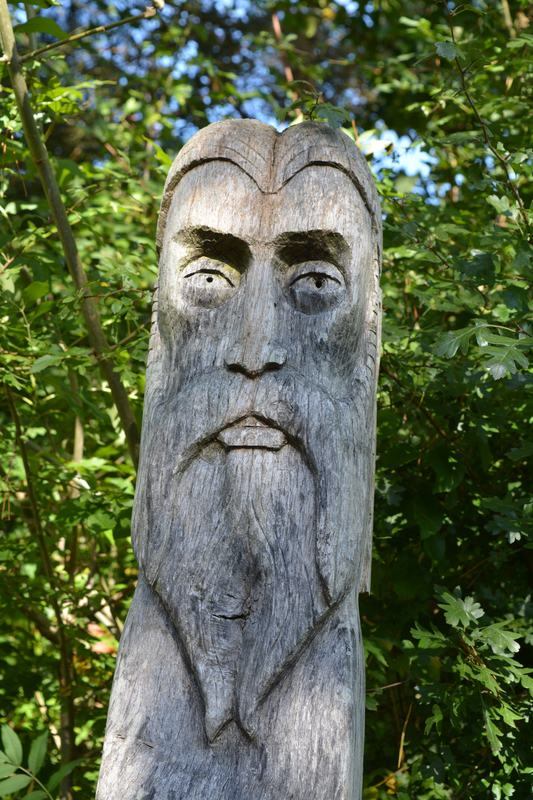 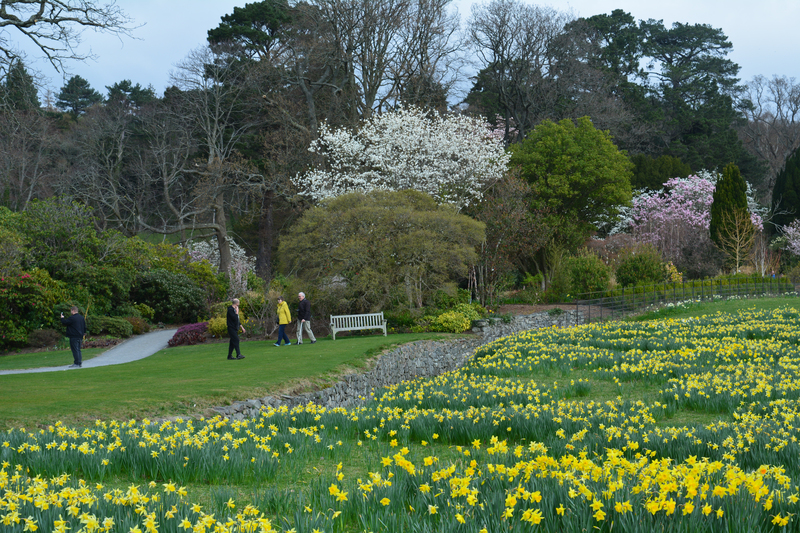 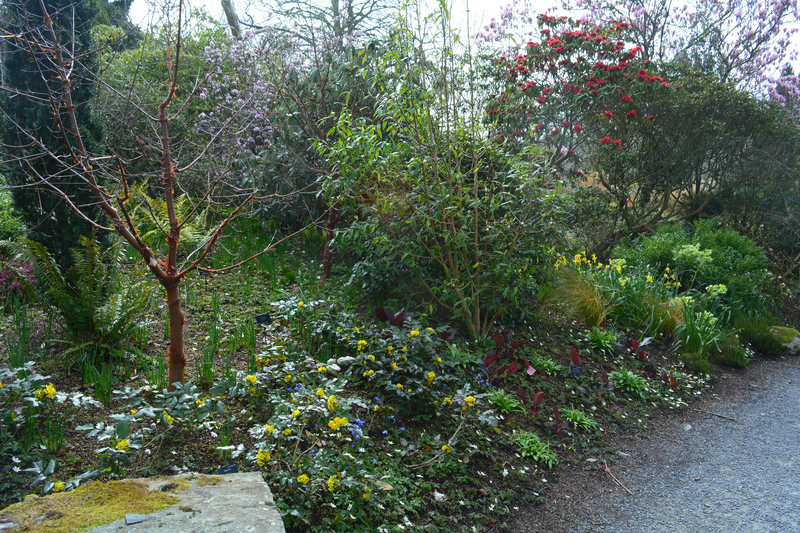 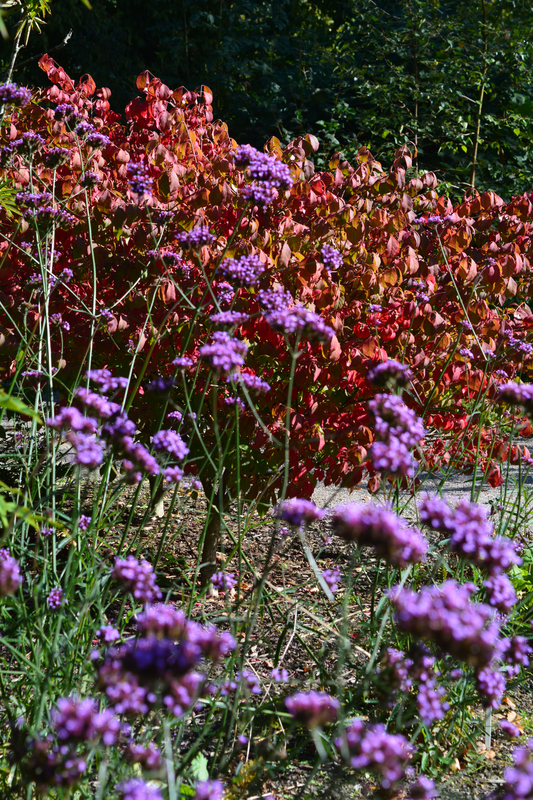 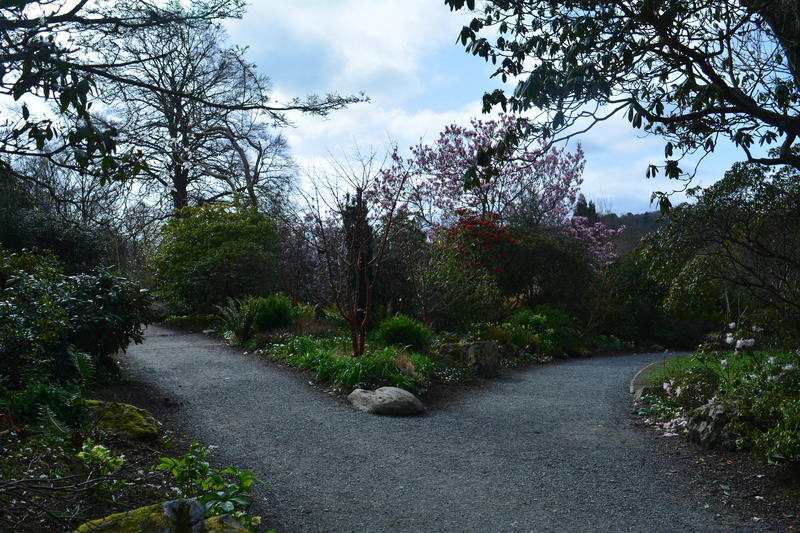 Bodnant is a garden designed to present choices where paths fork and cross. 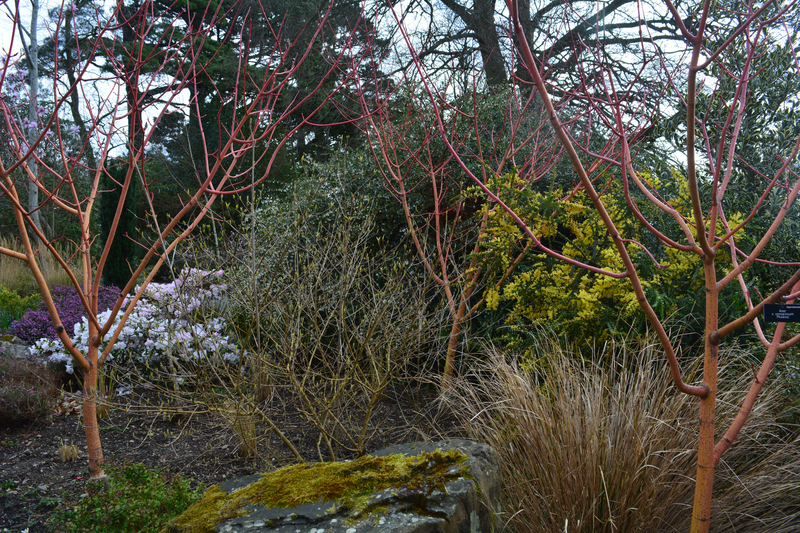 We made our way to the Winter Garden, one of our favourite parts of the garden, a place so full of ideas for anyone to use to add winter interest to their own patches. 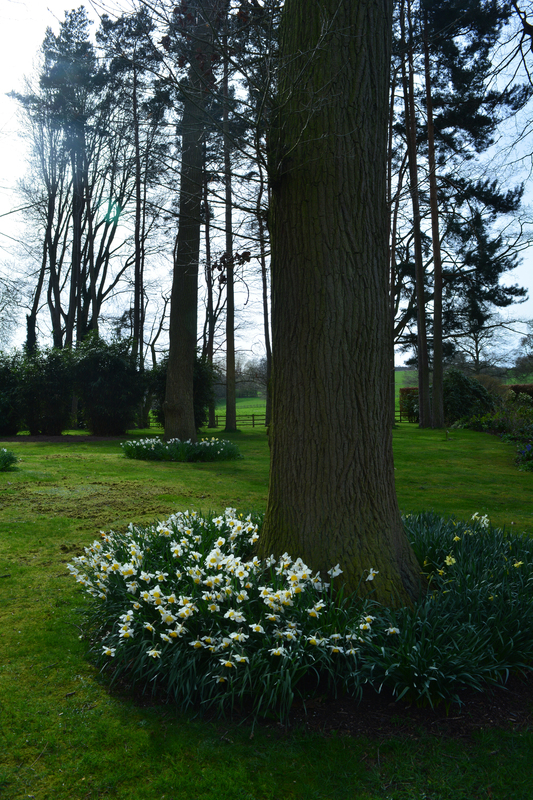 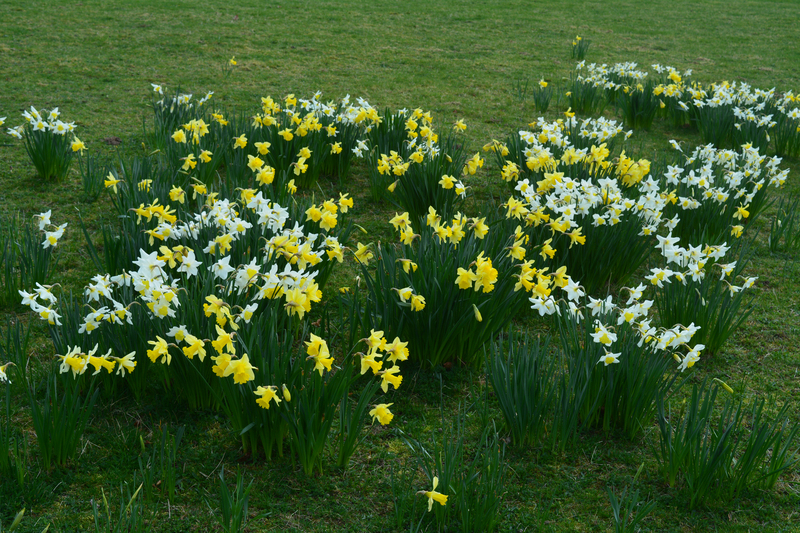 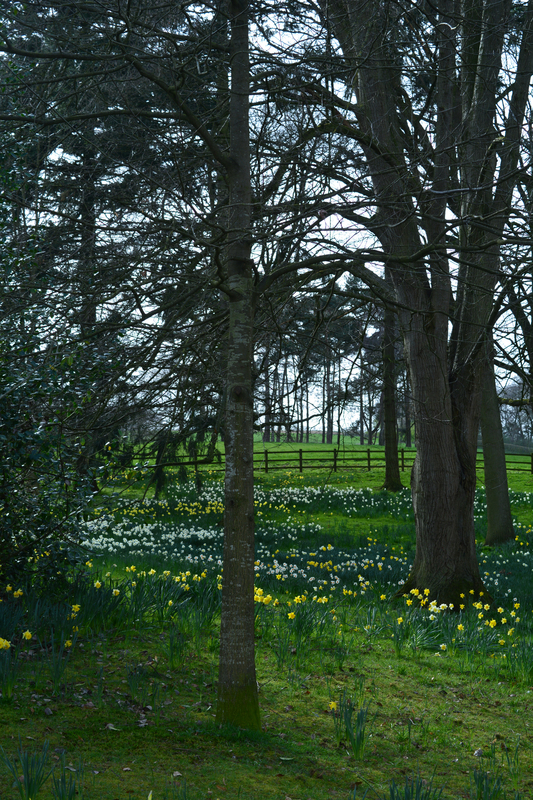 We then found a gateway that took us into a field of daffodils, simple old cultivars, creating a peaceful place to wander slowly and take in the atmosphere of this special space. 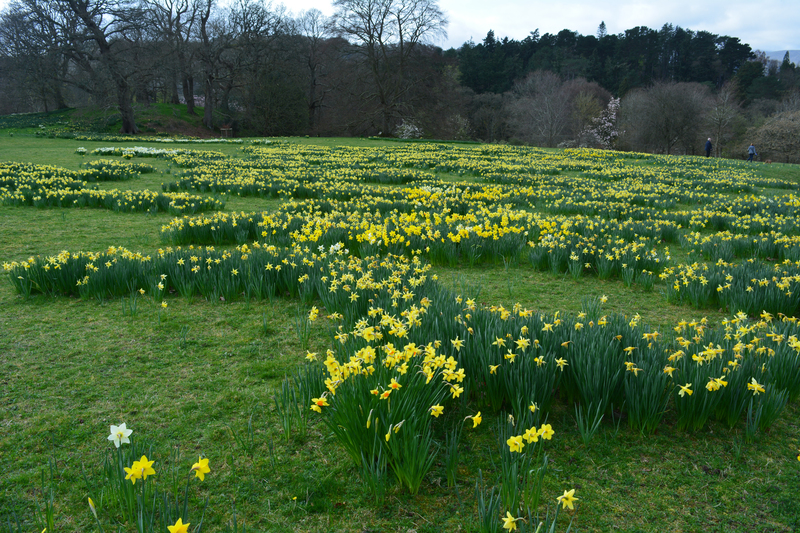 We strolled through the field slowly and then made our way down to the top of the Dell. 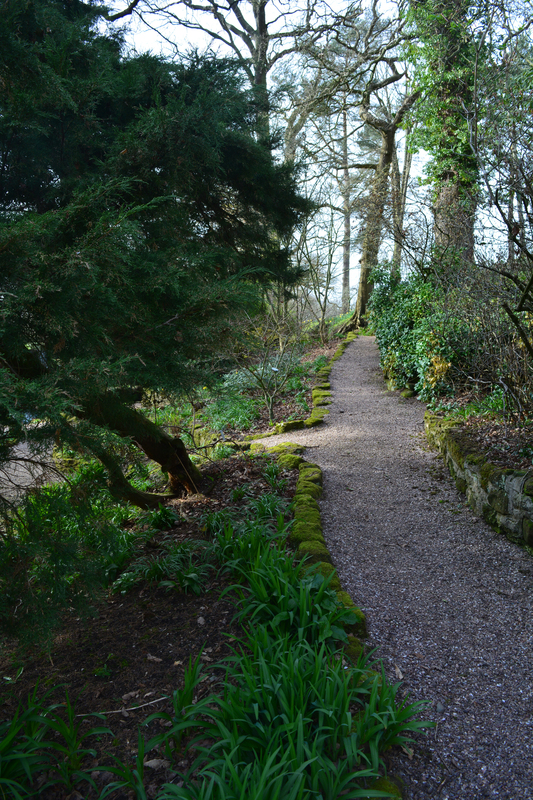 The gallery that follows shares this part of our time at Bodnant. 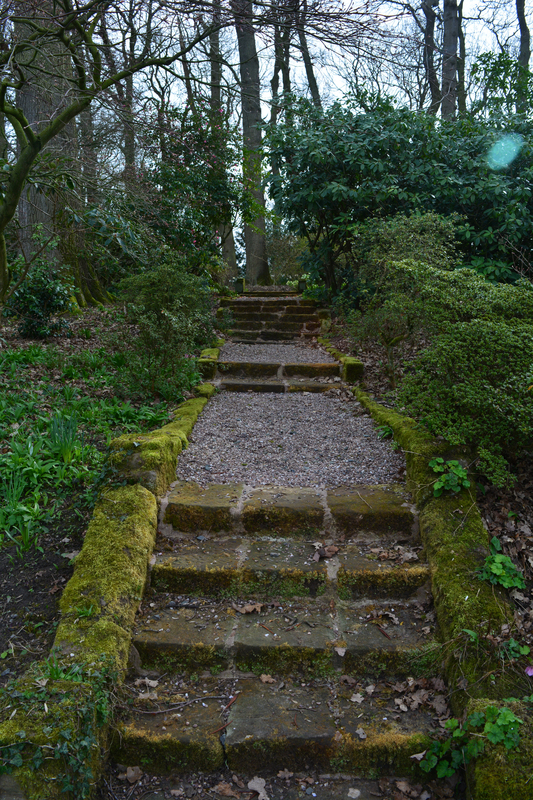 In part 2 we shall wander along the dell and then back up the long slope to explore the areas around the hall. 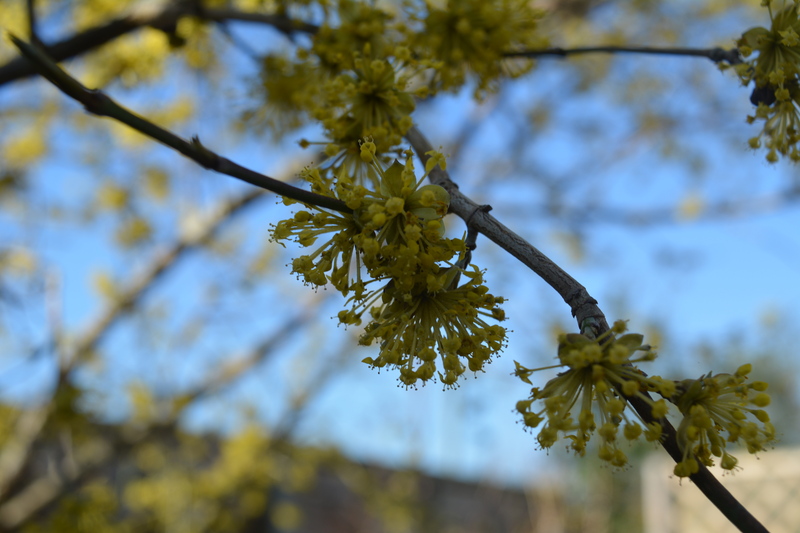 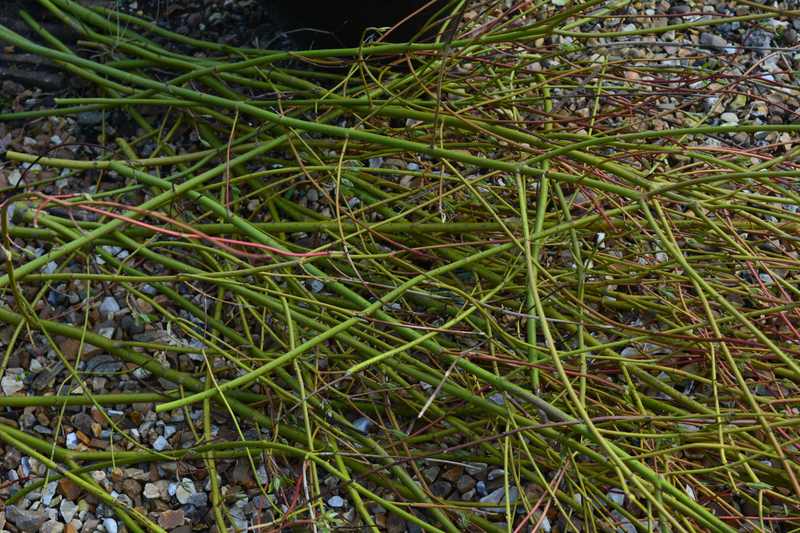 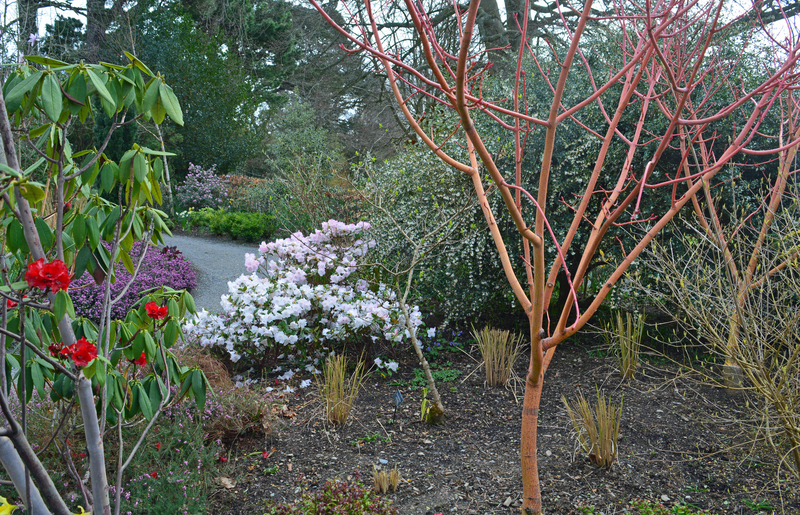 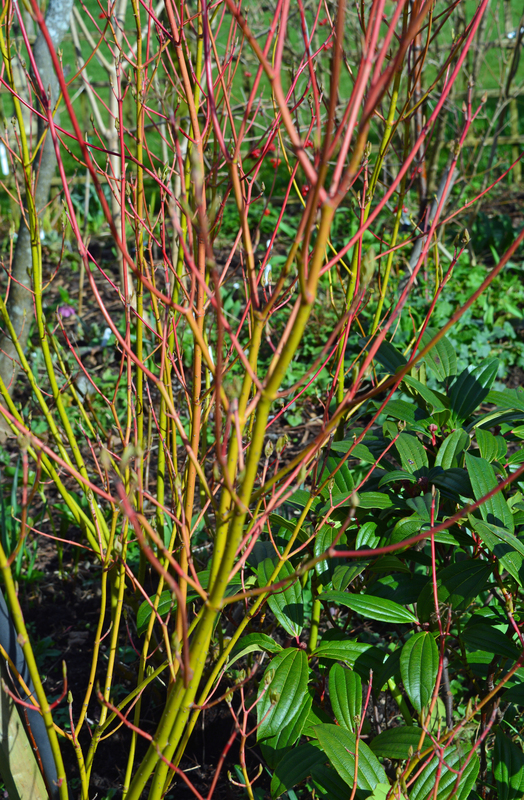 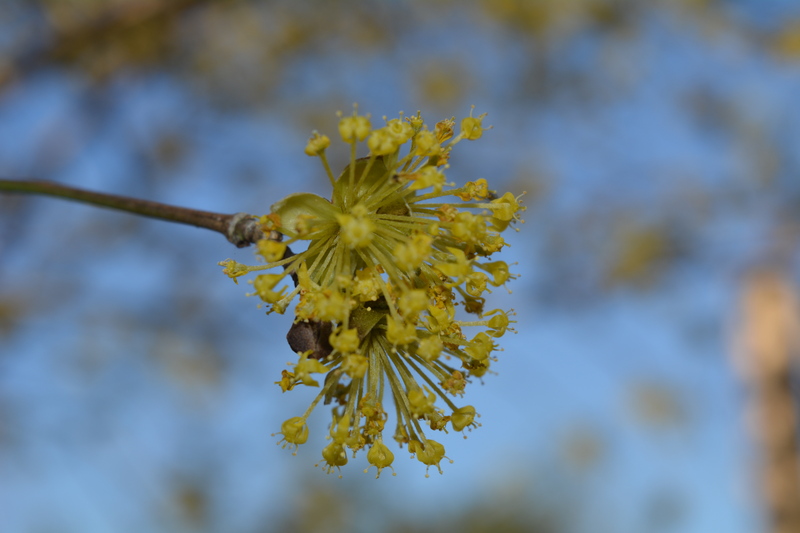 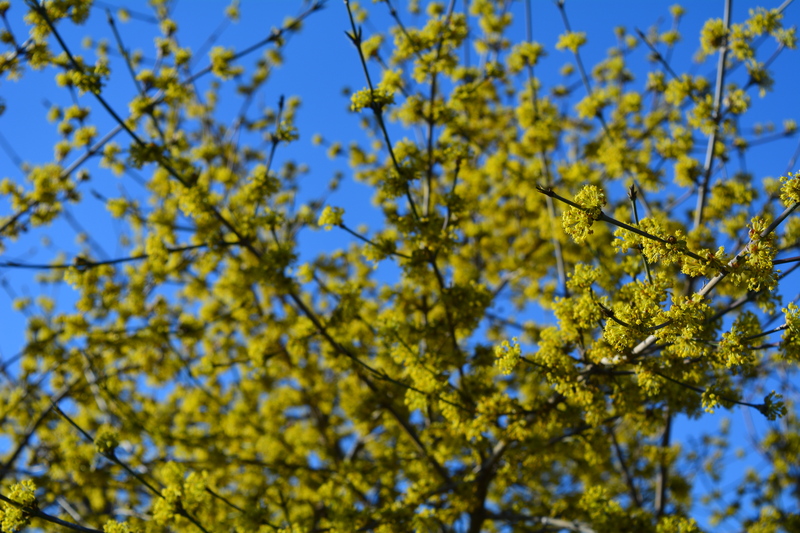 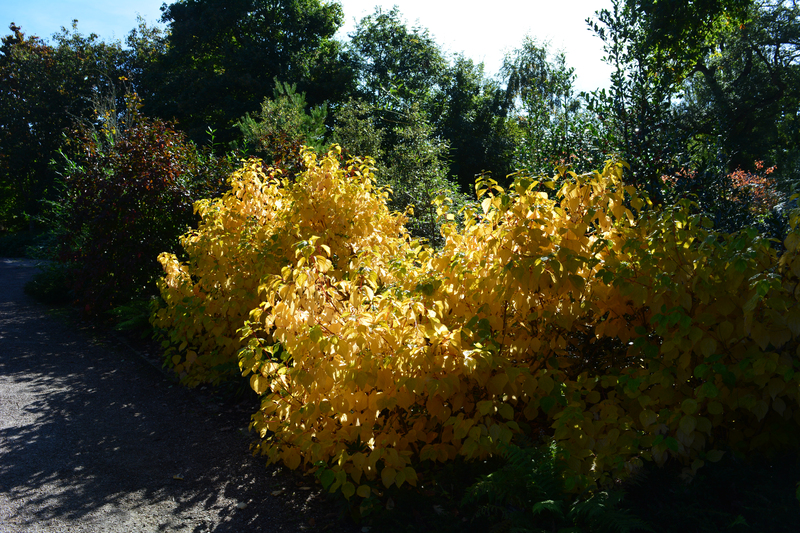 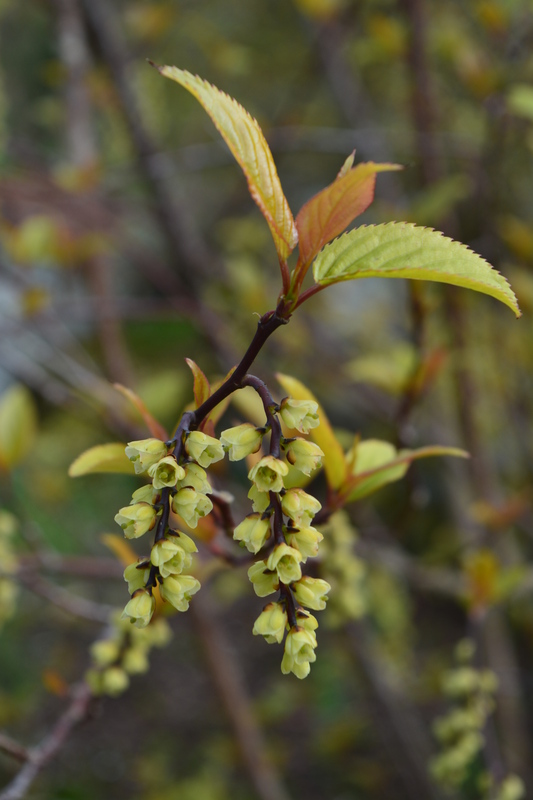 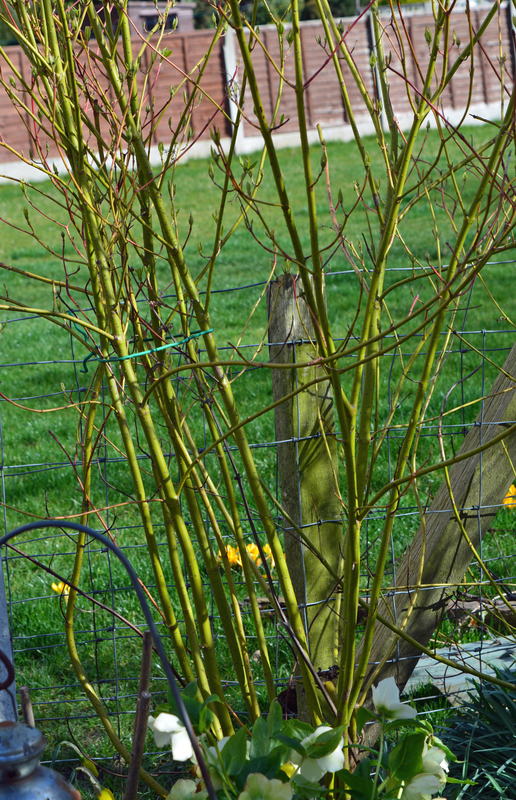 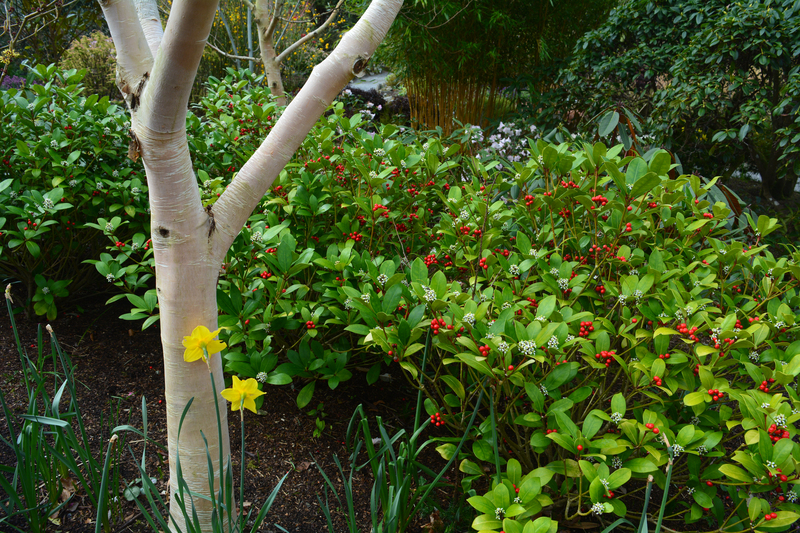 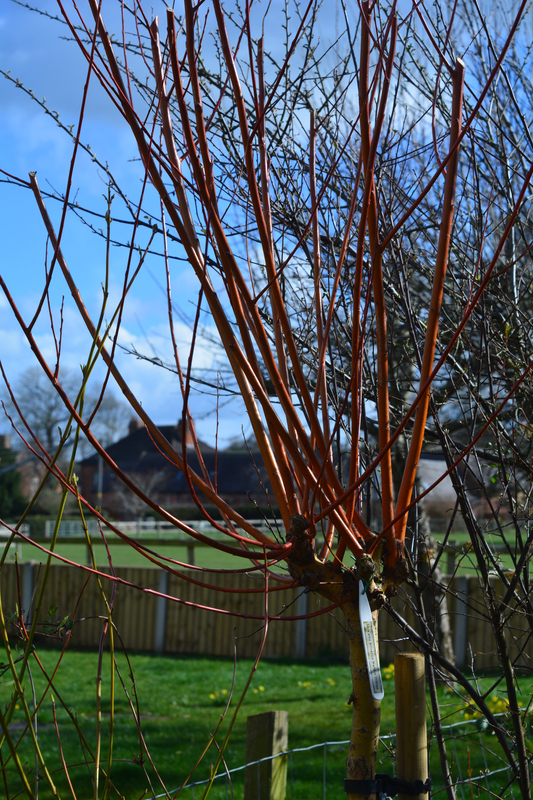 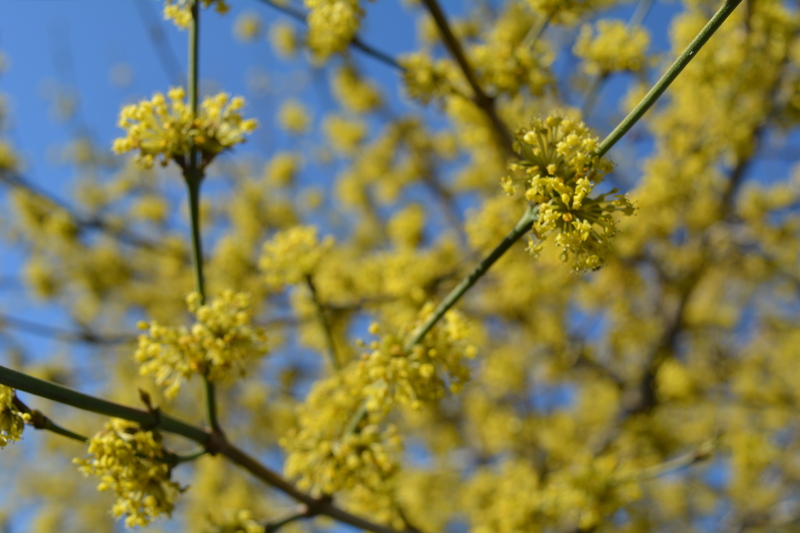 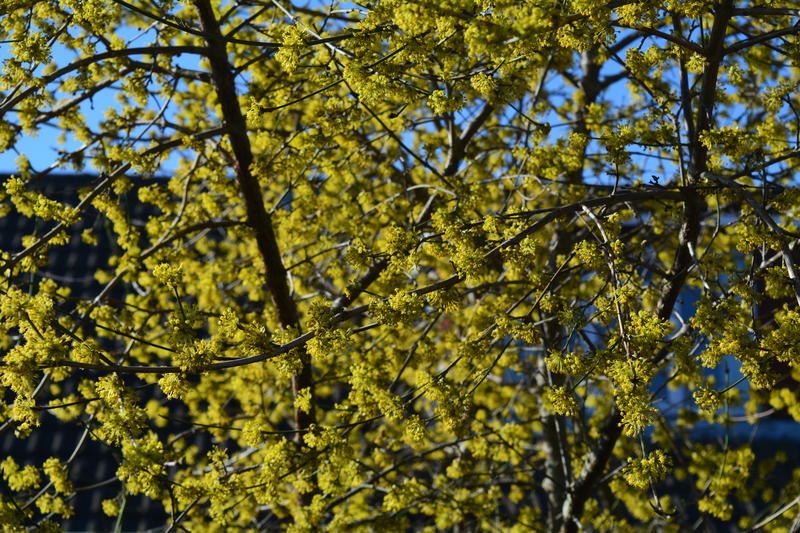 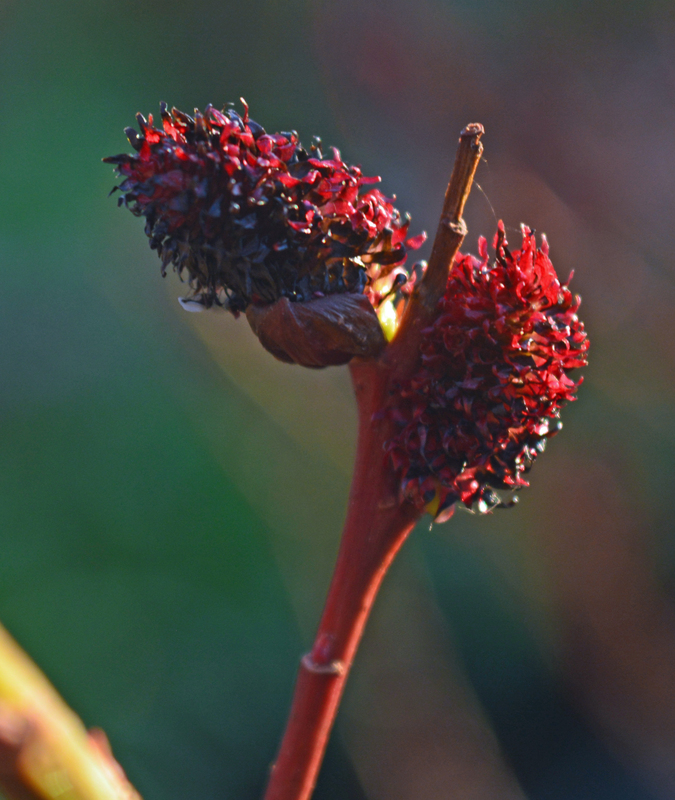 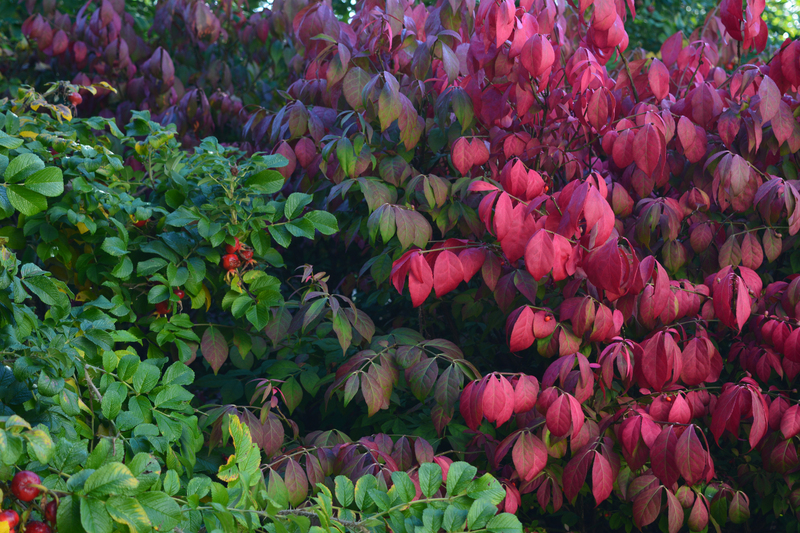 At the beginning of every year we are treated to the amazing display of flowers on our Cornus mas. 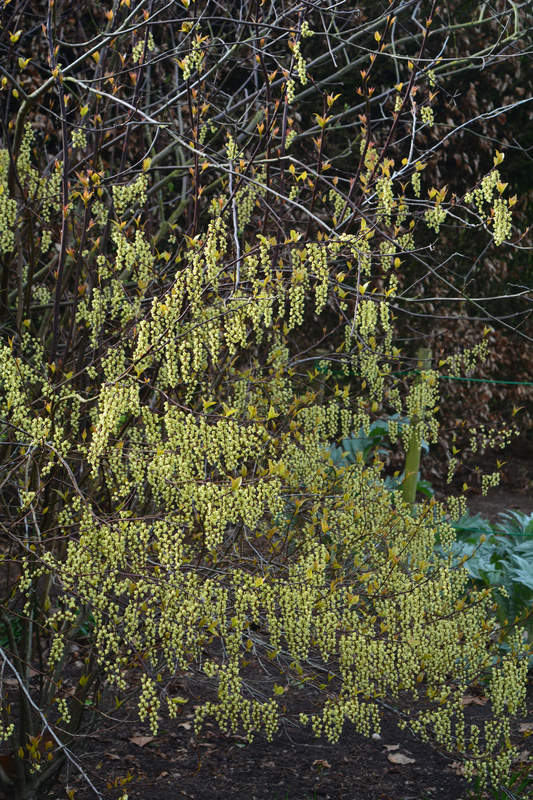 The shrub gets covered in its citr us yellow unusual flowers. 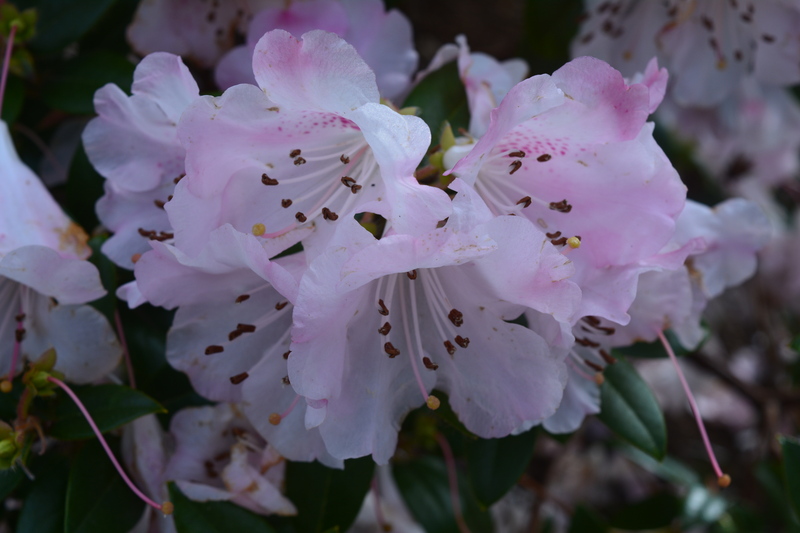 The flowers have to be looked at very close up to appreciate the details of its structure. 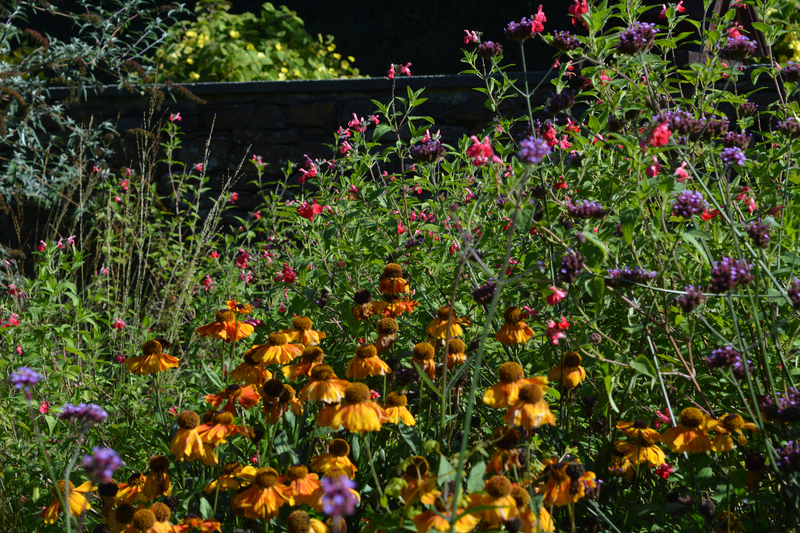 The bees love it as an early food source. 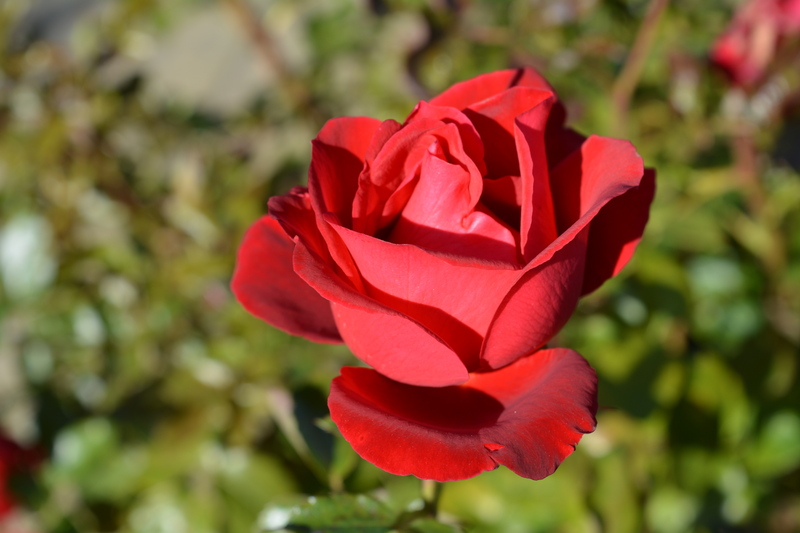 I hope you enjoy sharing ours through my photos. 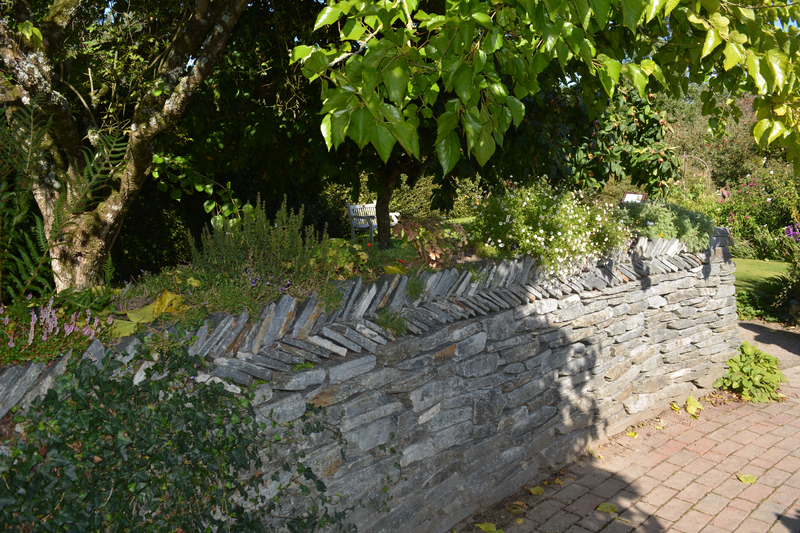 We like to enjoy a few extra visits on our way back from any holiday we go on to extend our enjoyment, so we tend to book hotels partway back. 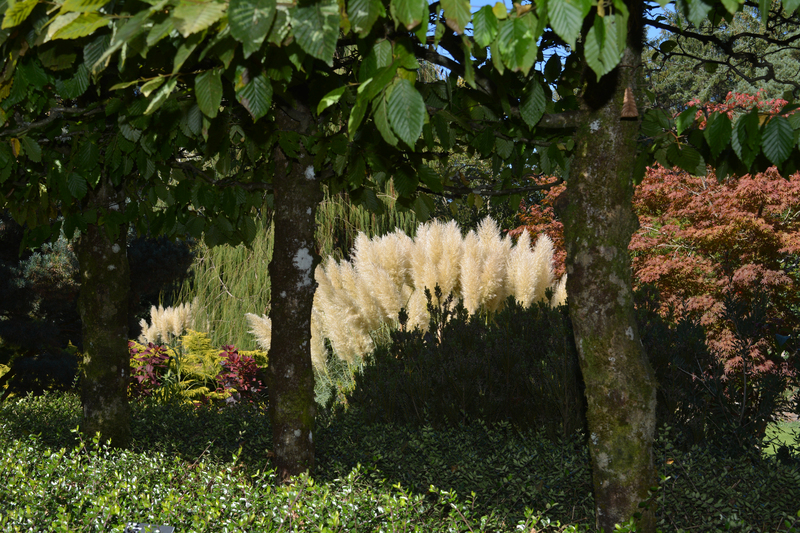 On our way back from our Cornwall holiday we stopped off at a hotel in Devon so that we could visit RHS Garden Rosemore. 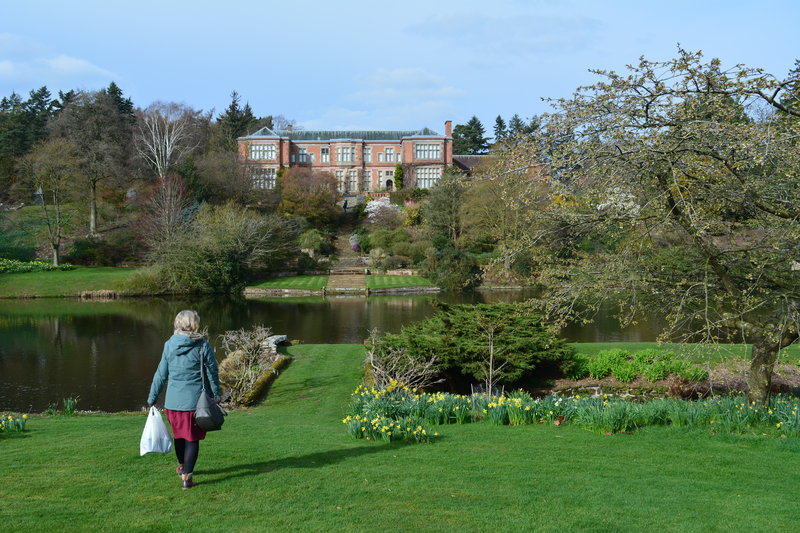 We try to visit all the RHS gardens every year if we can, so we know them well and tend to enjoy them at different times of the year. 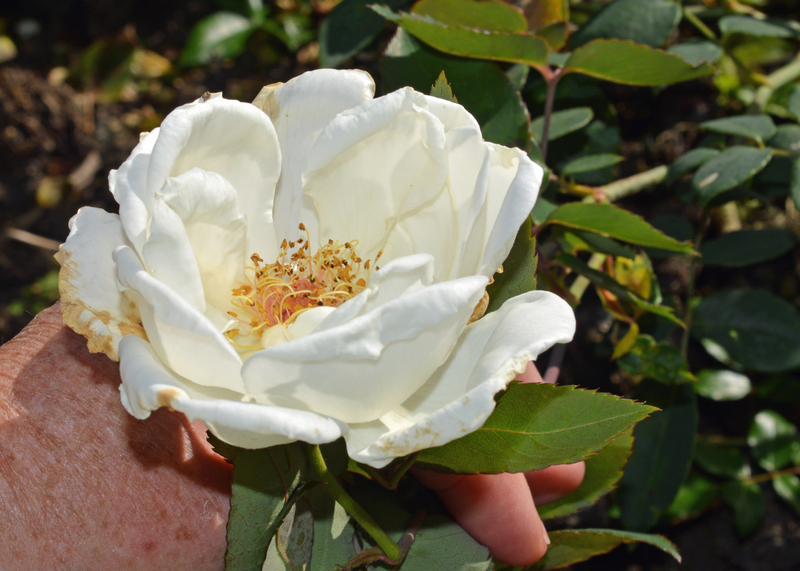 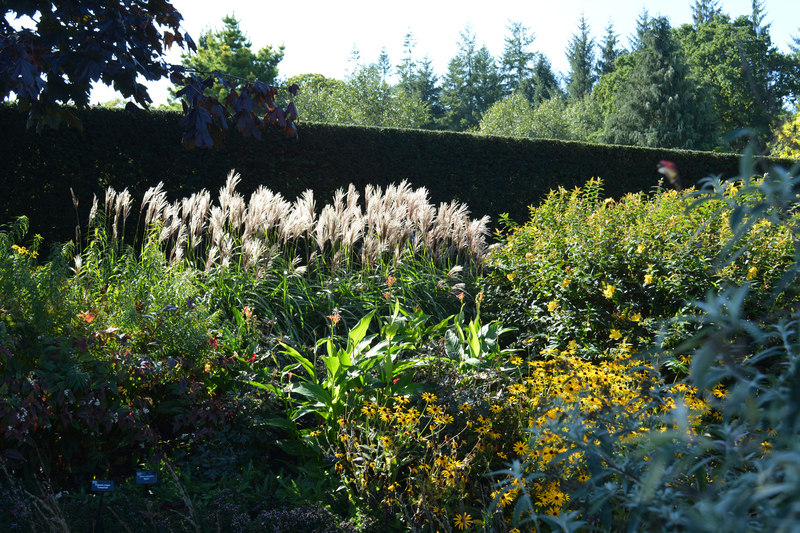 An early autumn visit to Rosemore was going to be a real treat. 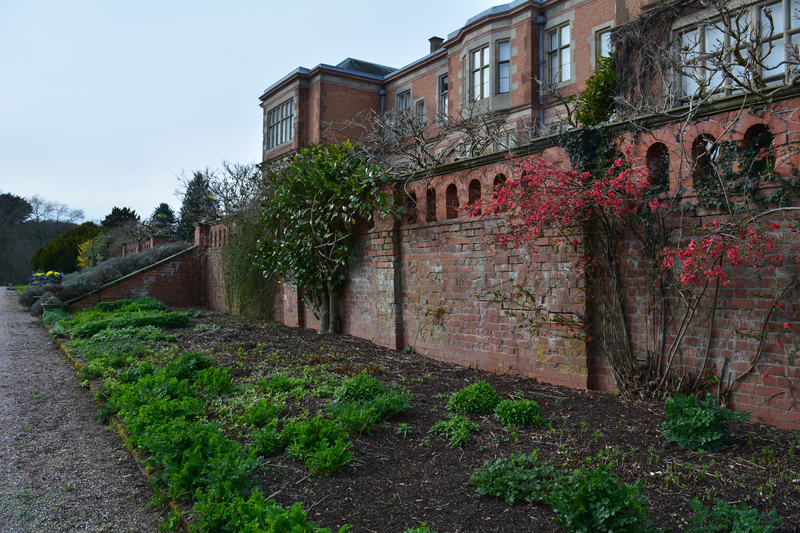 It is a garden of two halves, the newer section developed from scratch by the RHS and the older original garden donated to them. 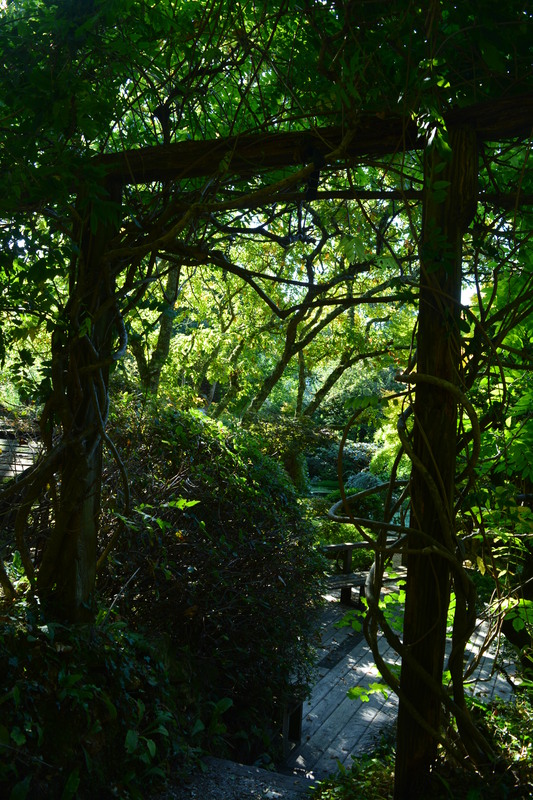 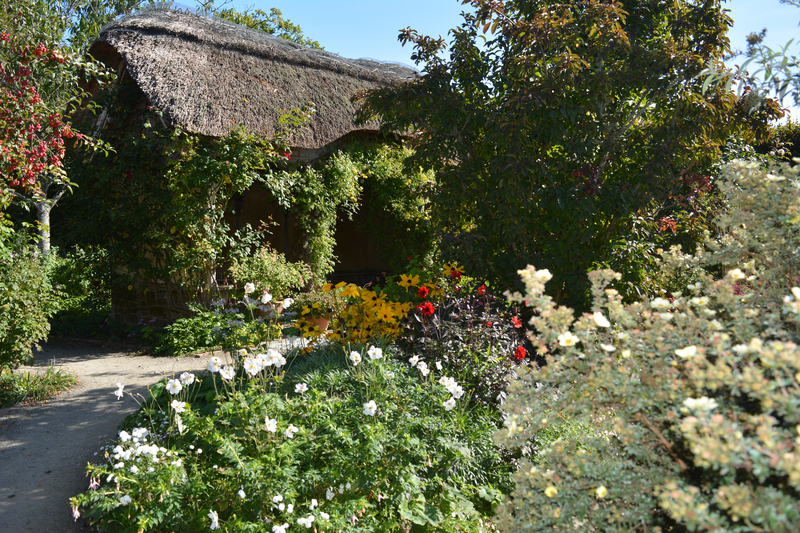 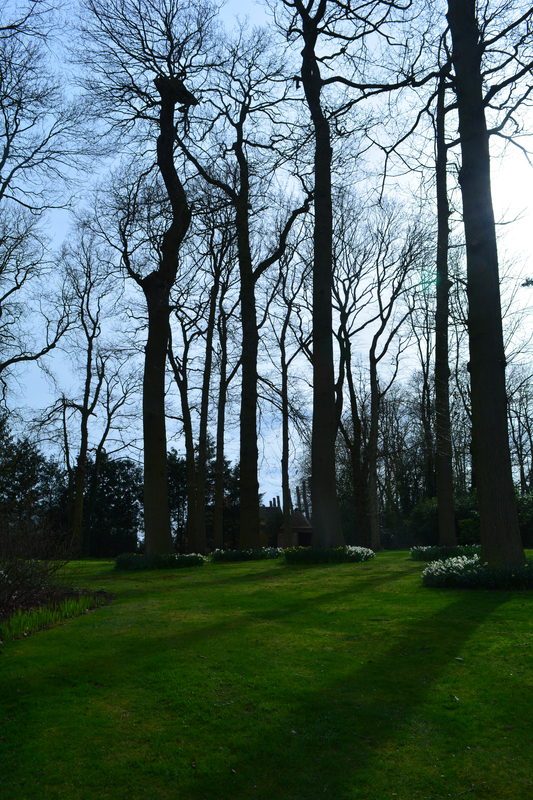 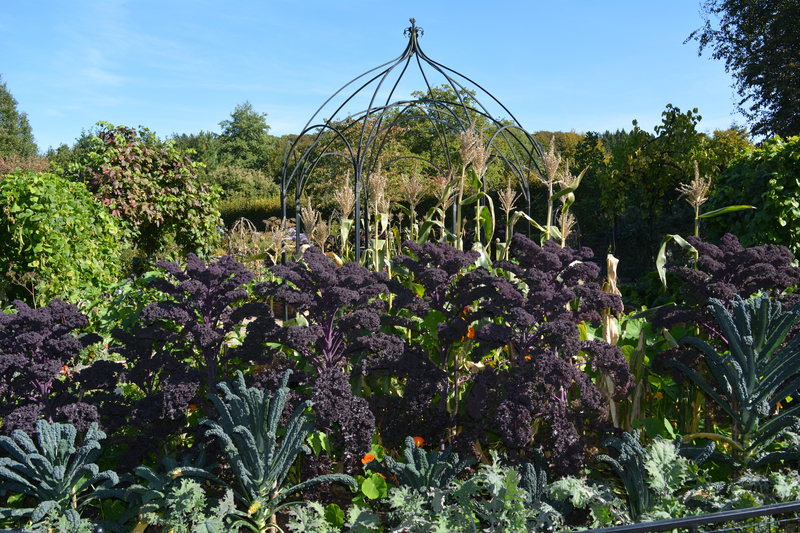 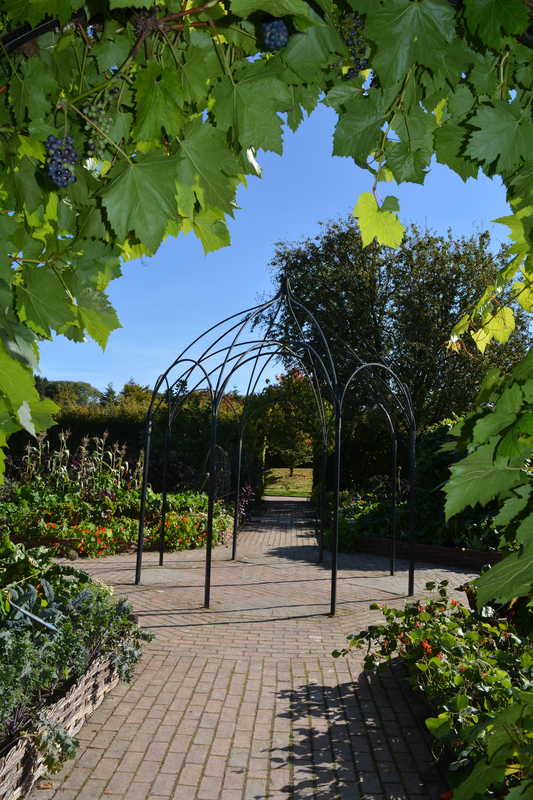 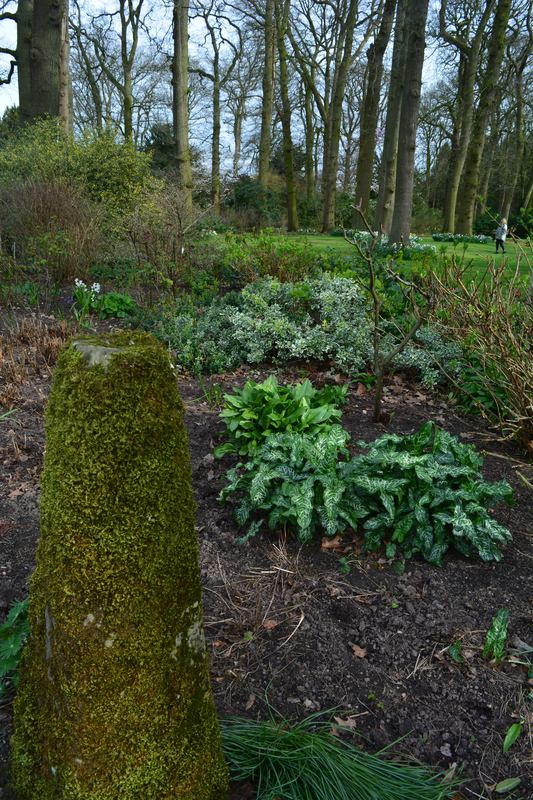 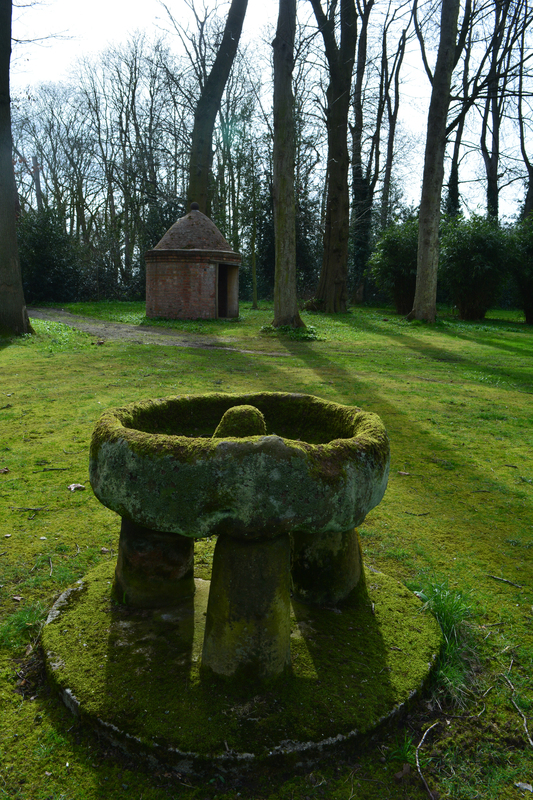 The beauty of this garden is its overall design which can be discovered by exploring its series of differently themed rooms joined with walks across grass areas, through woodland and even under a road via a tunnel. 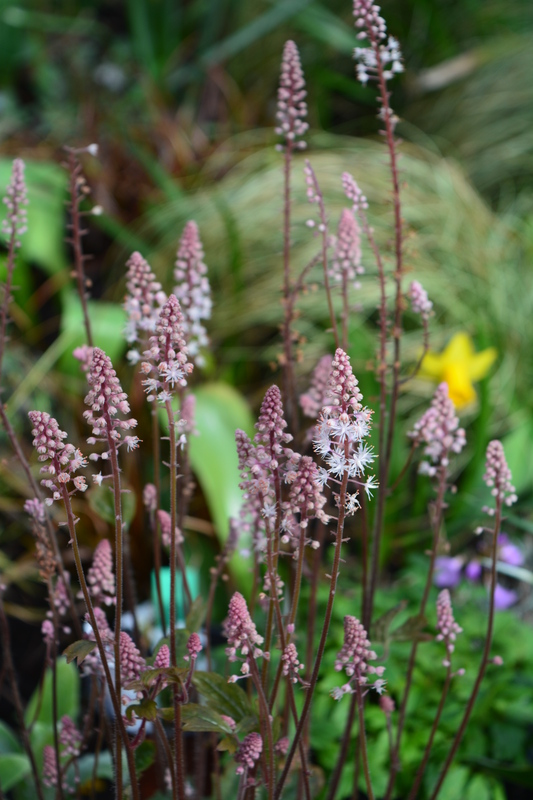 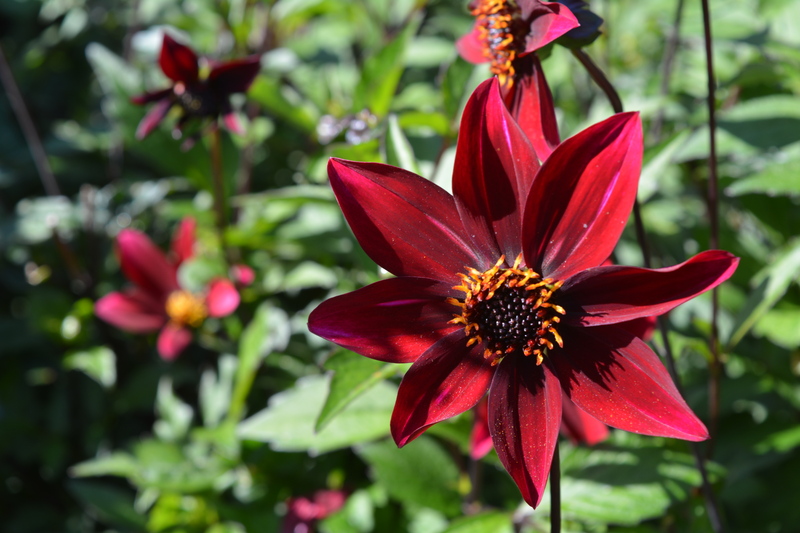 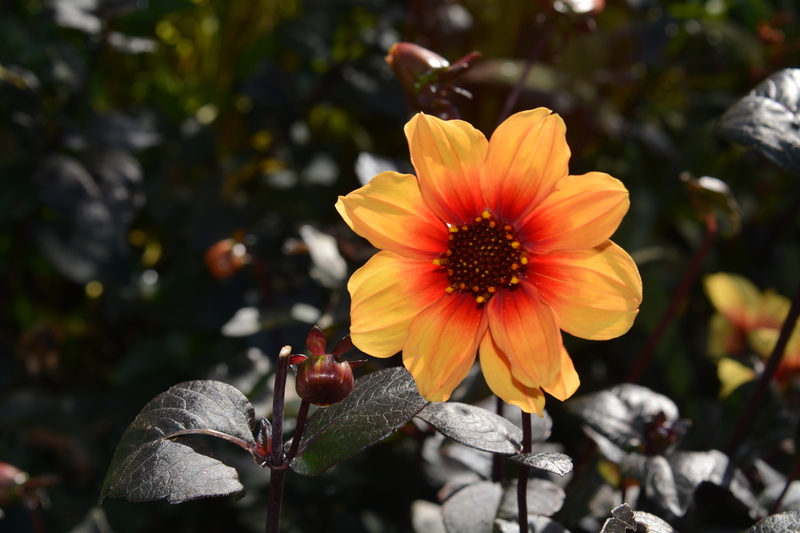 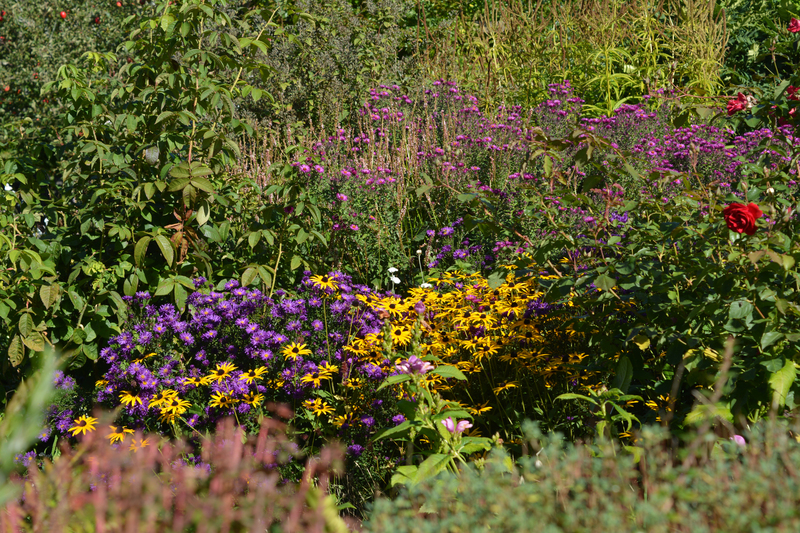 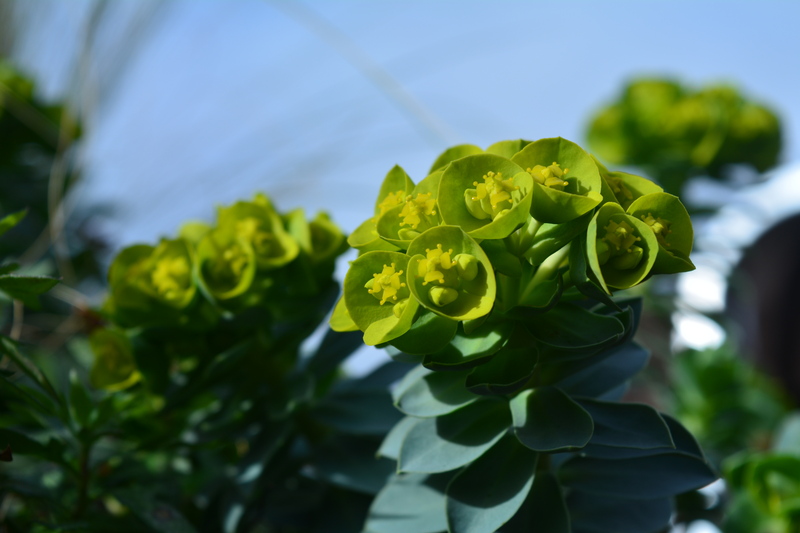 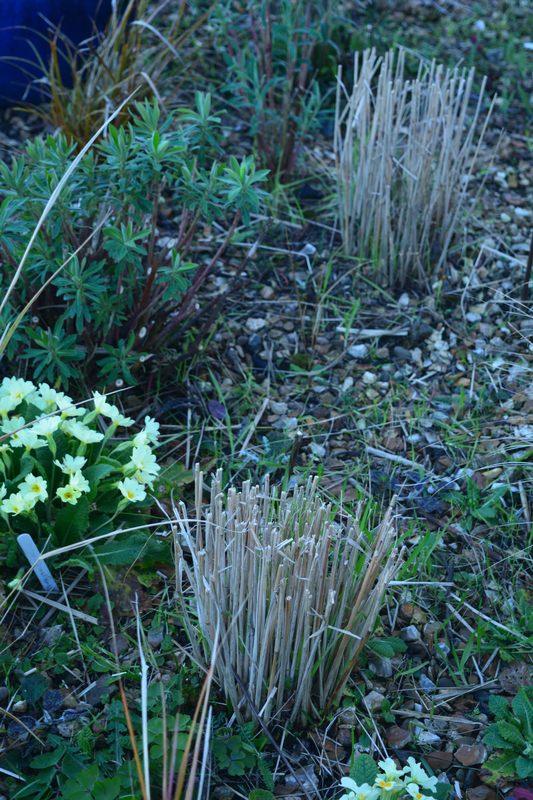 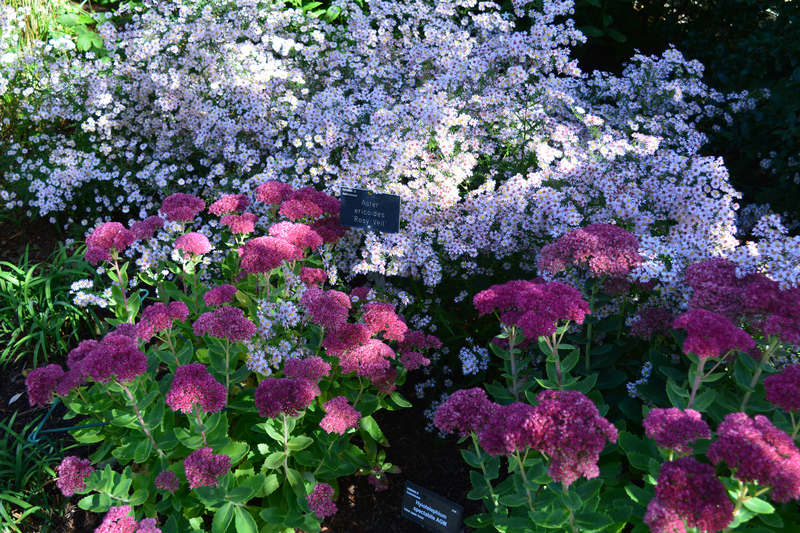 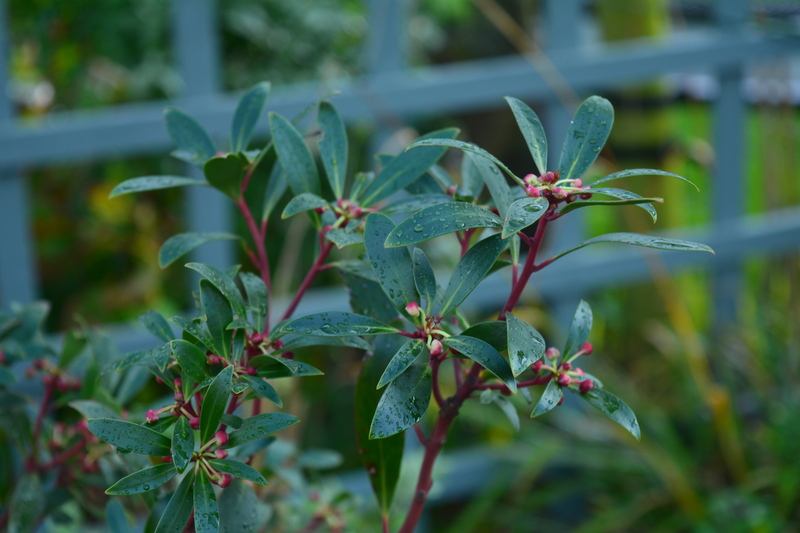 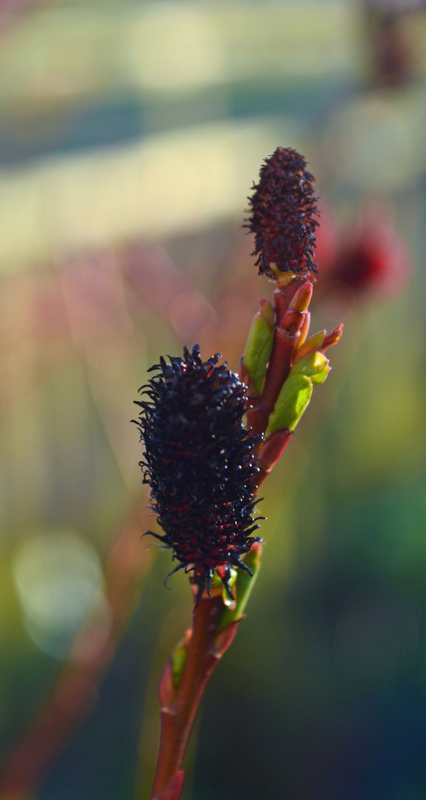 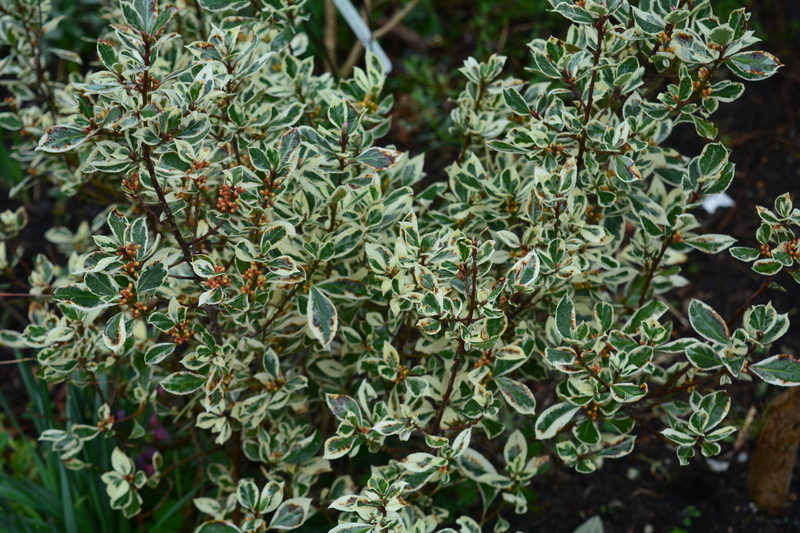 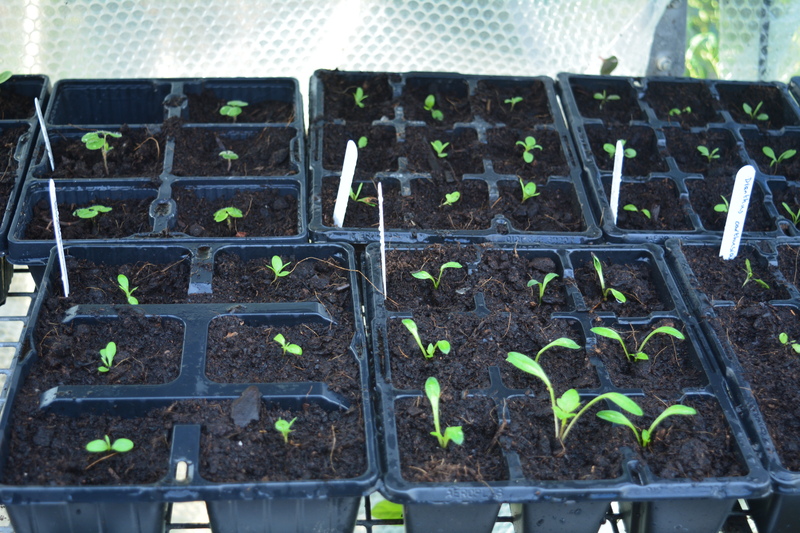 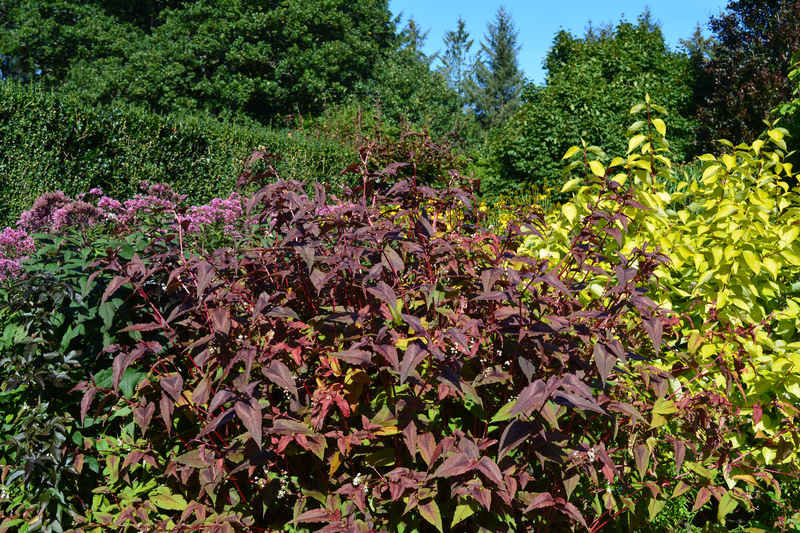 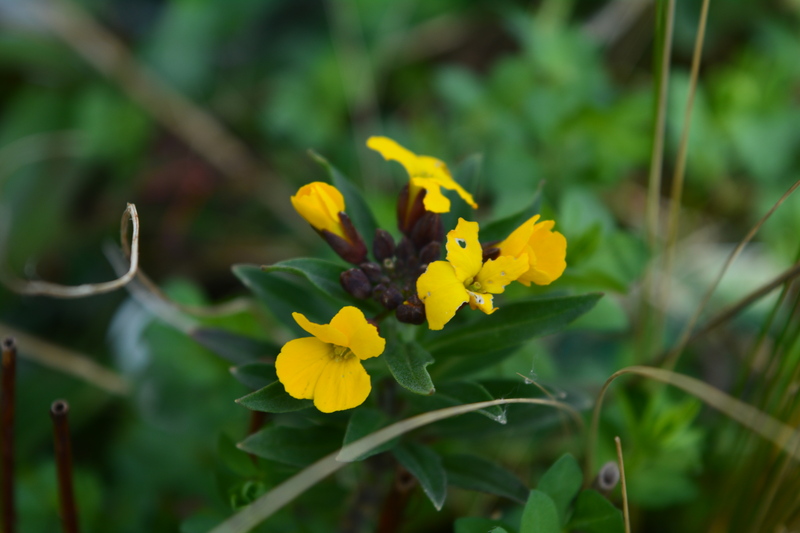 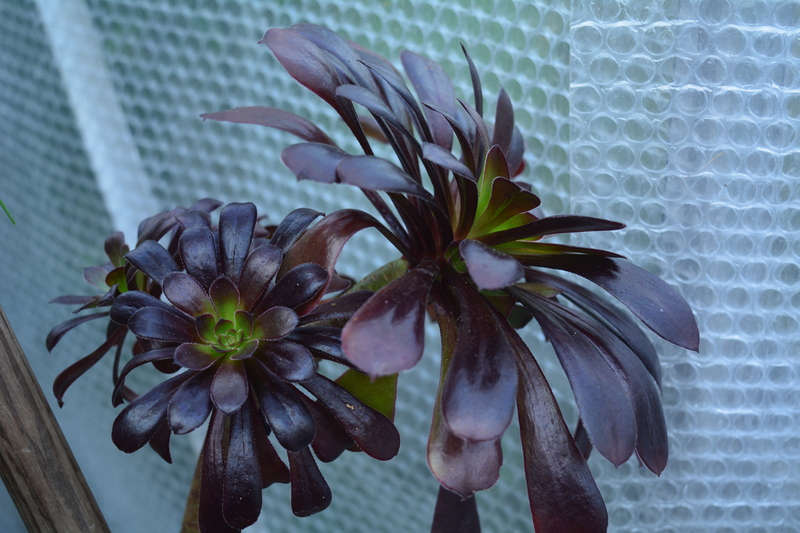 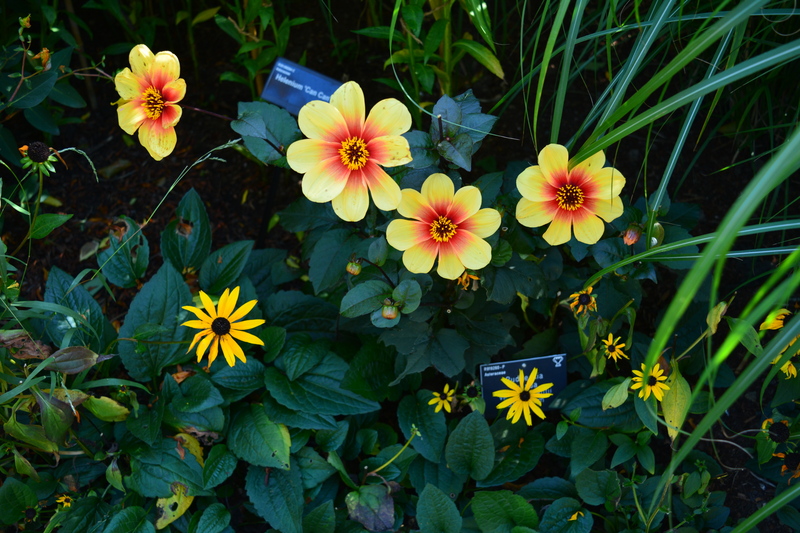 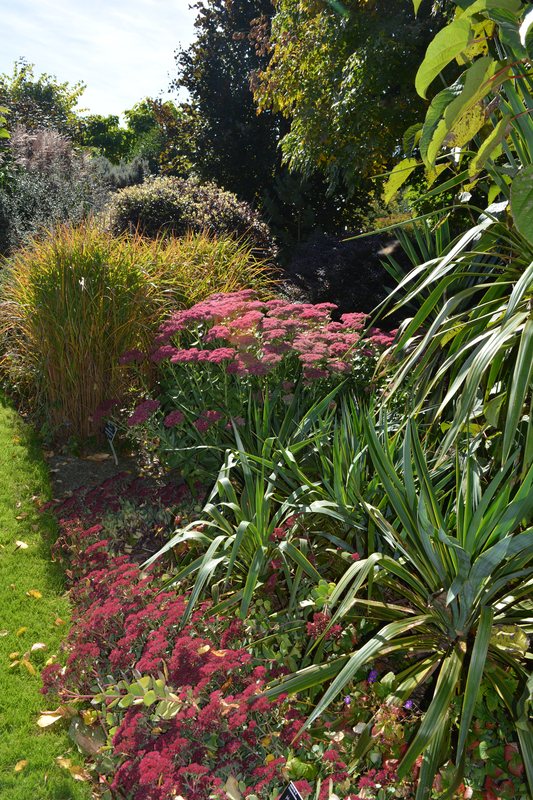 My photos show some of our favourite plant combinations. 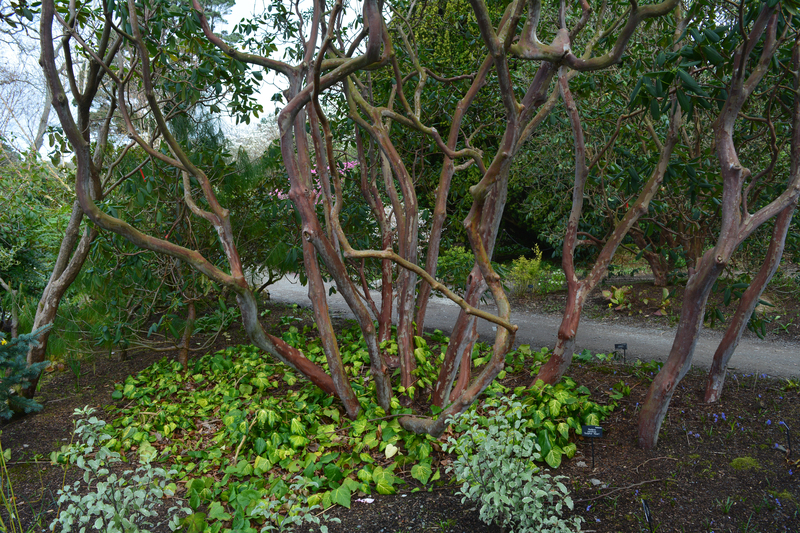 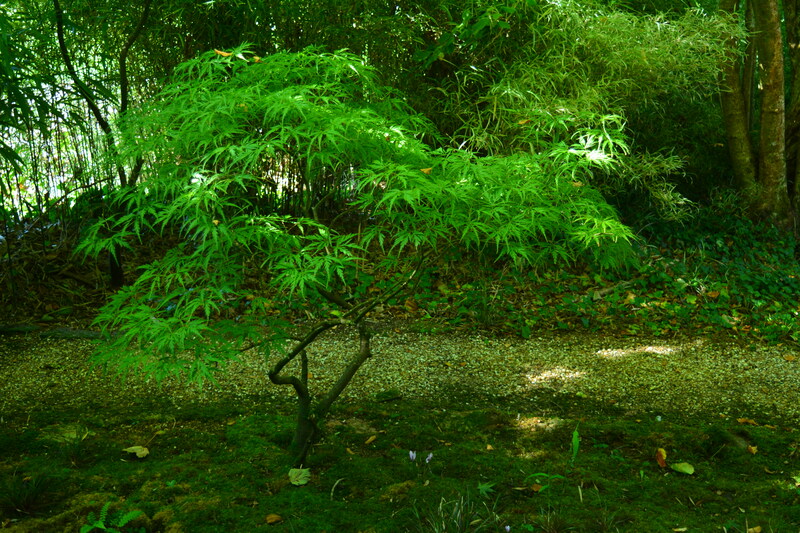 Trees feature in several favourite plant communities which really appealed to us. 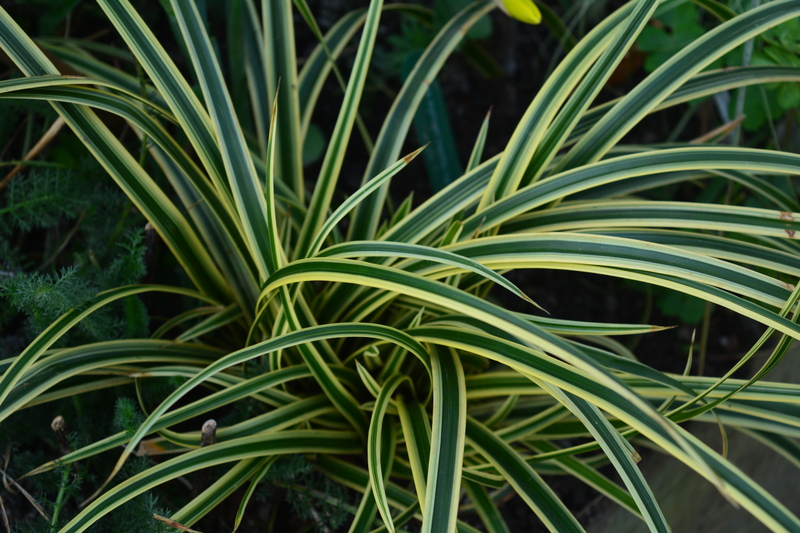 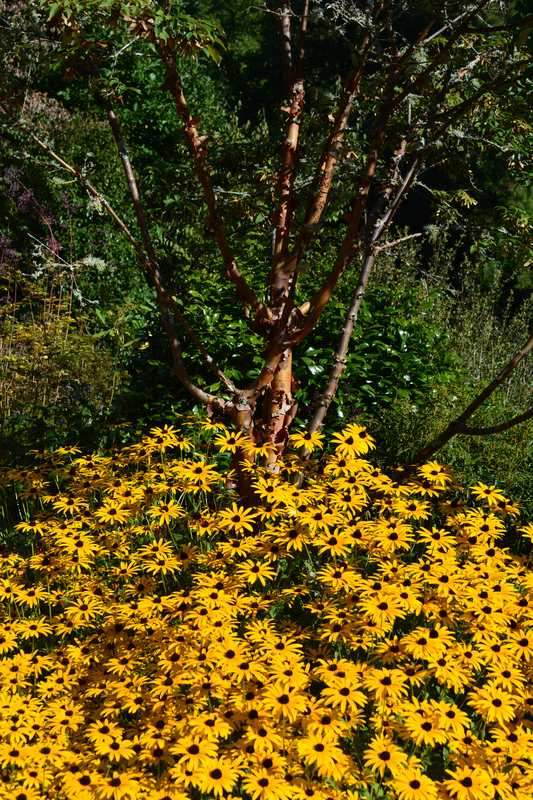 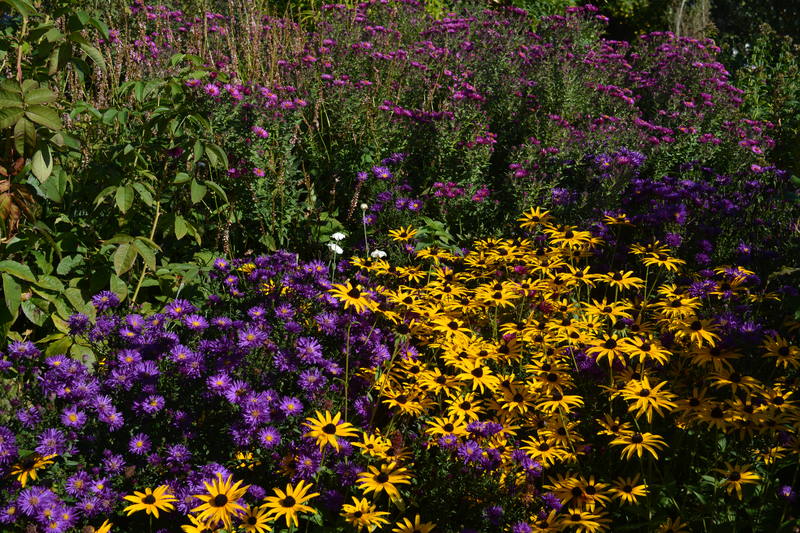 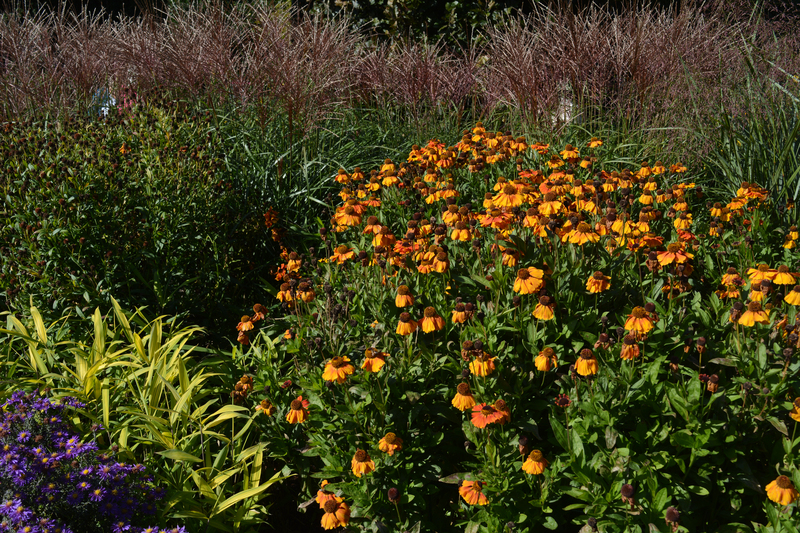 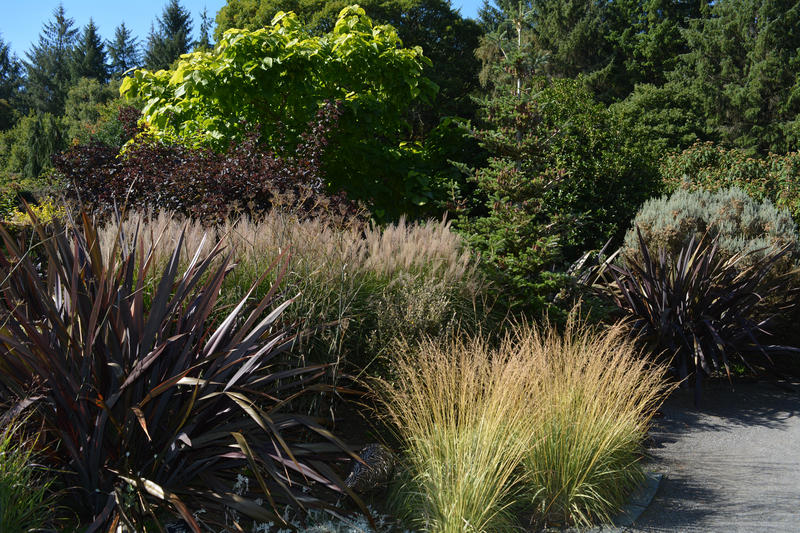 They add strength, texture and structure to any border. 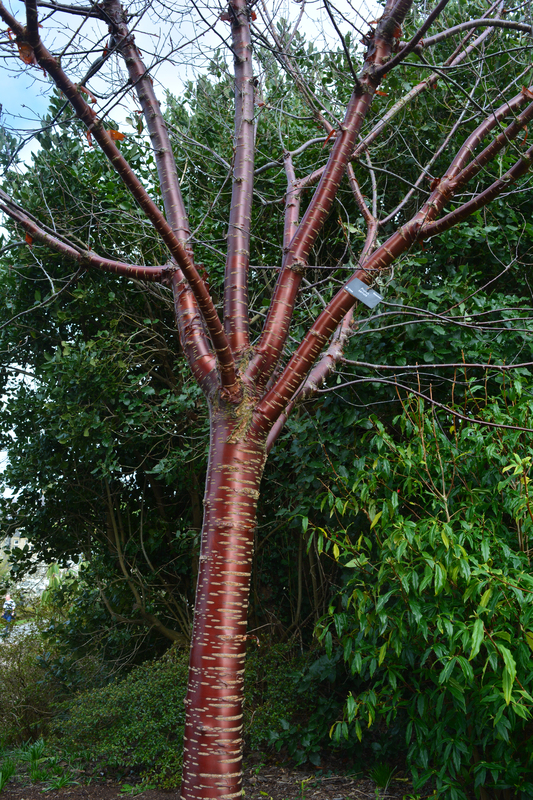 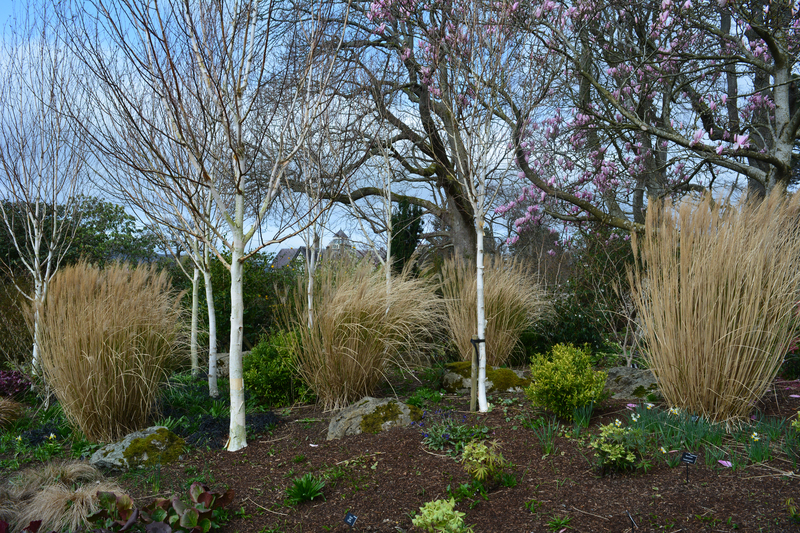 We use trees in many of our borders at home in our Avocet patch. 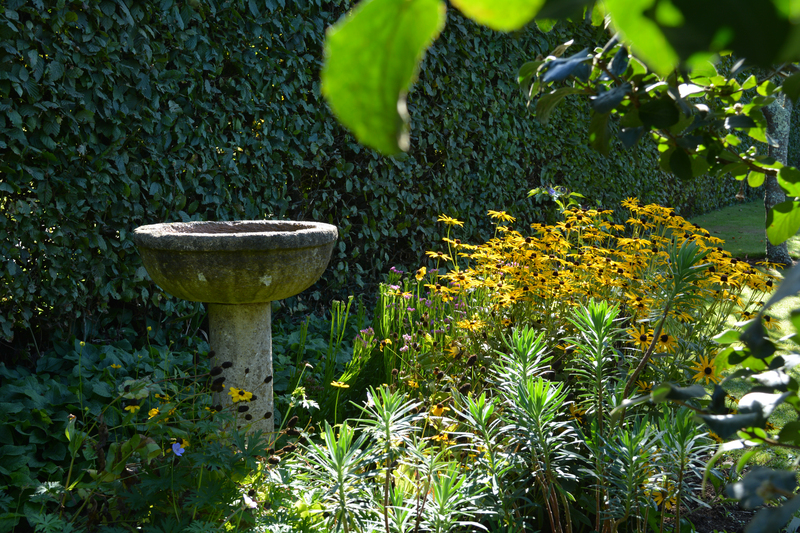 Sometimes added interest can be achieved by including cameos and views, pieces of sculpture, arches, pergolas, garden buildings of all sorts or other features. 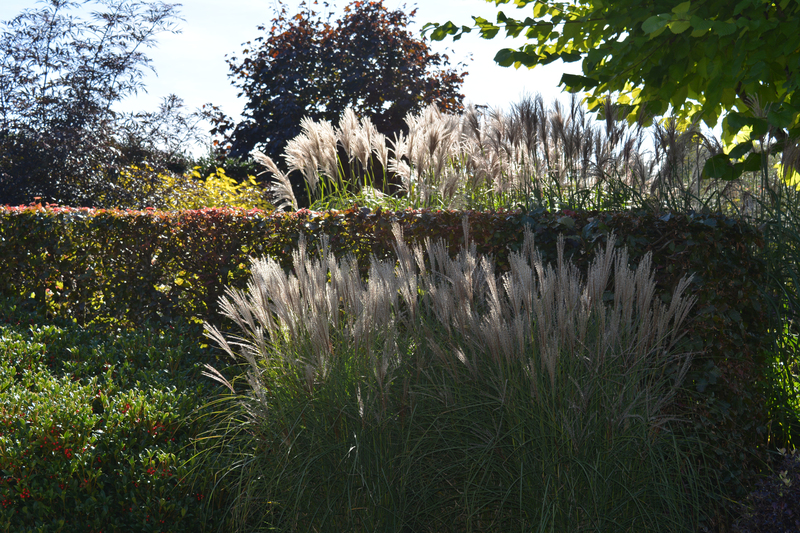 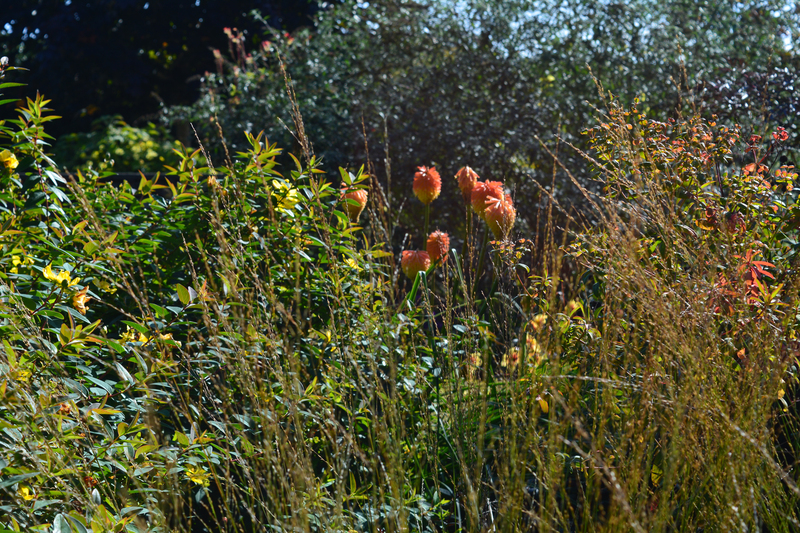 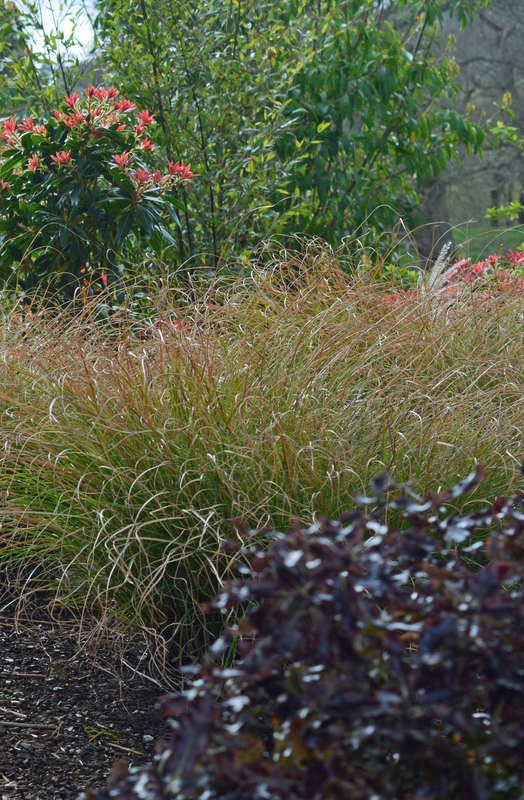 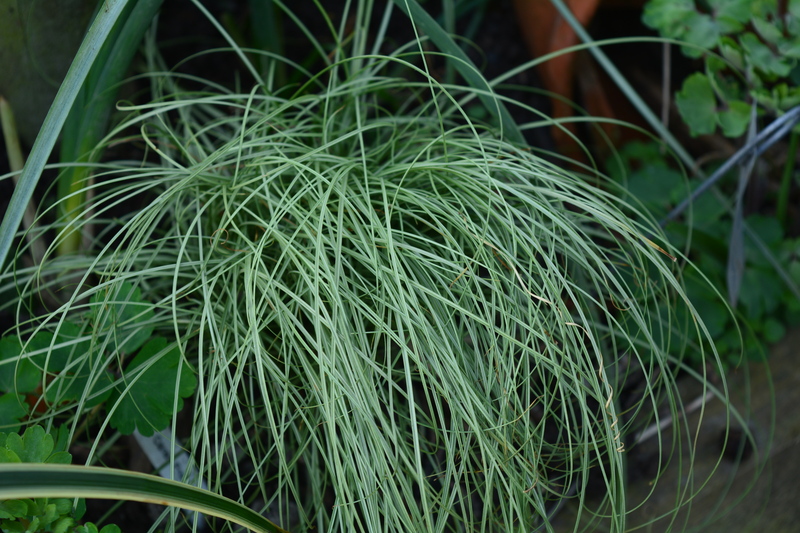 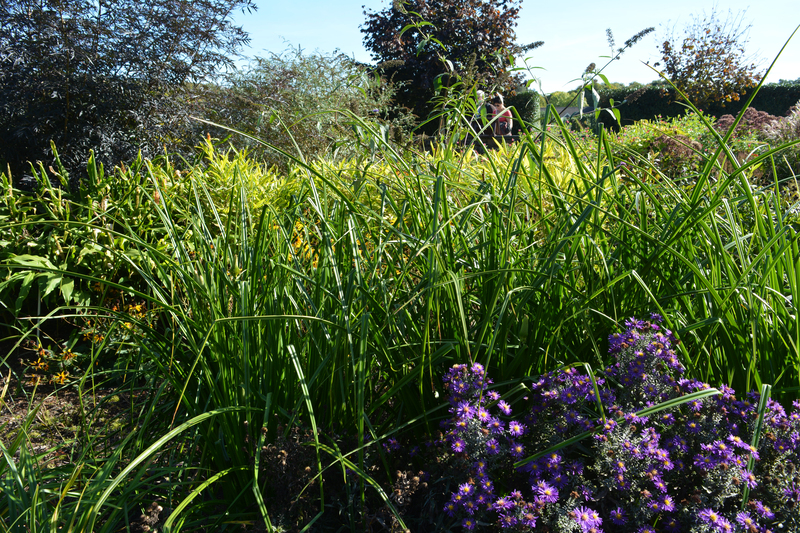 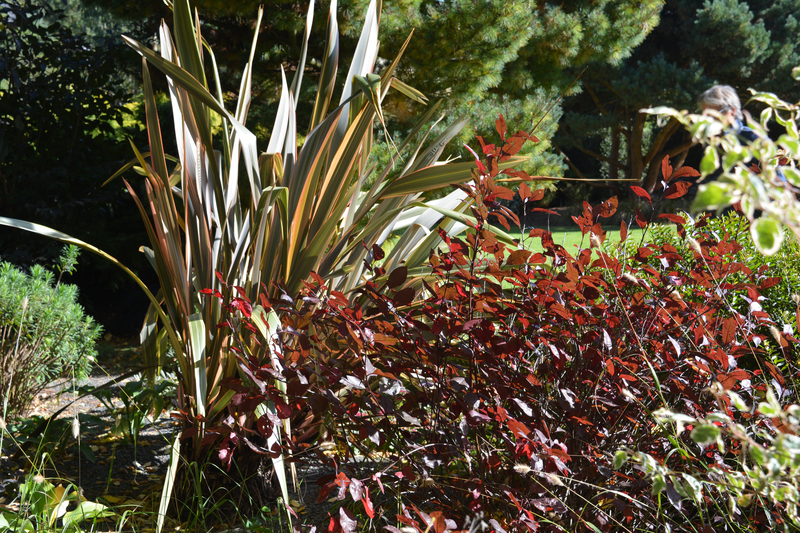 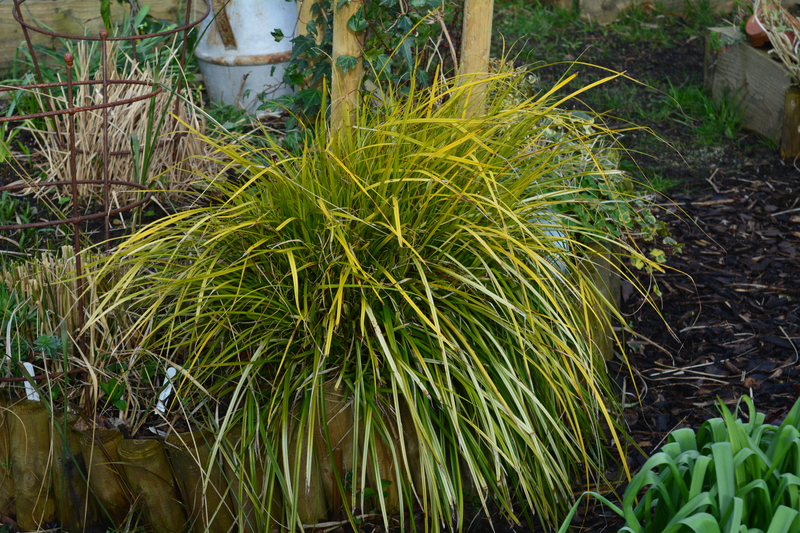 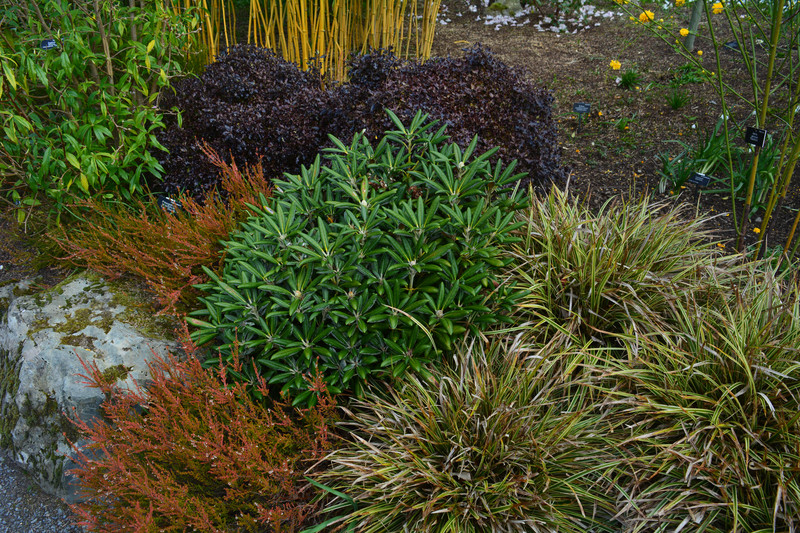 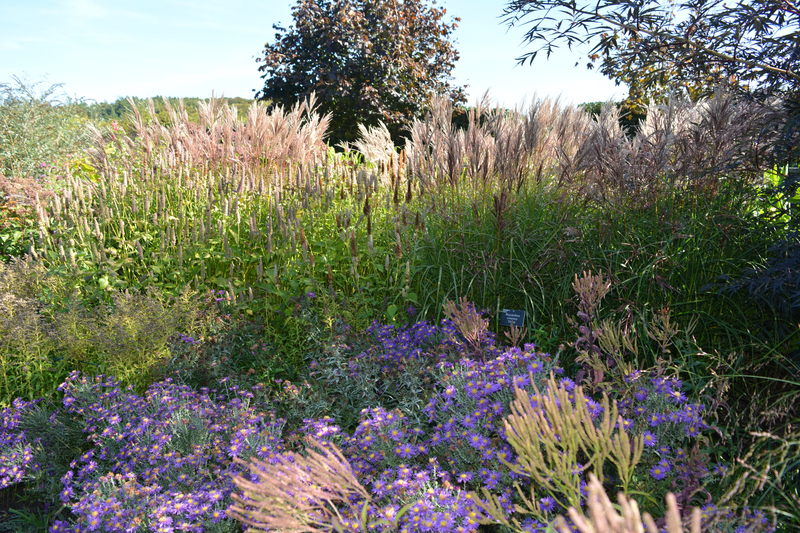 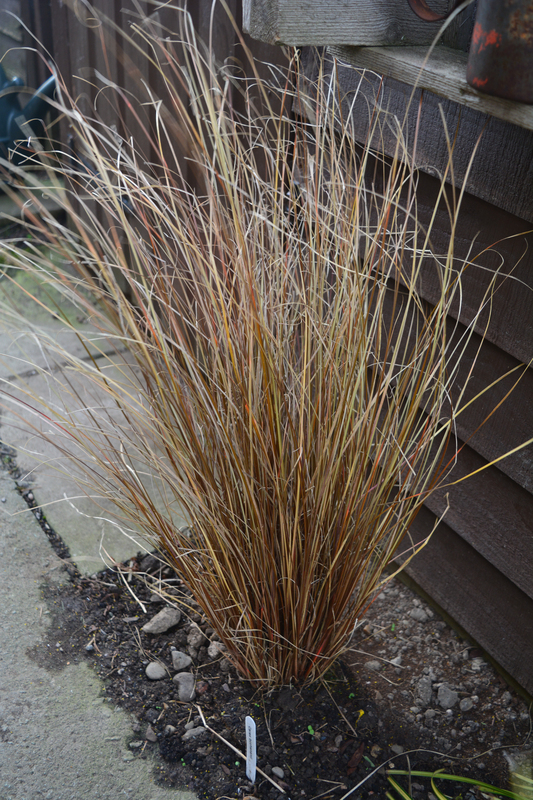 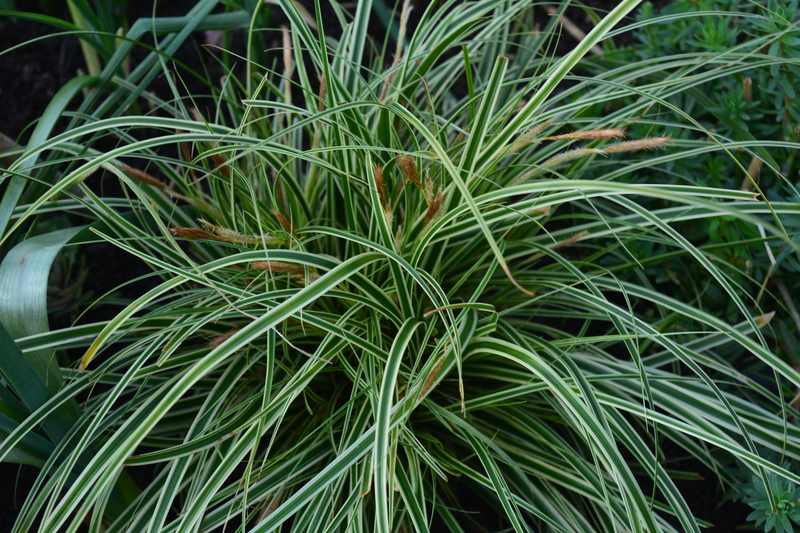 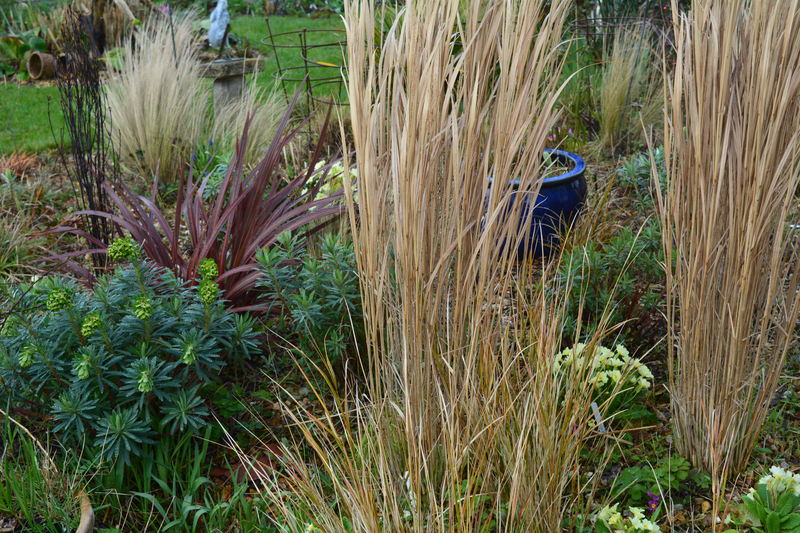 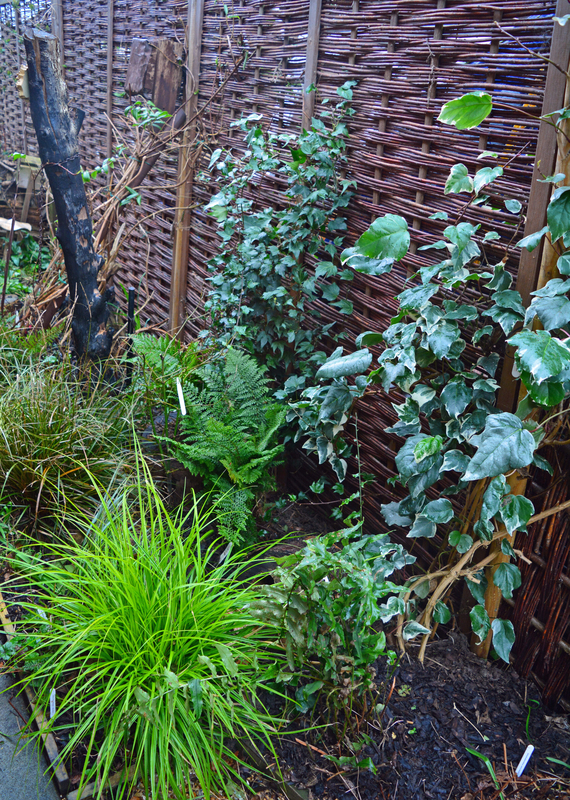 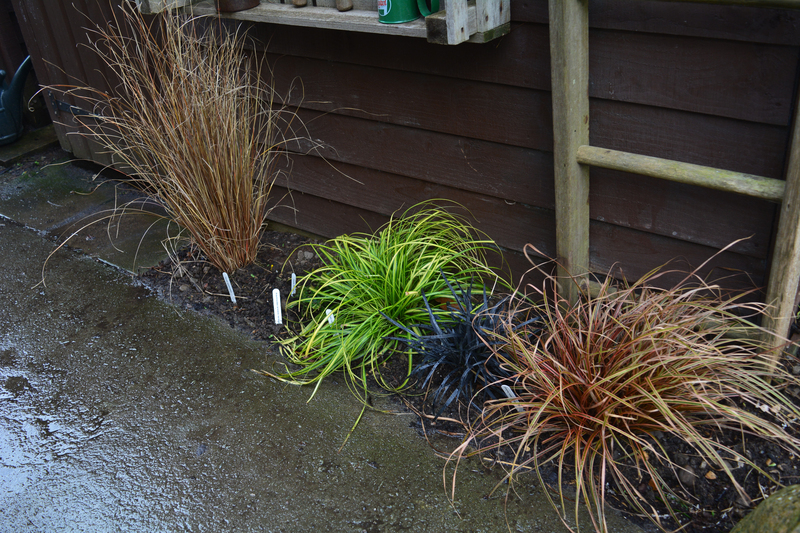 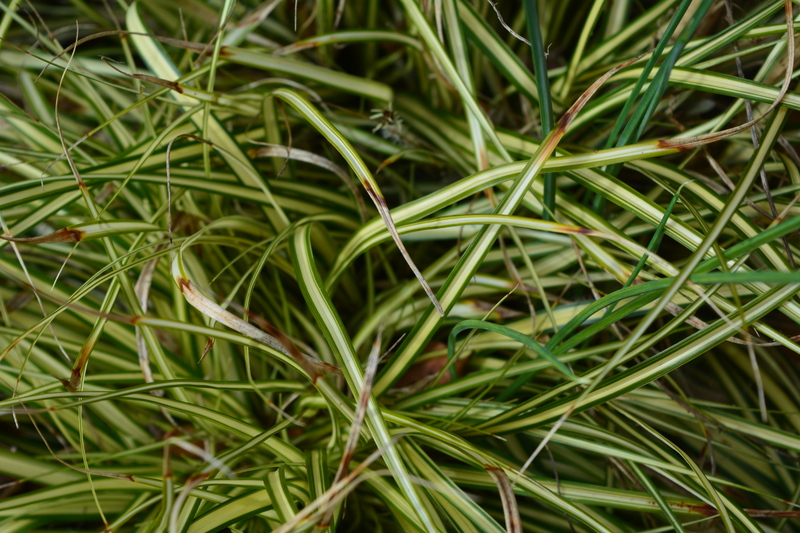 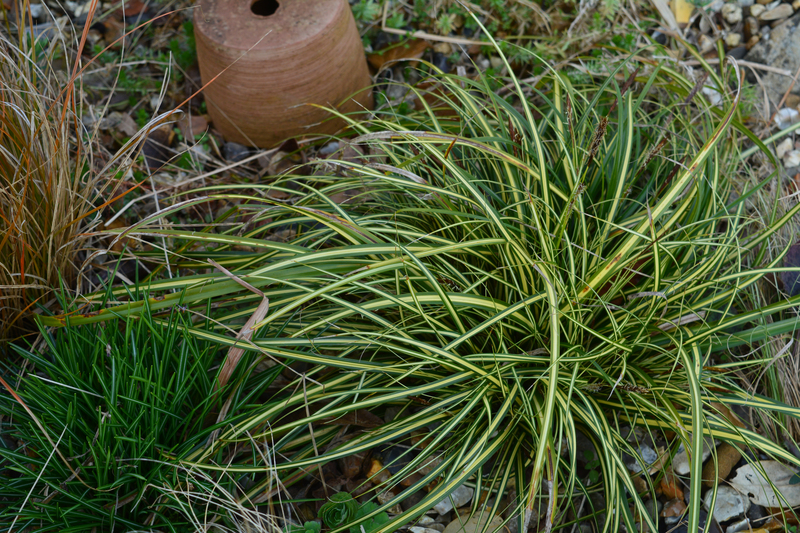 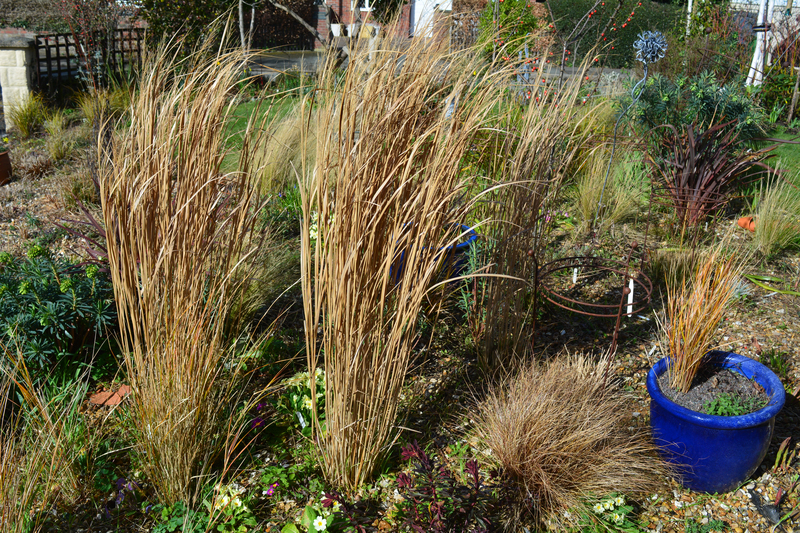 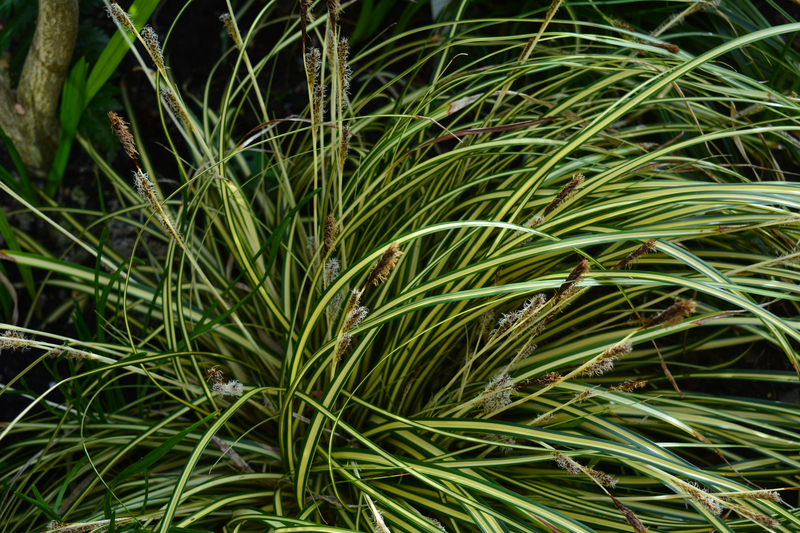 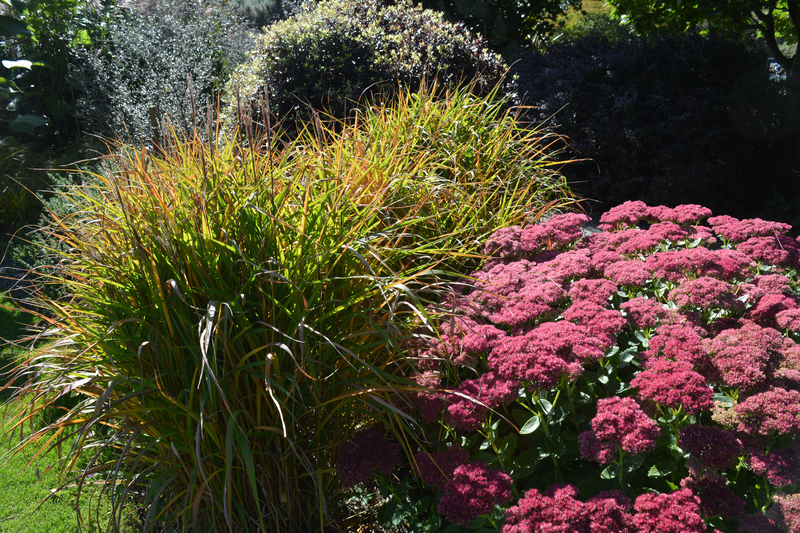 The involvement of ornamental grasses in garden borders can add so much if carefully matched to their partners. 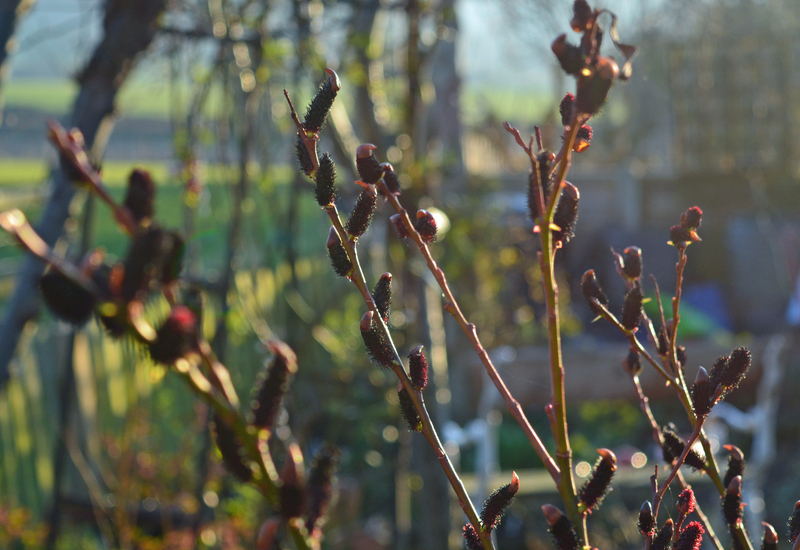 Light catches their seed heads, they wave about with just the slighest of winds and softness of their textures adds touch to the mix of border interest. 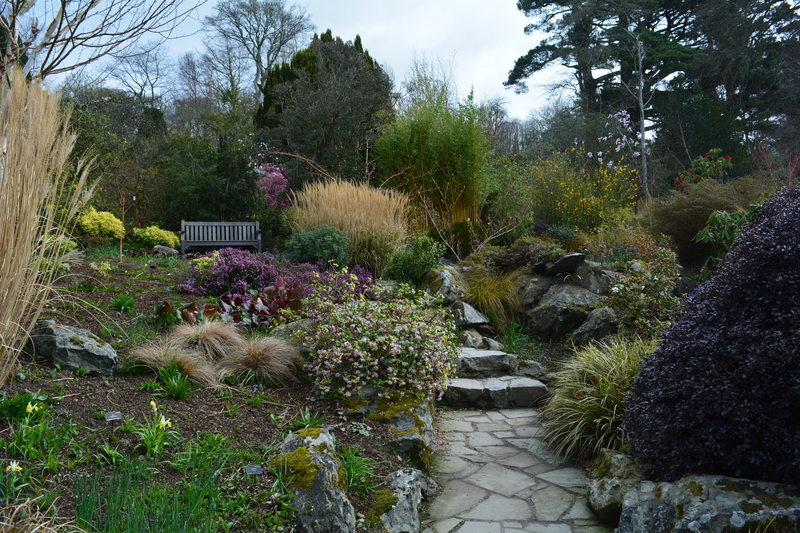 I shall finish with a set of three photos that illustrate the quality of planting and gardening work at RHS Rosemore, a truly great garden full of interest and ideas for us all to take home with us. 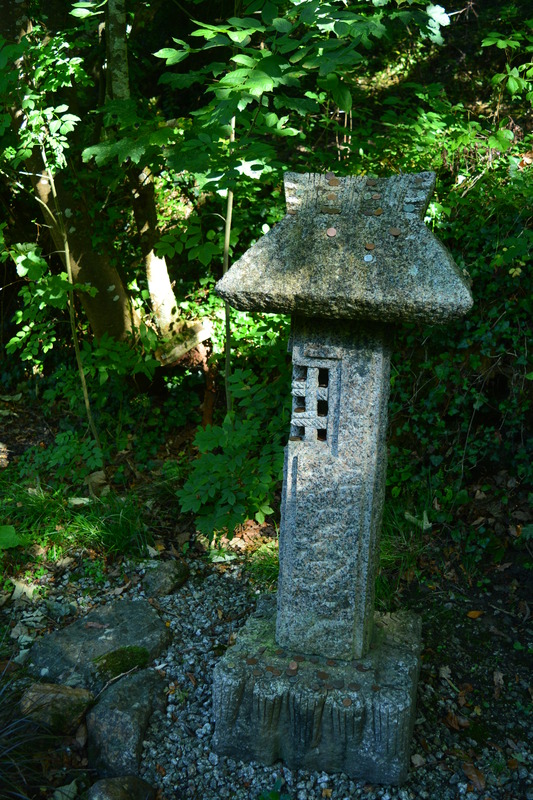 As we left Cornwall after our week’s holiday we spent the morning at The Japanese Garden which was part way back to Devon where we were going to stay for a few days. 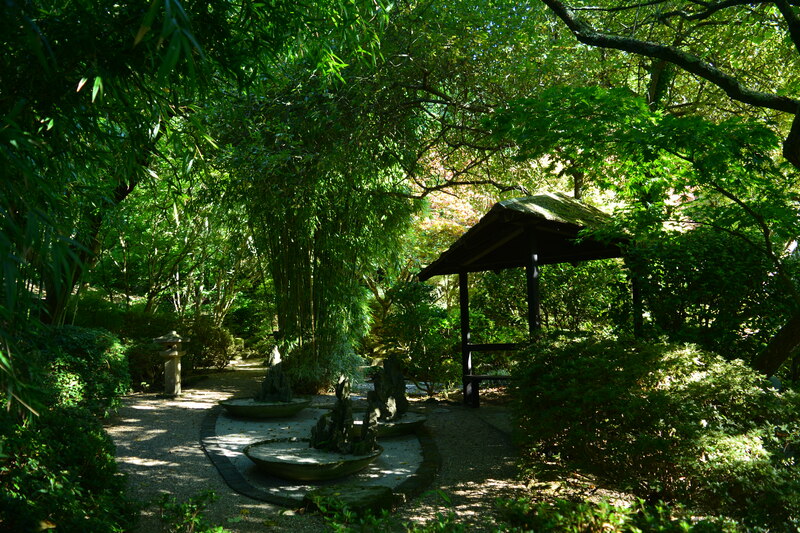 We had visited this garden years ago but could not remember it at all, so it would all be a surprise. 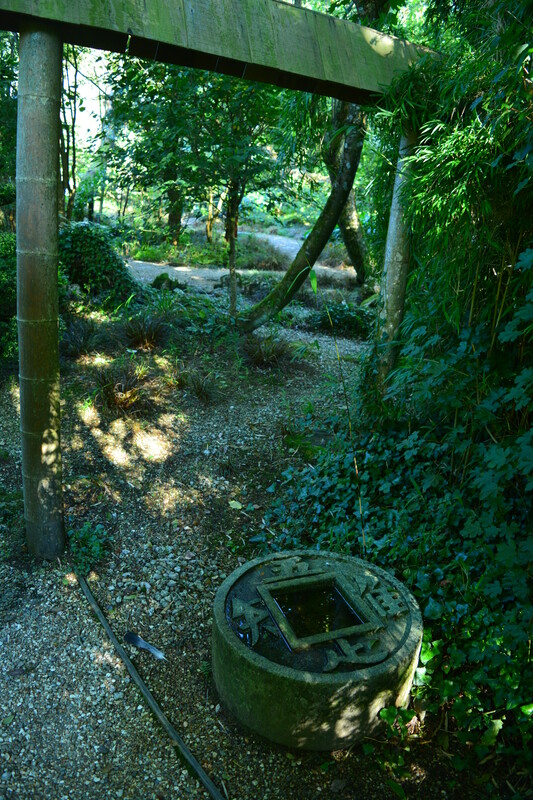 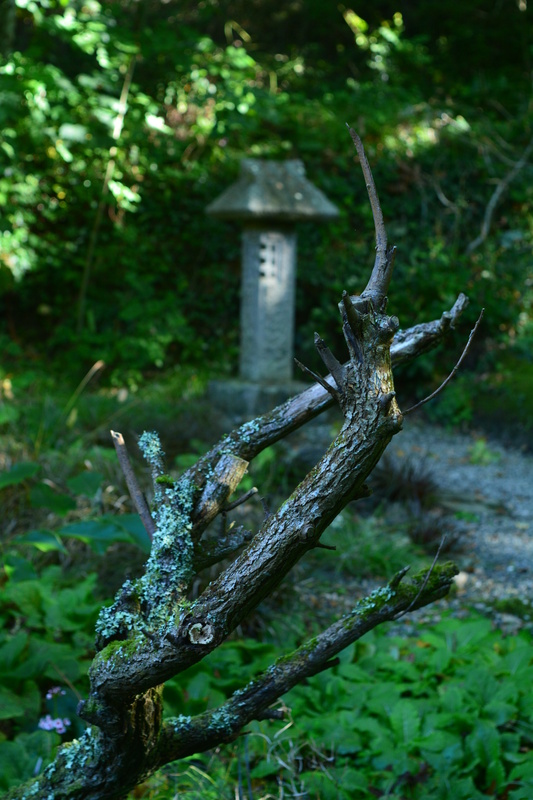 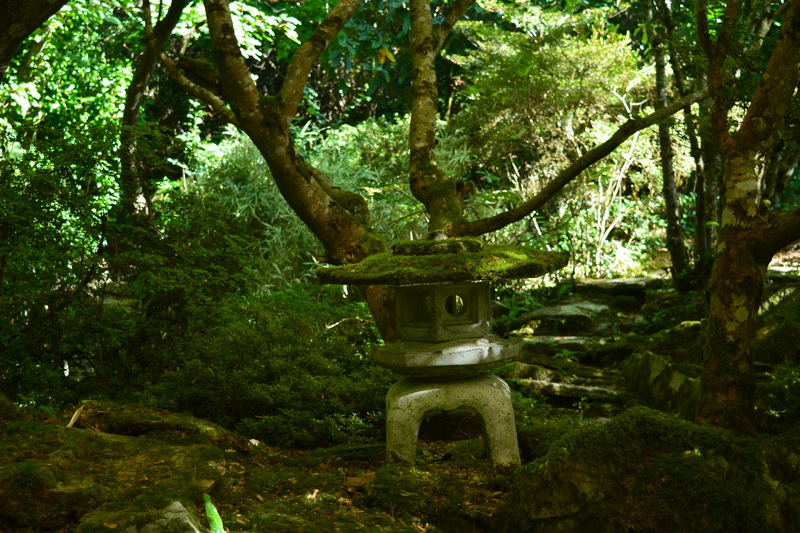 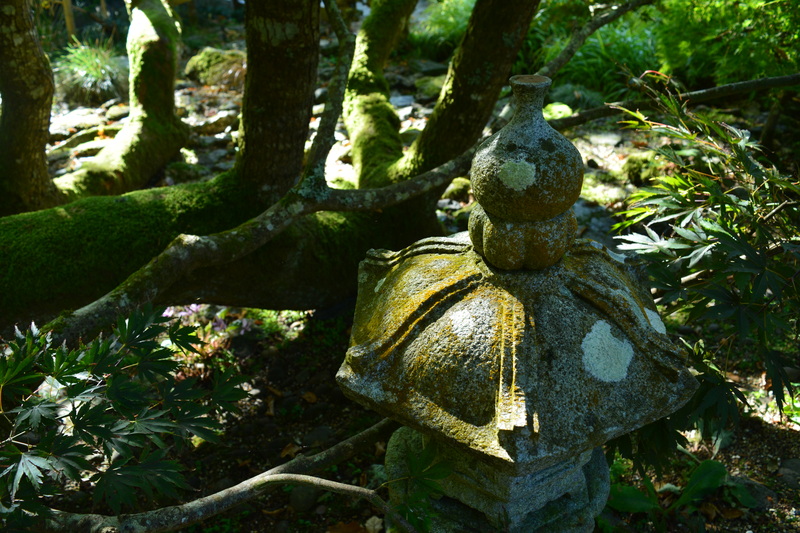 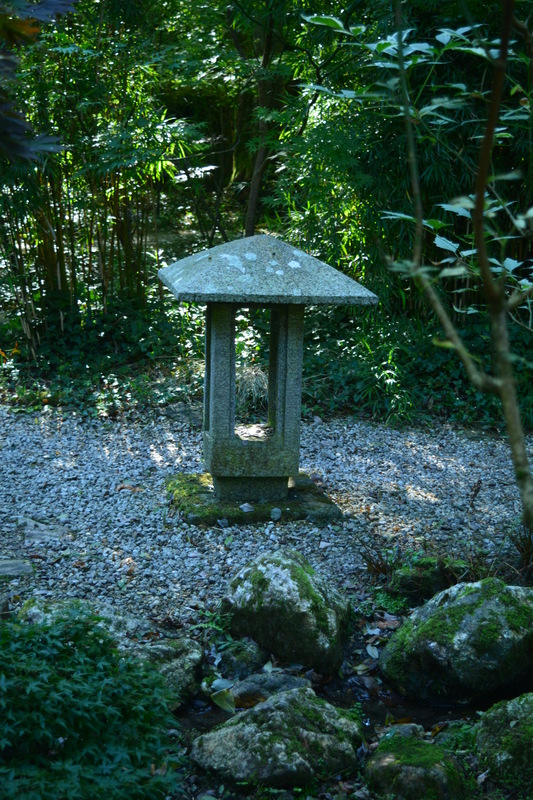 A Japanese gardens has certain elements that make it a Japanese garden, a feeling of welcome, topiarised trees and shrubs, stone sculptures often in the form of lanterns, beautiful calm vistas, paths to invite calm slow wandering and moss in abundance, plus of course that essential water. 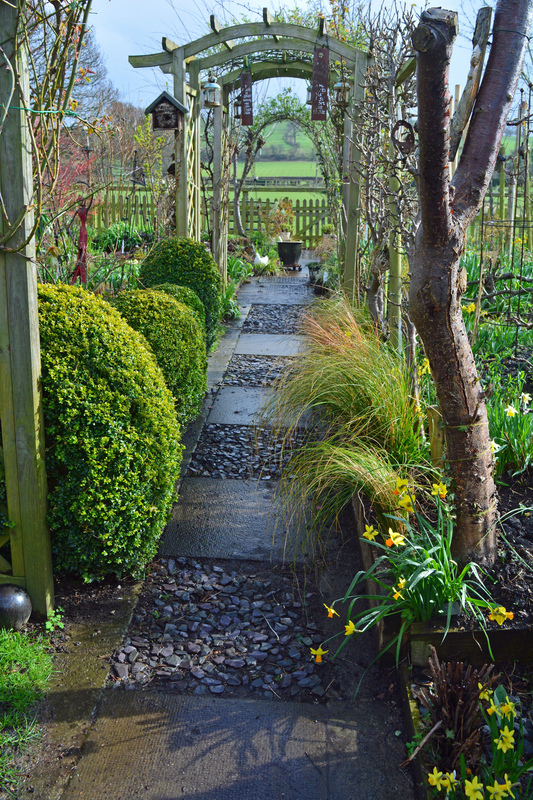 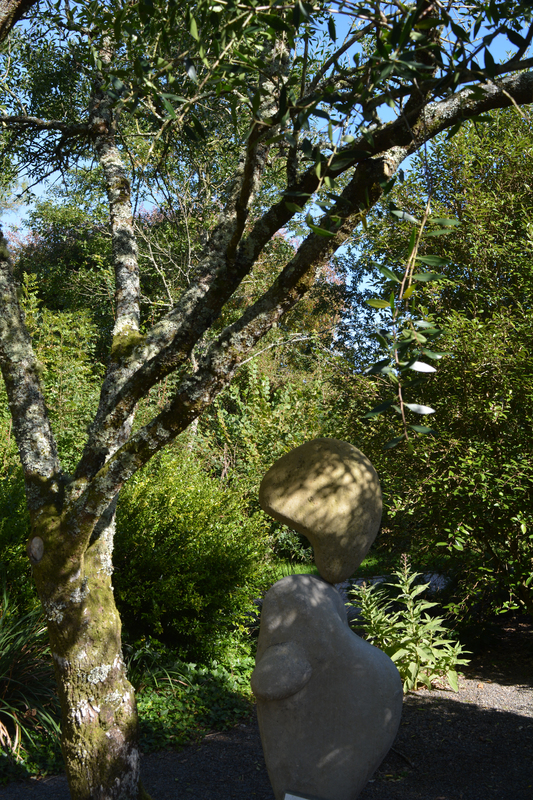 Let us begin at our Cornwall garden to see if it gave us a warm welcome, and see if there were areas that gave us the right feeling of calm and peace. 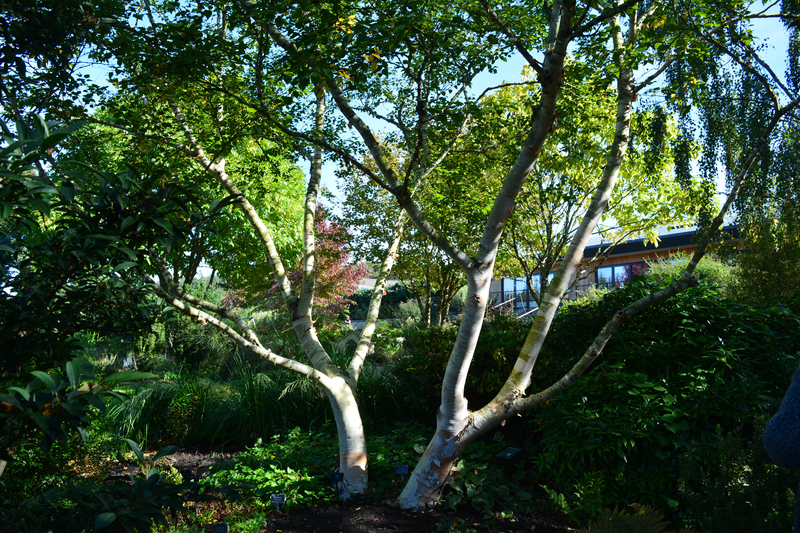 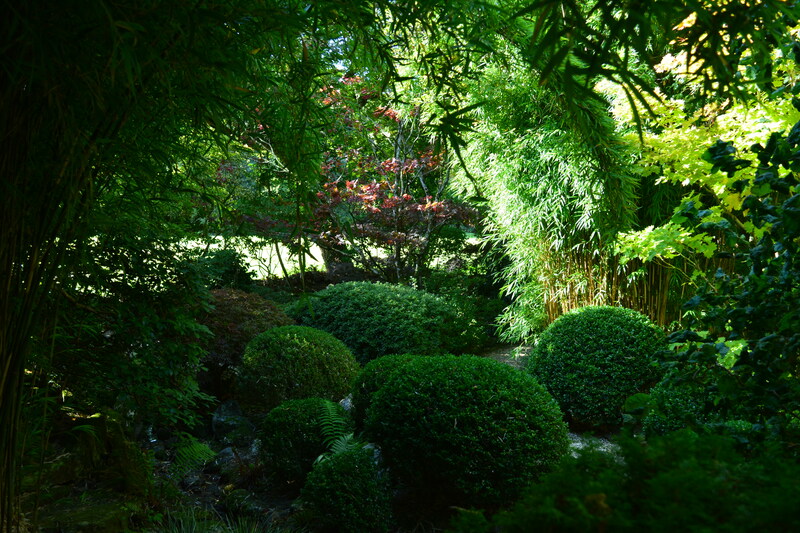 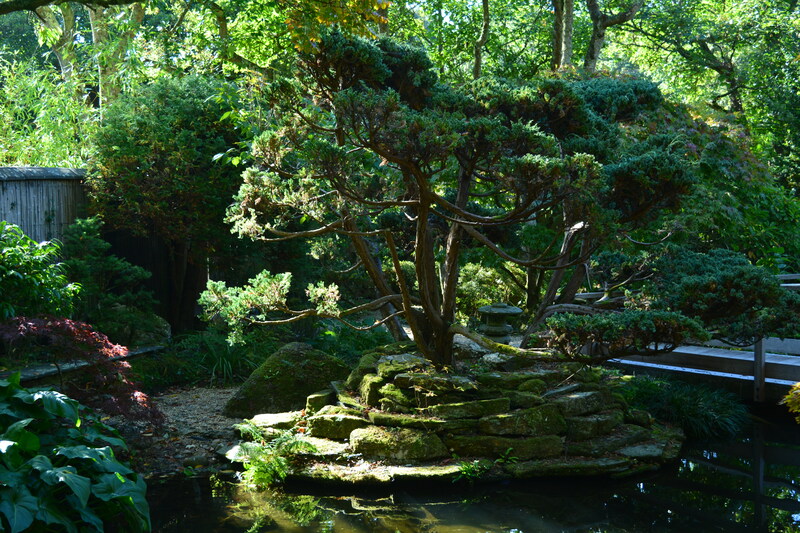 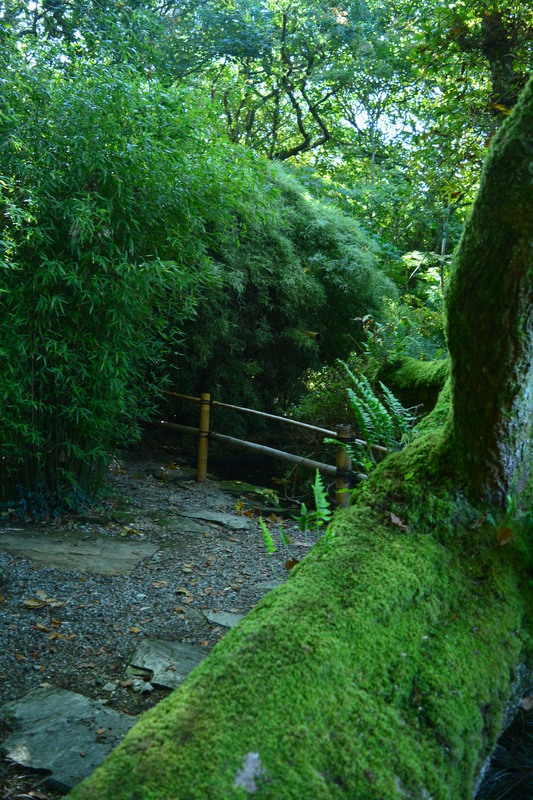 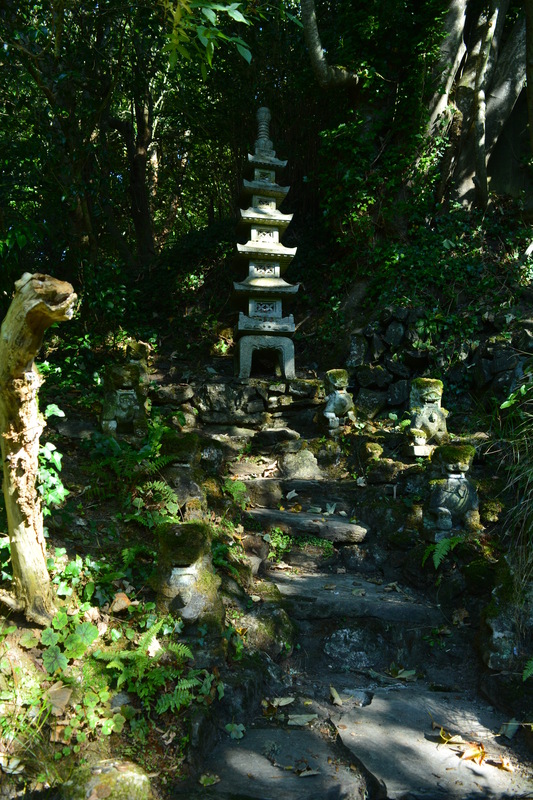 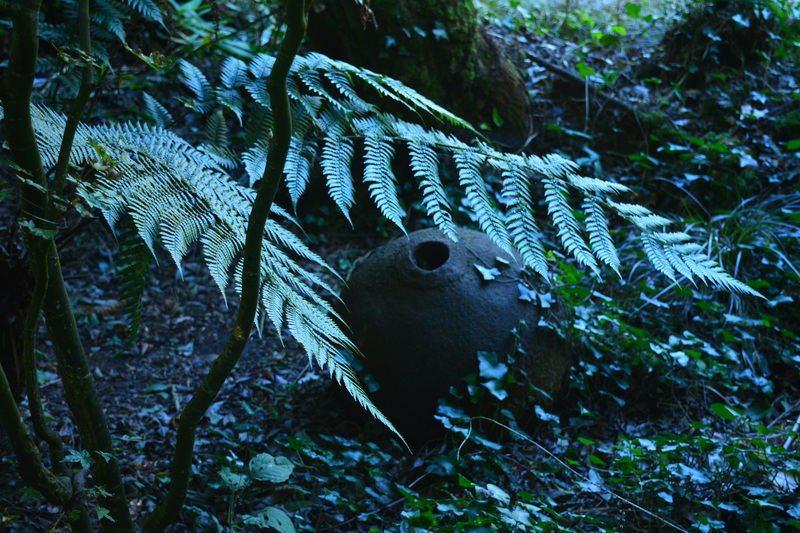 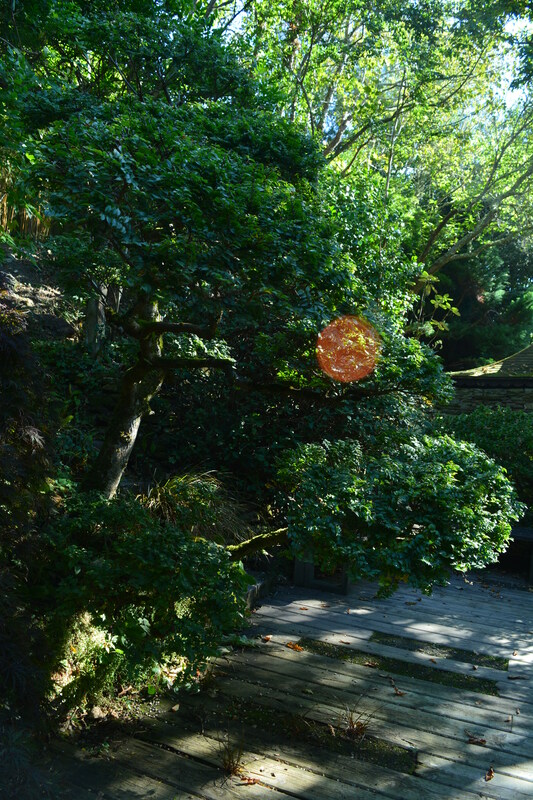 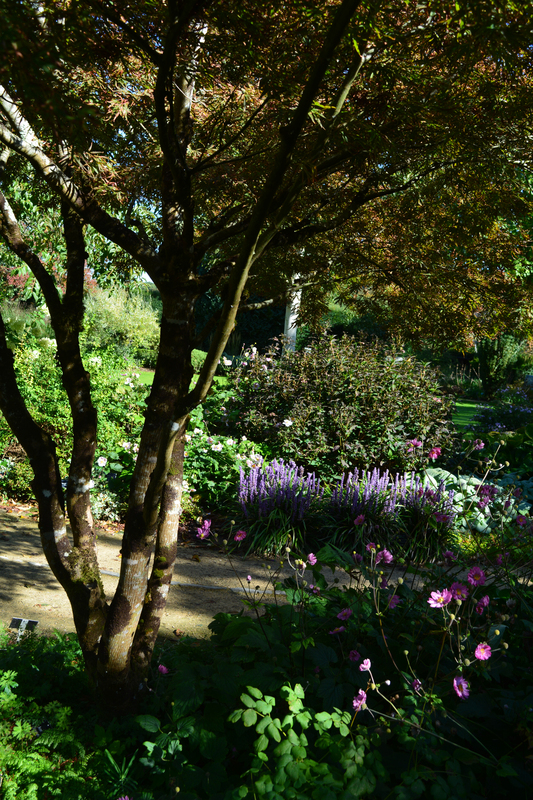 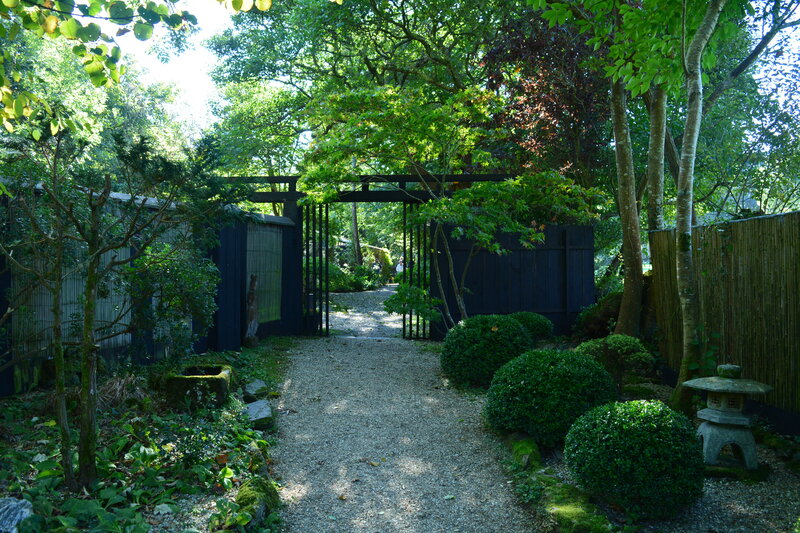 Throughout this look at the Cornwall Japanese Garden you will notice how powerful the sense of light and shade can be in creating an atmospheric garden. 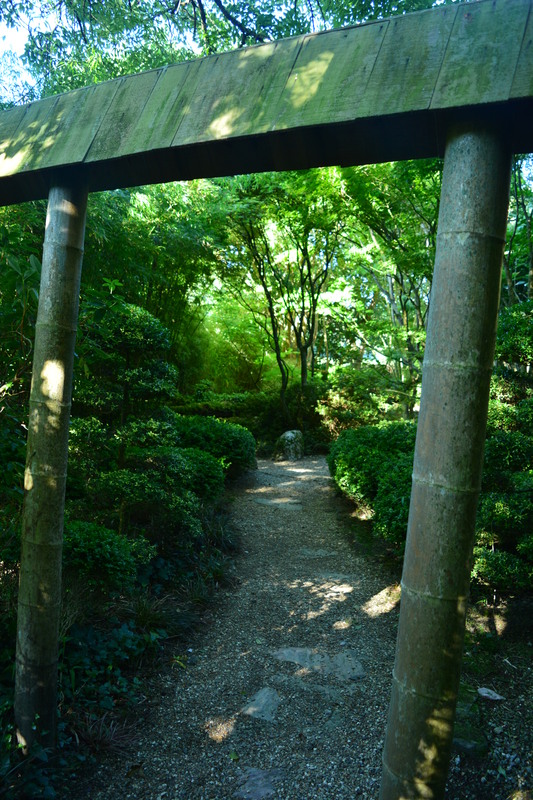 Peaceful areas appeared regularly at the end of winding paths or through archways. 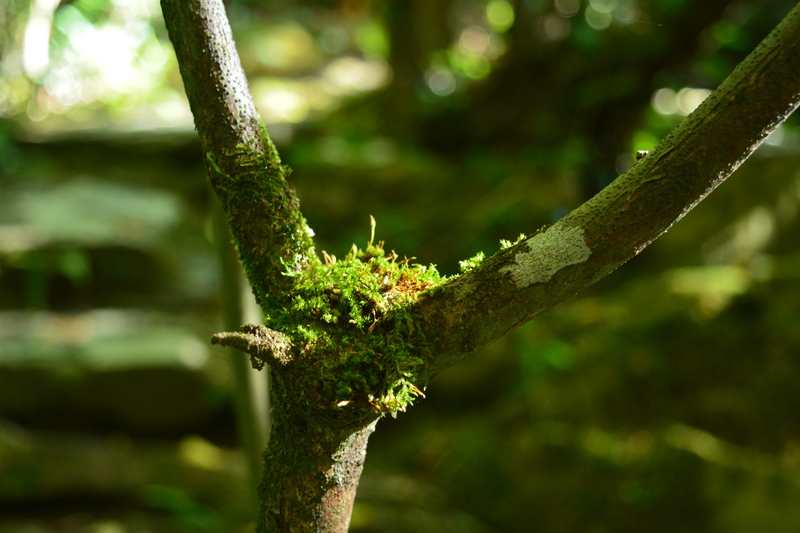 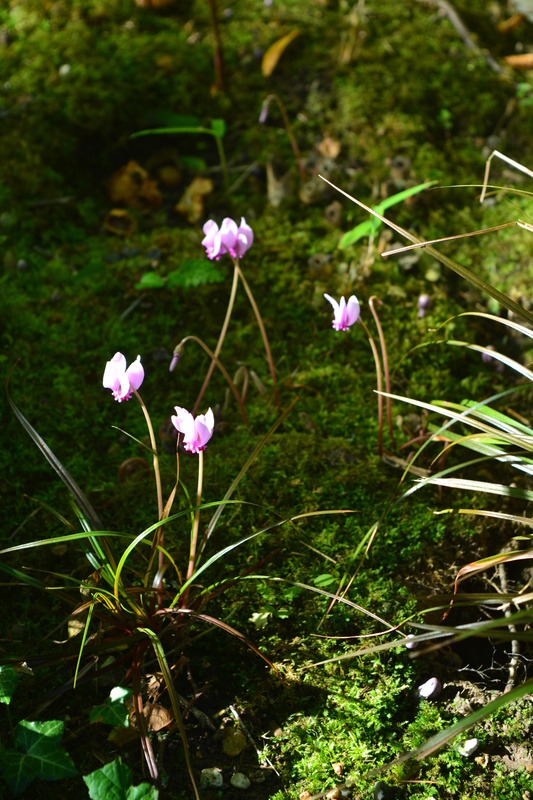 Moss featured here as groundcover or growing on branches and tree trunks in the damp atmosphere. 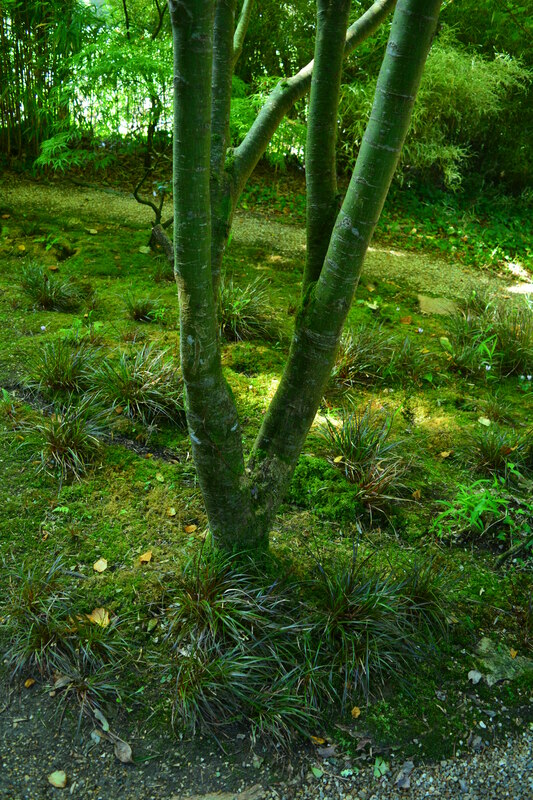 These patches of moss either on the ground or aerial are great for wildlife especially as they are always moist. 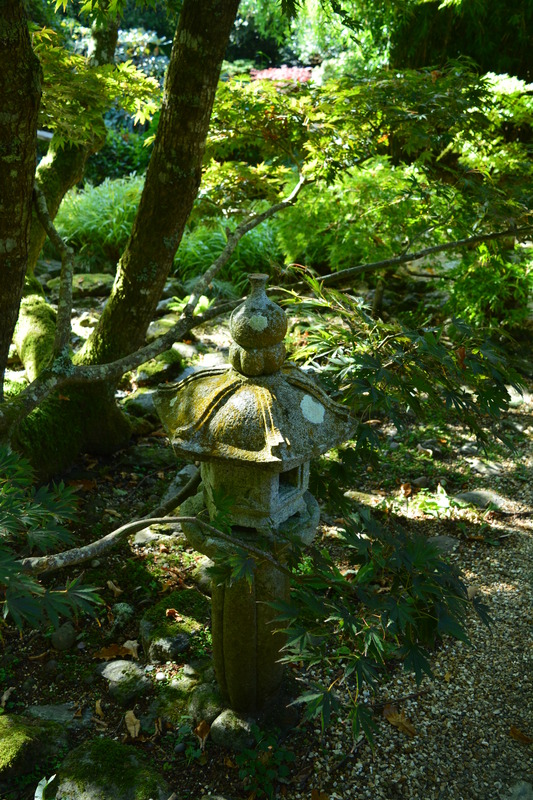 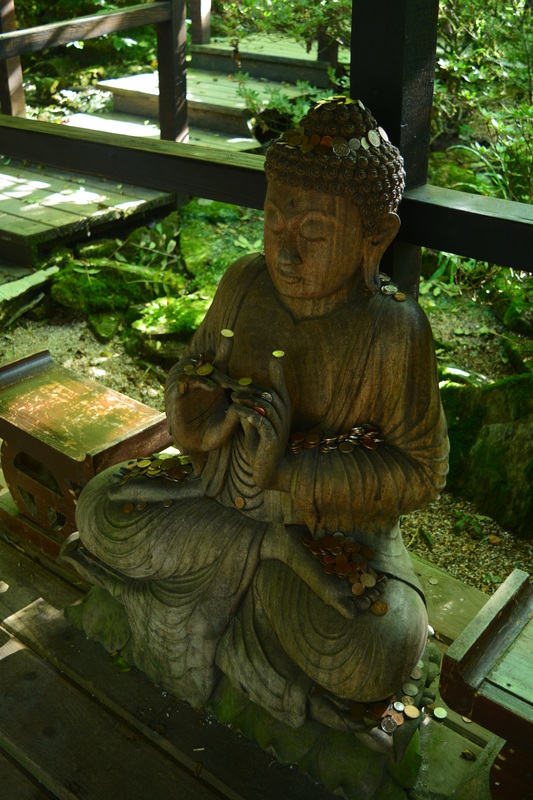 Overall wildlife feels happy in Japanese gardens in the UK, and effecively act as predatorial pest controllers. 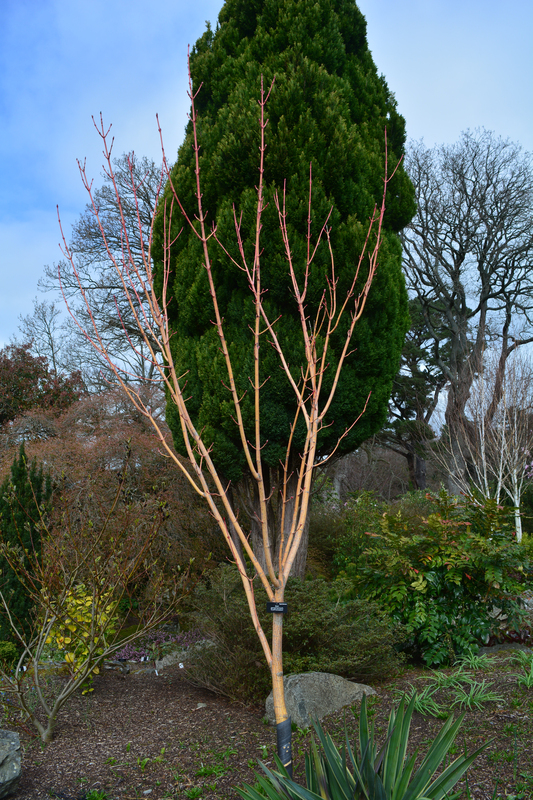 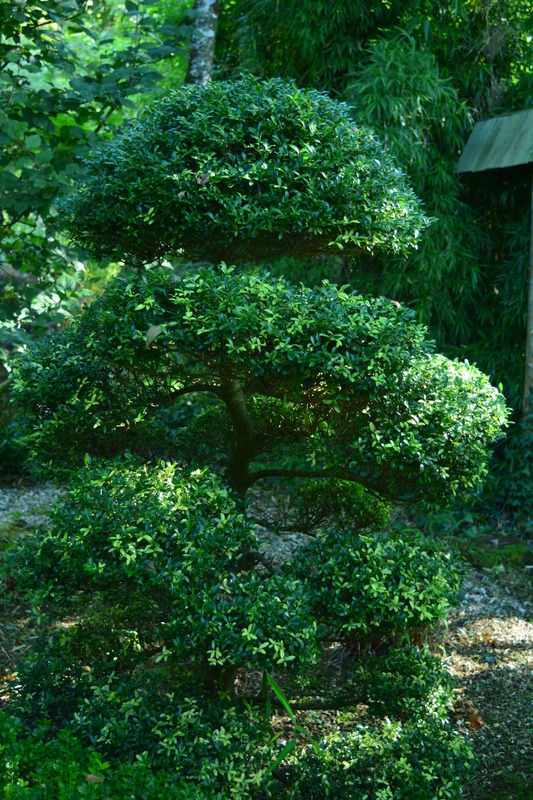 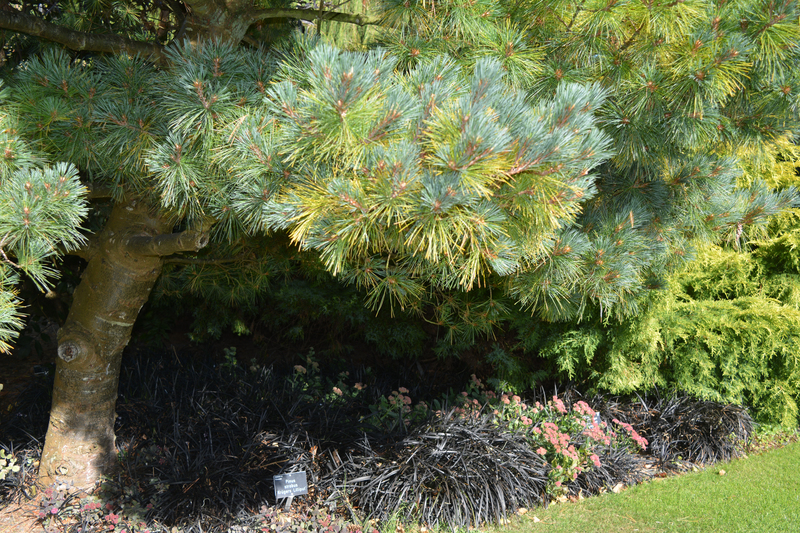 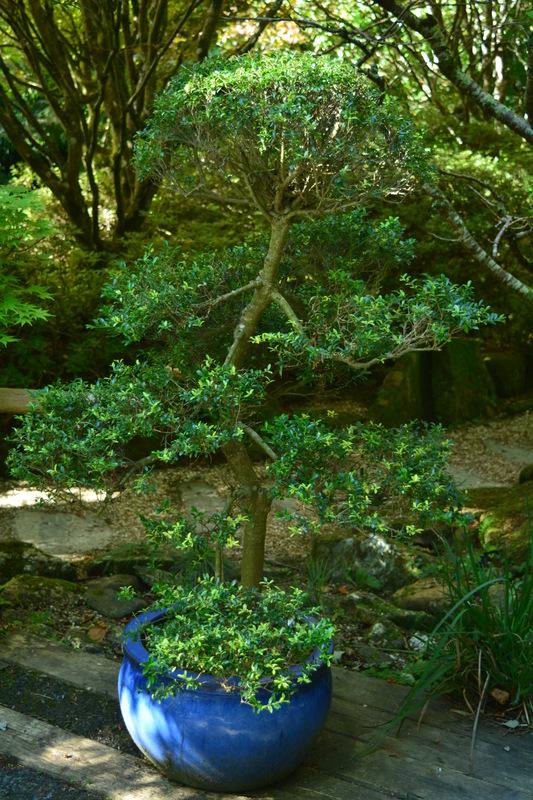 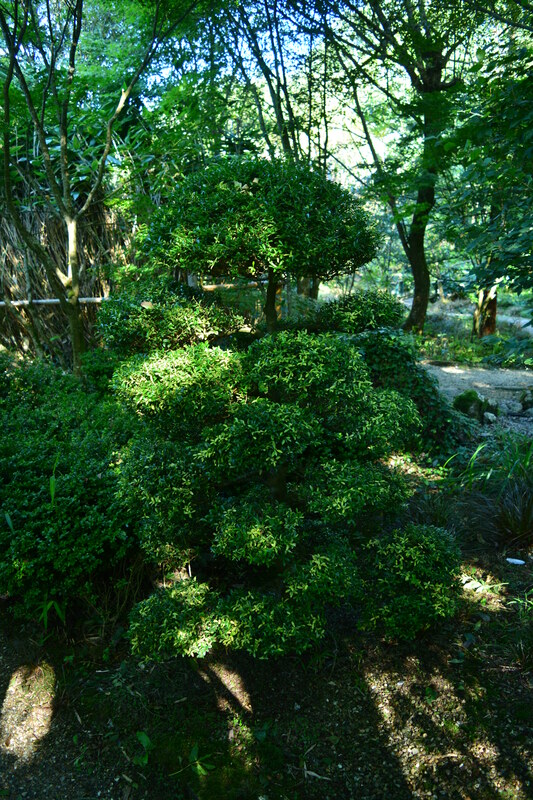 Training trees is an ancient Japanese art practised for centuries by Japanese gardeners following set rules using coniferous ans deciduous trees alike. 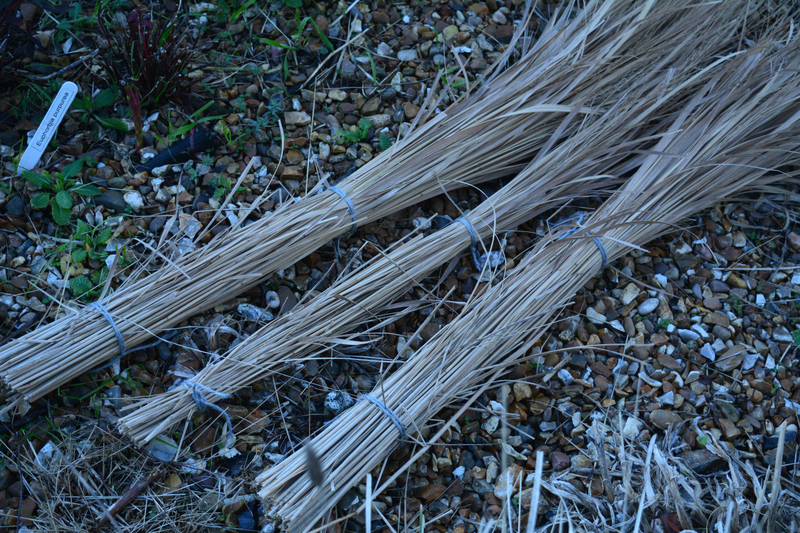 It is a skill just coming into being in 21st century Britain. 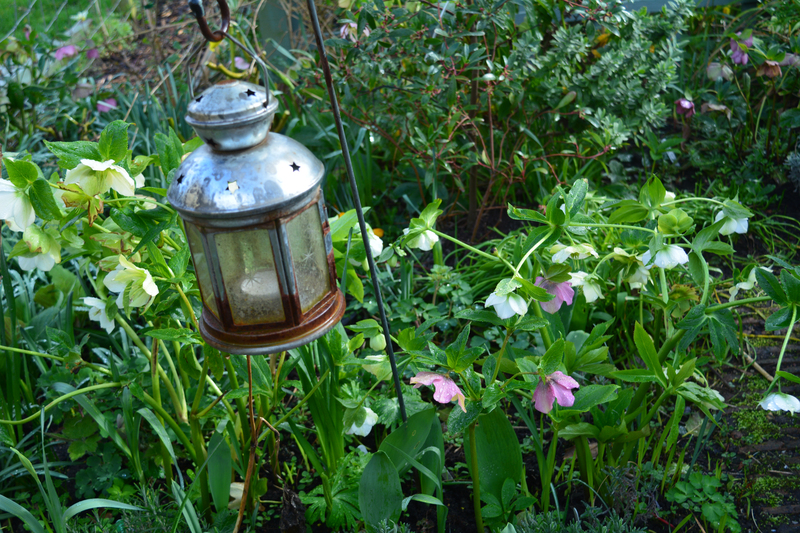 I love using it in the garden! 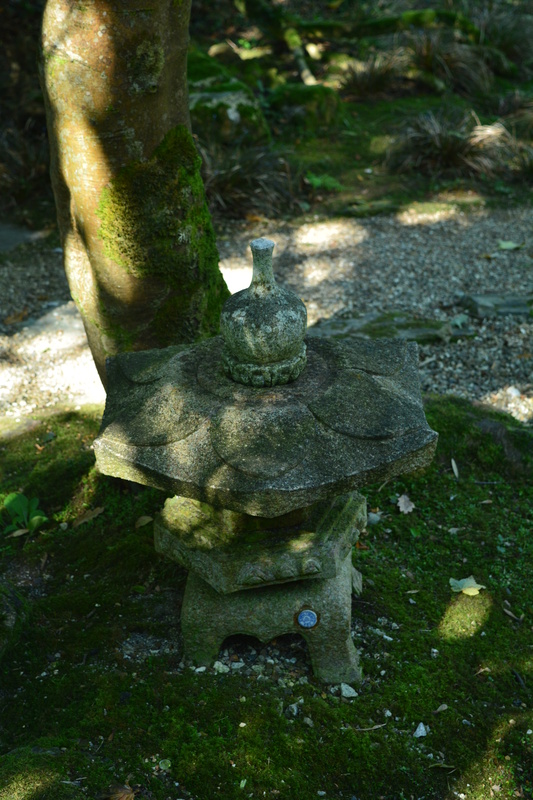 Stone sculptures were visible throughout including many forms of lantern. 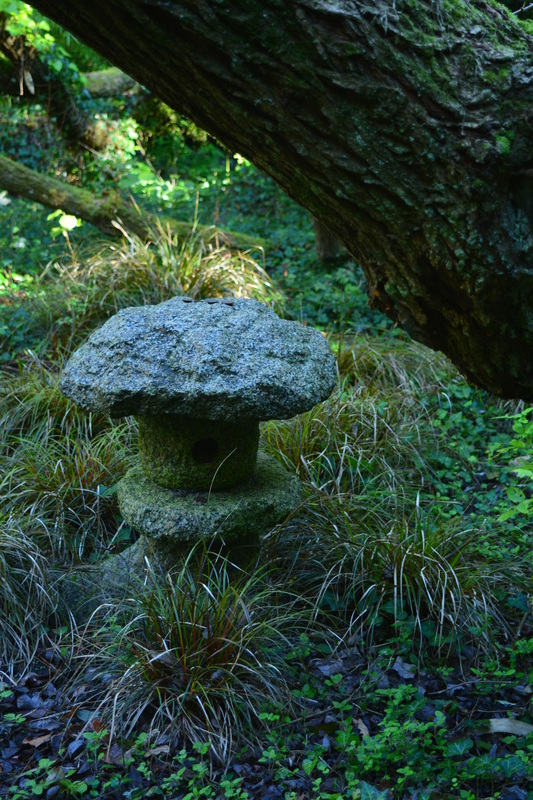 We use a few of these in our interpretation of a Japanese garden her at home in our Plealey patch. 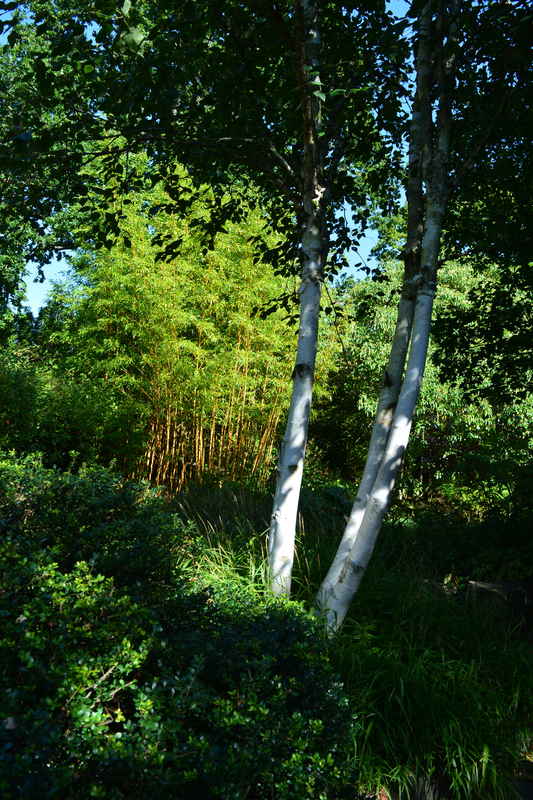 Bamboo of course is another essential element of any Japanese garden, either growing in its many forms or used as a fencing or building material. 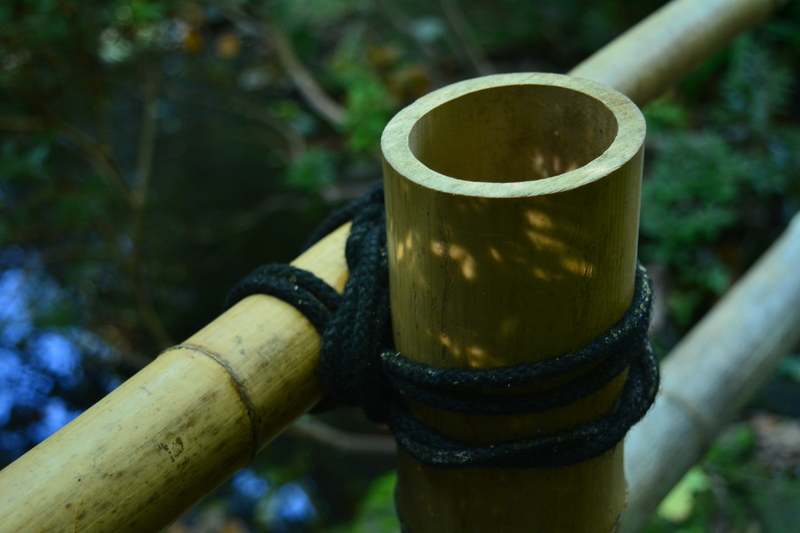 It is beautiful and structural whichever way it is used. 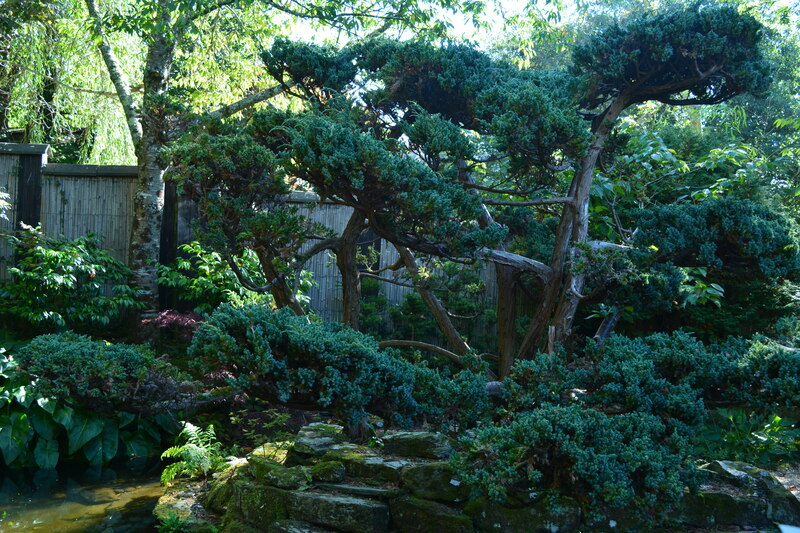 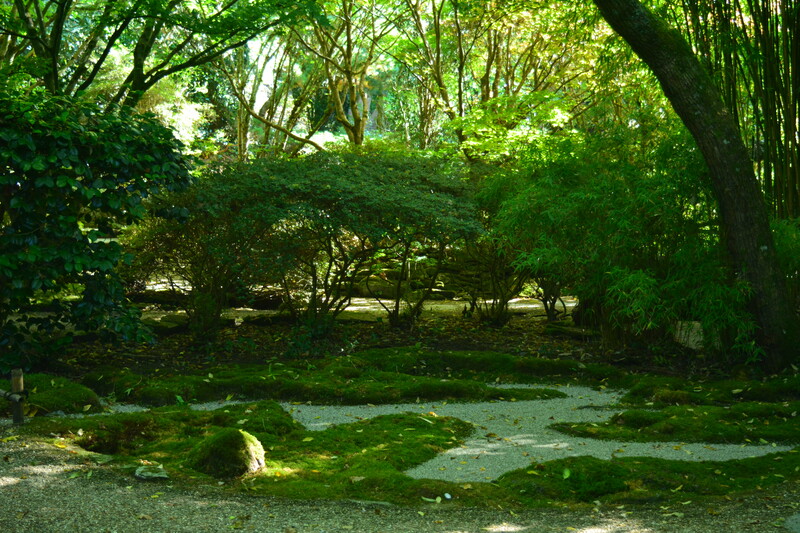 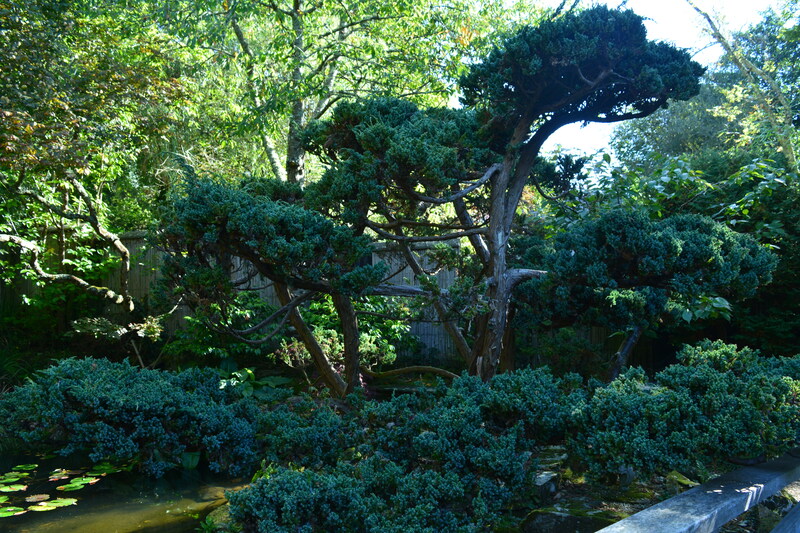 I hope you have enjoyed this little tour of the Cornwall Japanese Garden as much as we did. 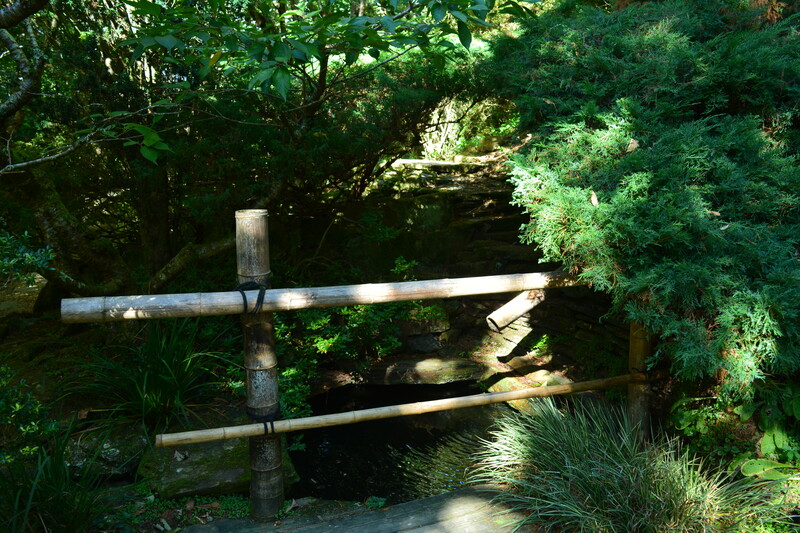 There is so much Western gardeners can learn from Japanese garden design and from the skills of Japanese gardeners. 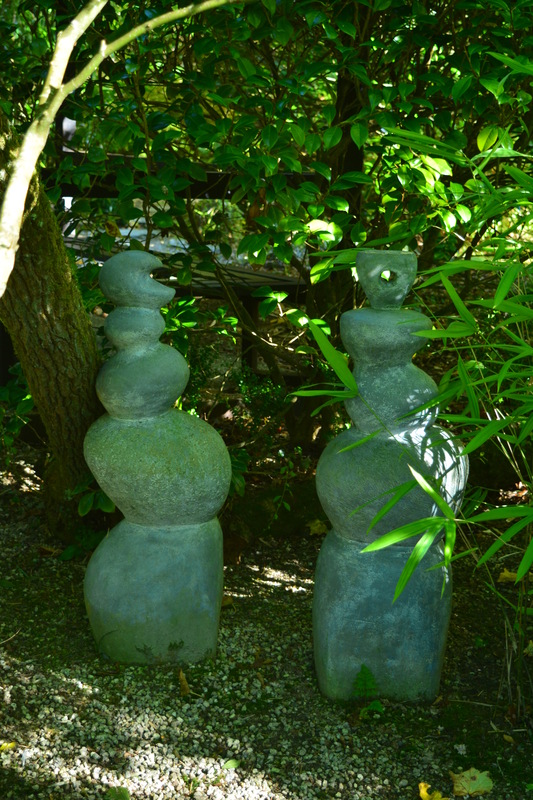 They can teach us a lot about creating peace and harmony in our gardens.